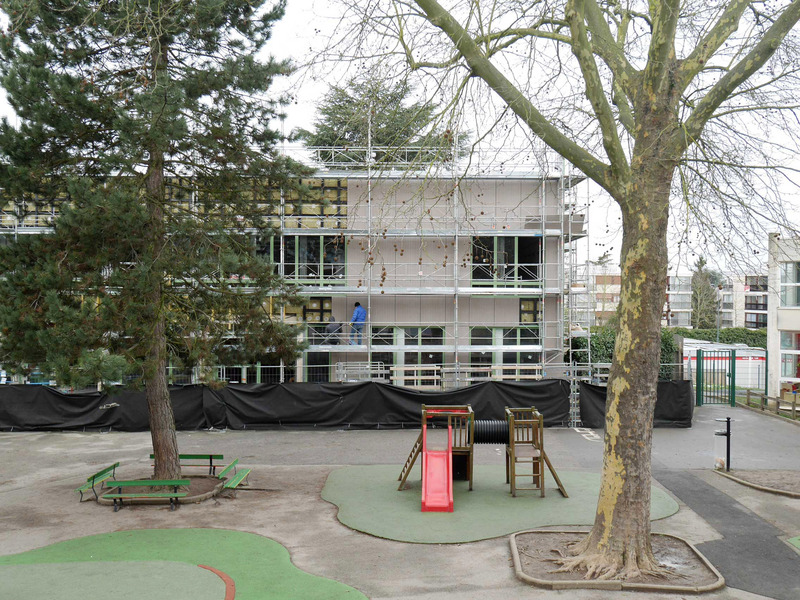 Through its position, the new building will complete the school complex while reworking its main entrance. 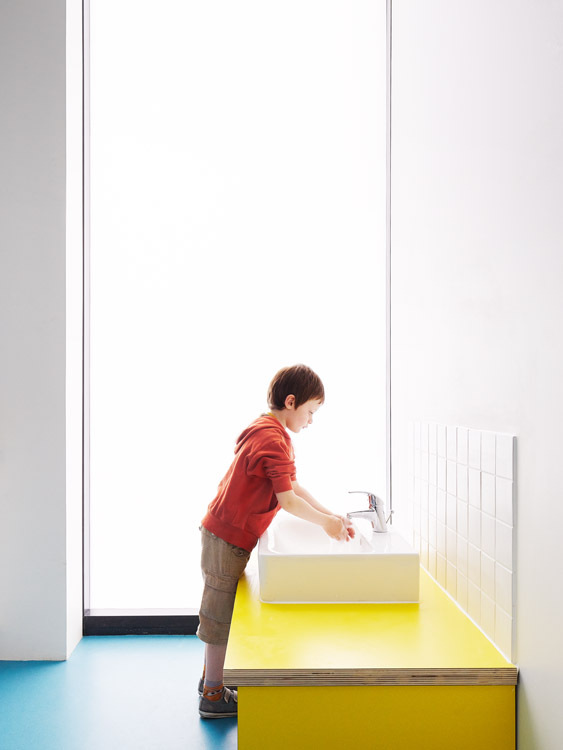 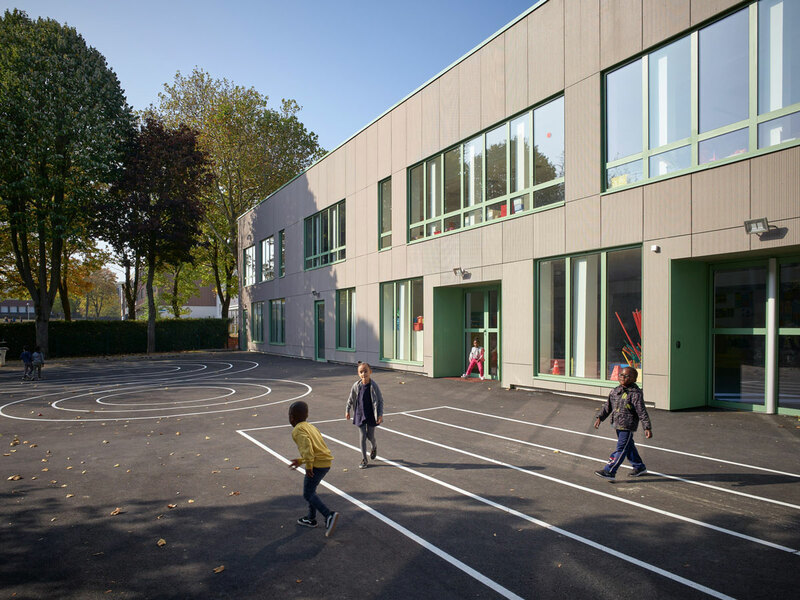 Imagined as an element inserted into its river and railroad territory, the building is placed on a base that will permit the children to avoid too great exposure to the street while transforming the constraint induced by the level of the highest water into a project opportunity. 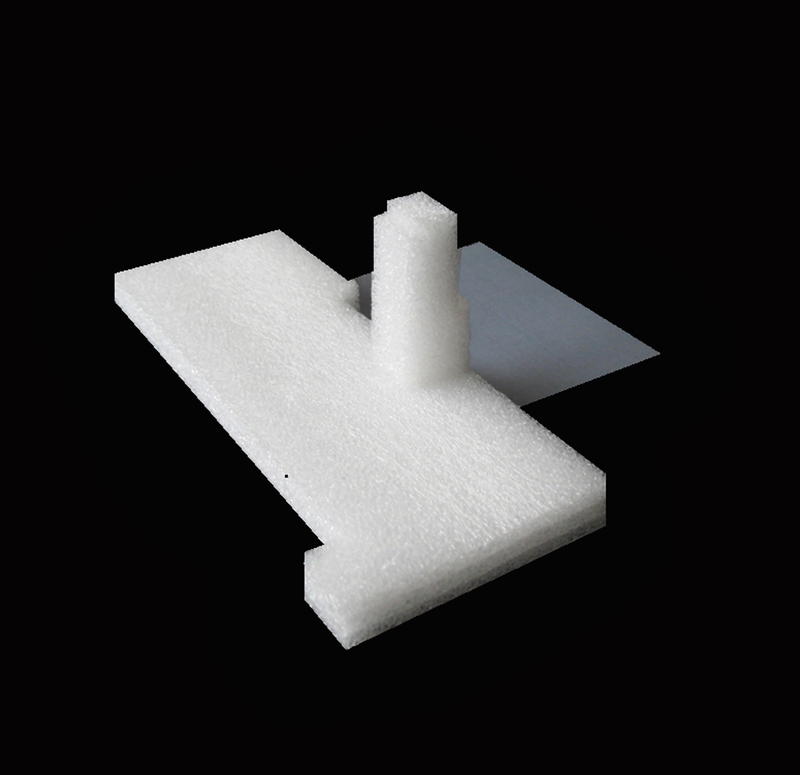 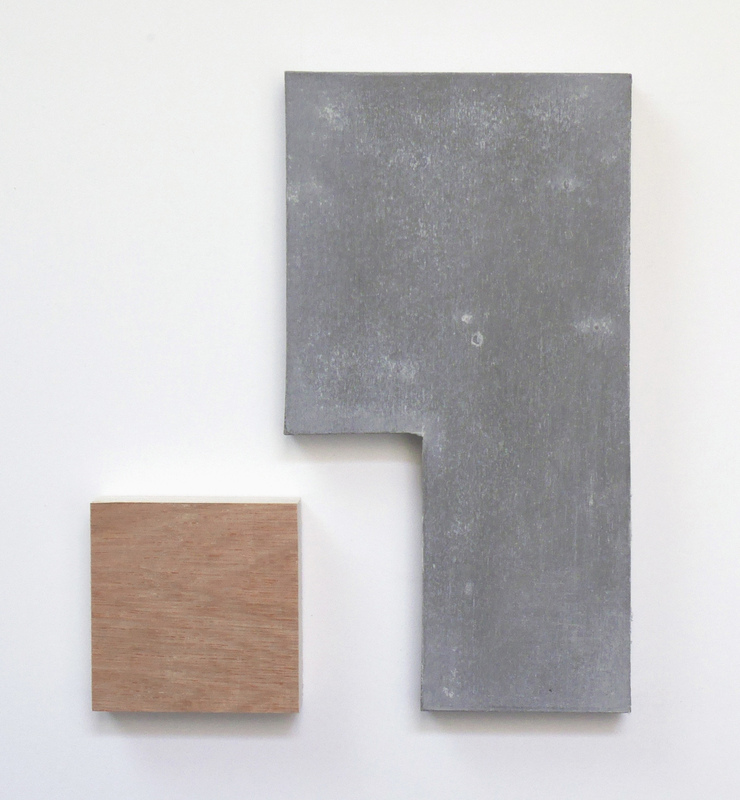 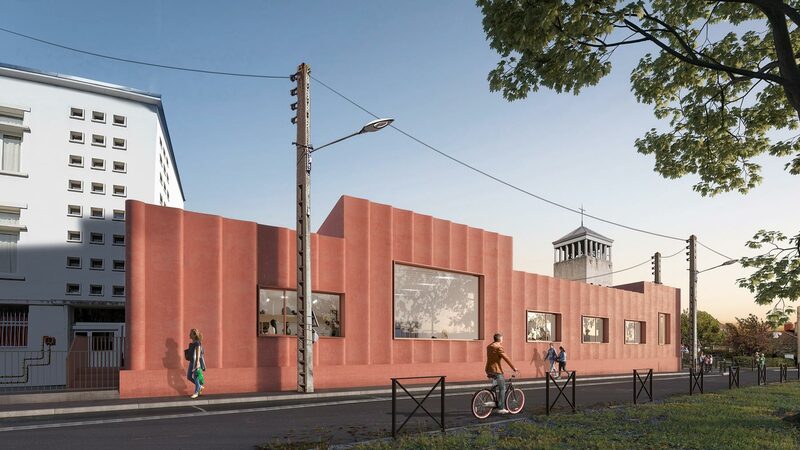 Its architectonic concrete envelope is considered an element that is both protective and one that changes the image of the different temporalities and is connected to nearby activities. 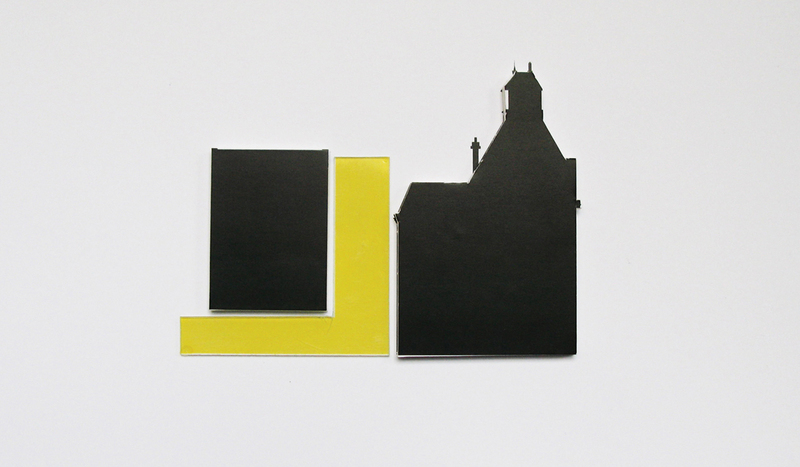 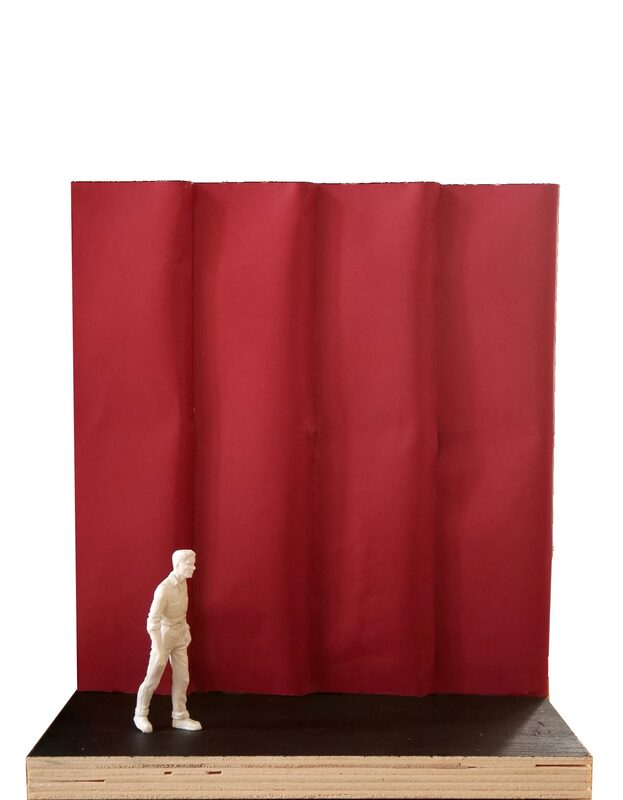 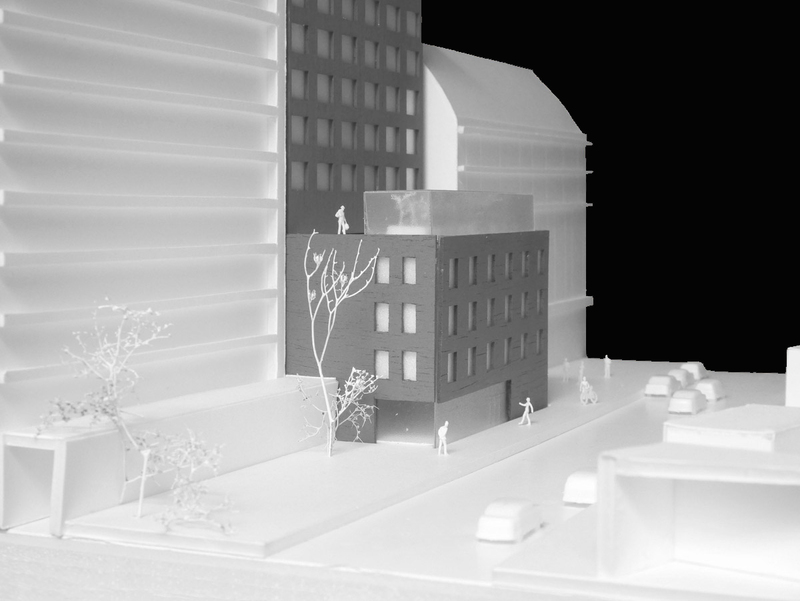 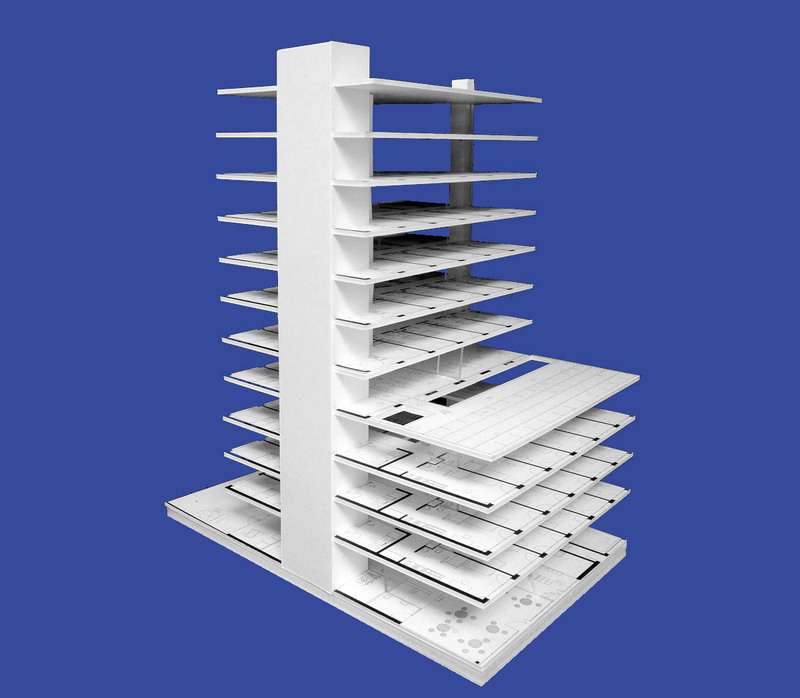 The Cinquante-Six project emerged from the dualities characterizing a context that was materialized by the juxtaposition of a high building and a low building negotiating between the scale of the street and the scale of the city. 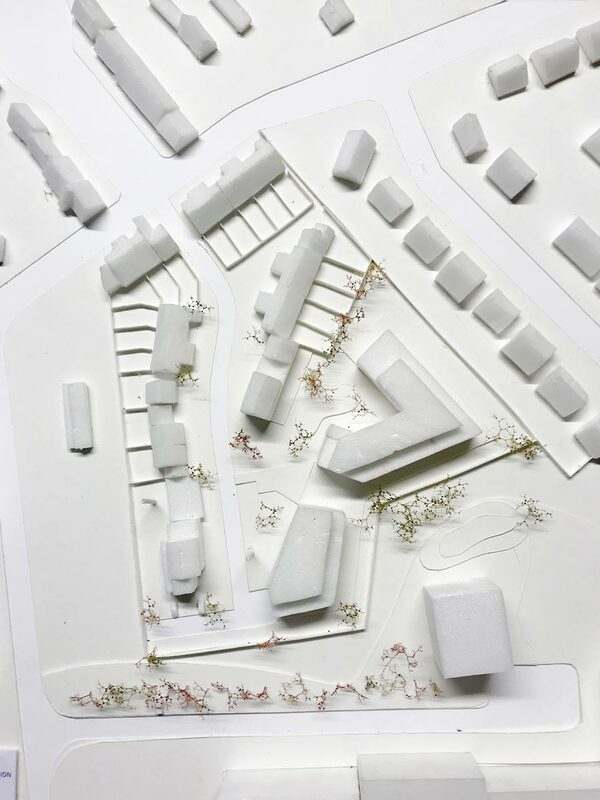 Starting from this question of duality, the project made possible the development of domestic uses linked to the scale of the large landscape. 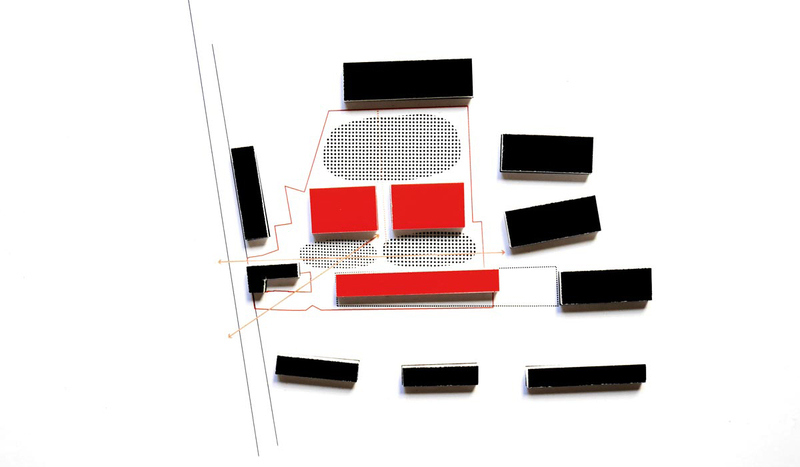 Working from a dense program, our intention was to integrate the building as an abstract element and not a traditional architectural façade. 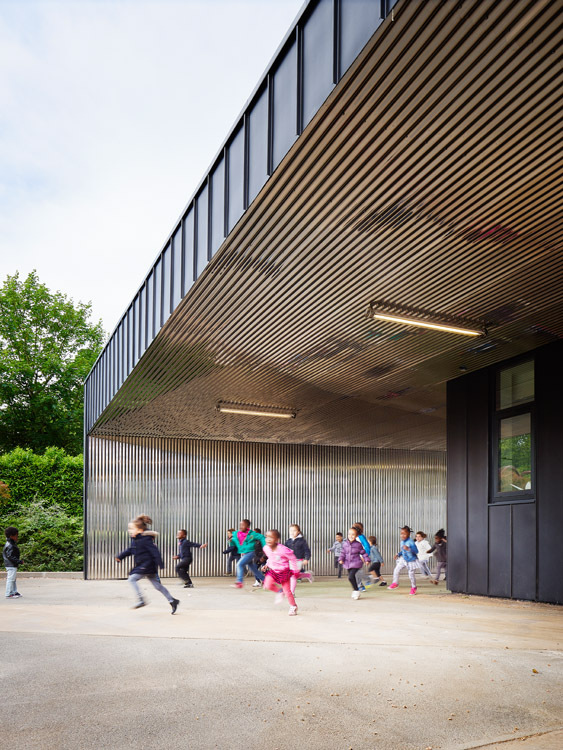 Its materiality, stemming from the shell’s construction process, gives it a strong presence: like a surging volume belonging to the ground it calls us back to earth, to its territory. 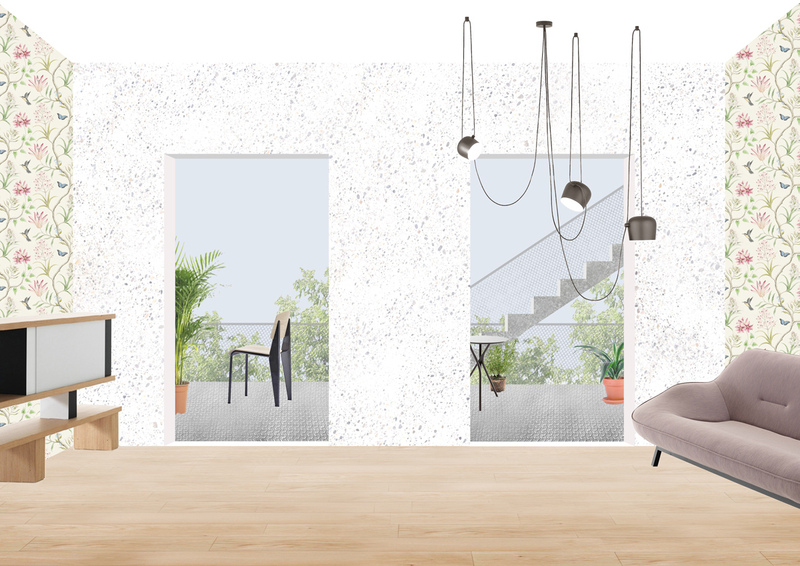 There are several contrasting ambiences: through its dark hue, the Cinquante-Six recounts the depth of the earth to us, its very clear and light interiors recall the many possibilities of inhabiting spaces. 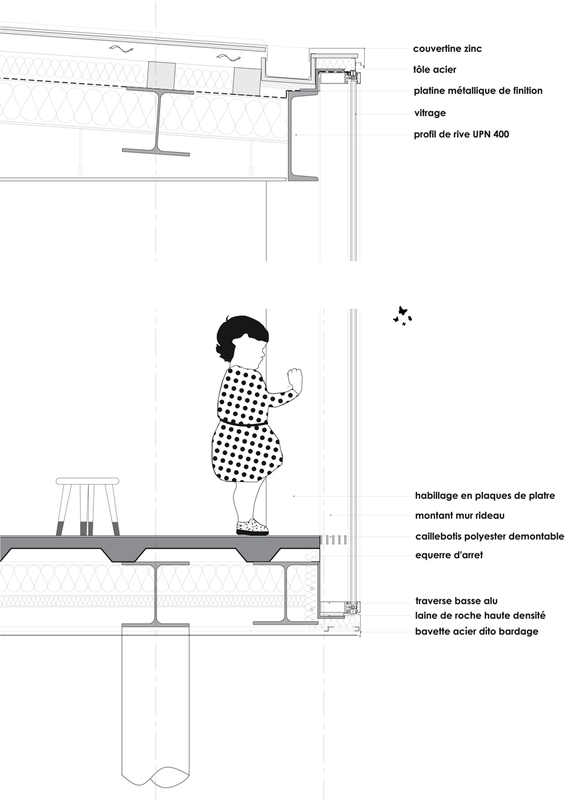 The architectural position was to work on the transition between the public space (the city) and the private space (the home) as an active between-the-two so that a qualitative threshold between the exterior and the interior could be built. 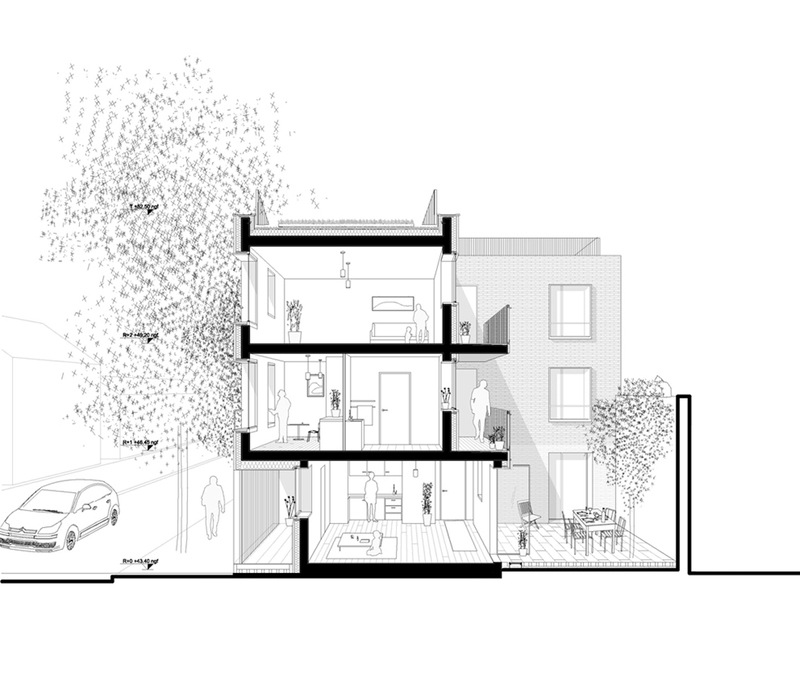 Located in a dense context characterized by both two-story townhouses and 1960s apartment houses, the project fashions a link between the two scales by creating a simple and homogeneous volume. 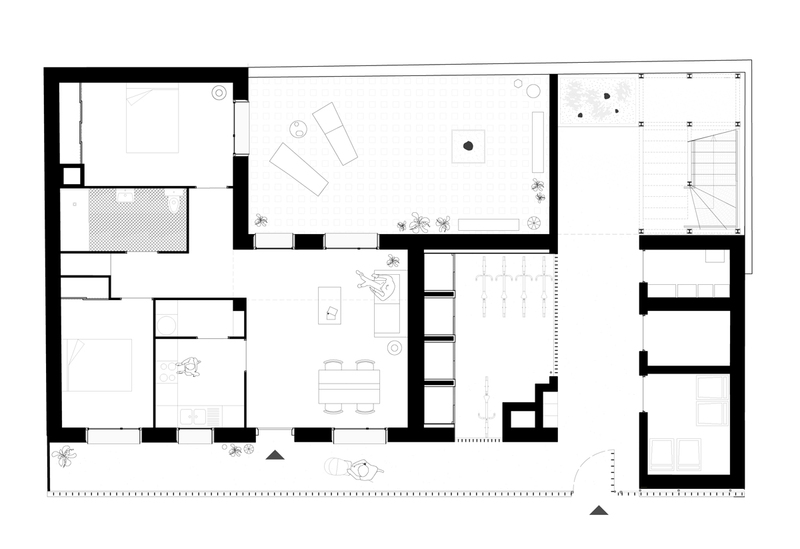 To lighten the relationship of the ground to the built mass, the ground floor volume has been pushed back to the interior of the plot so that, on one hand, a buffer space was created and, on the other, exterior corridors serving the units on the upper floor could be positioned in the rear. 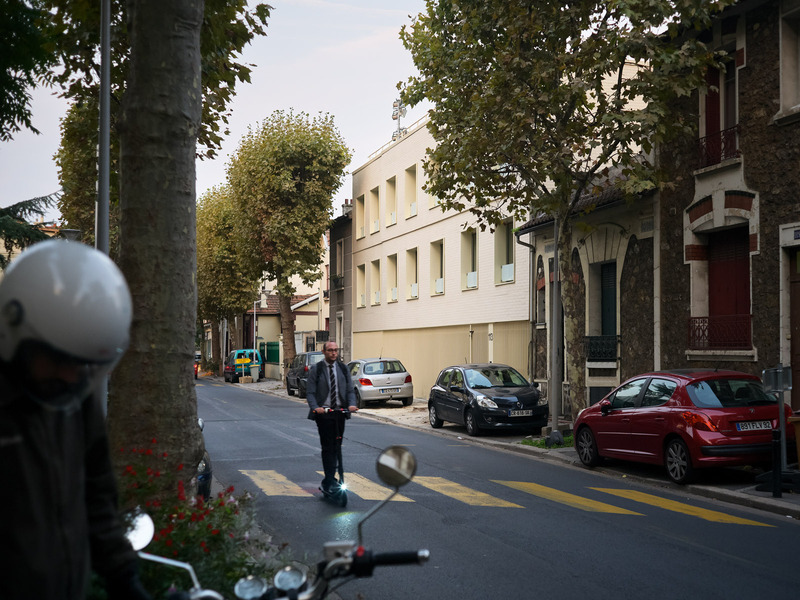 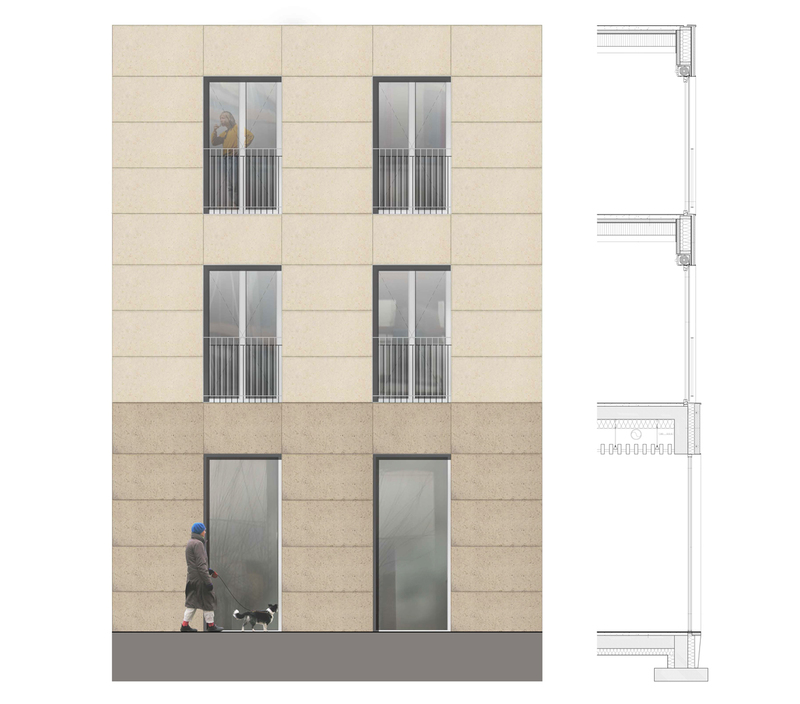 The building benefits from the alignment on the street on this shallow plot to transform the vertical and horizontal circulations into genuine collective spaces. 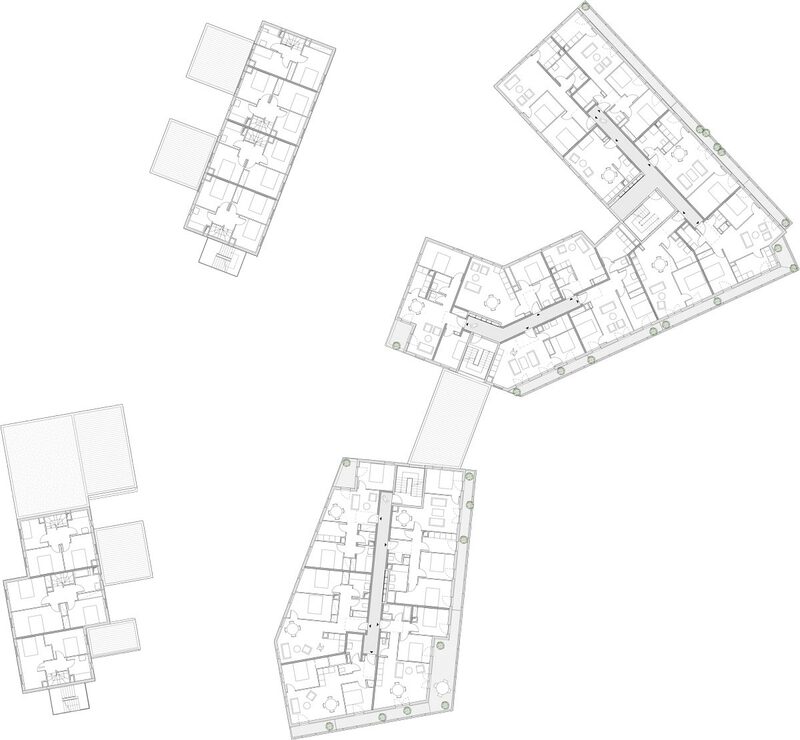 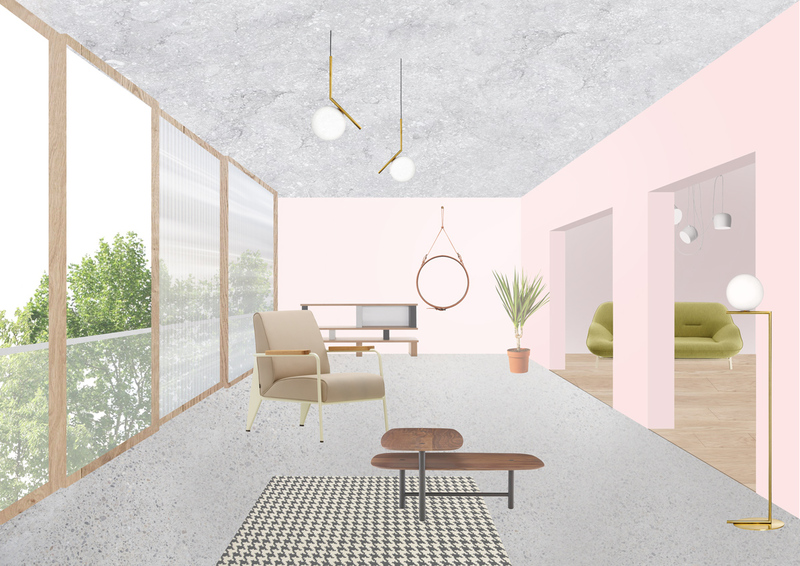 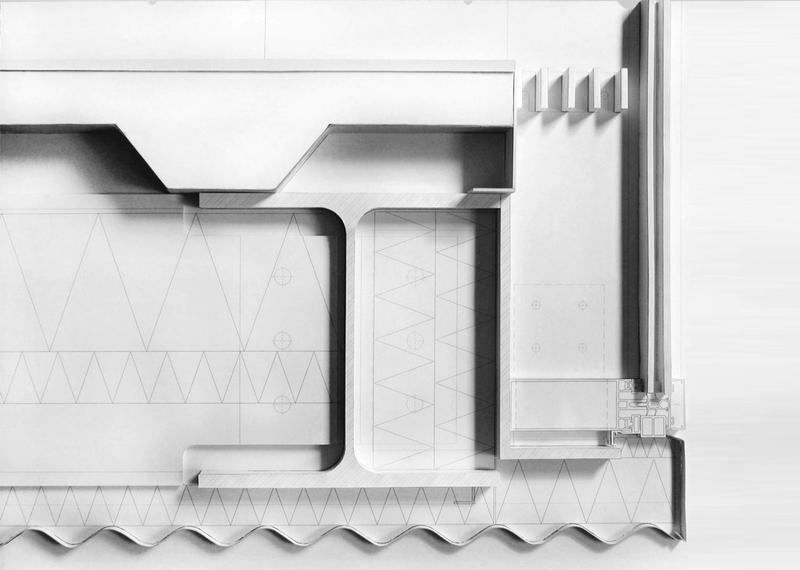 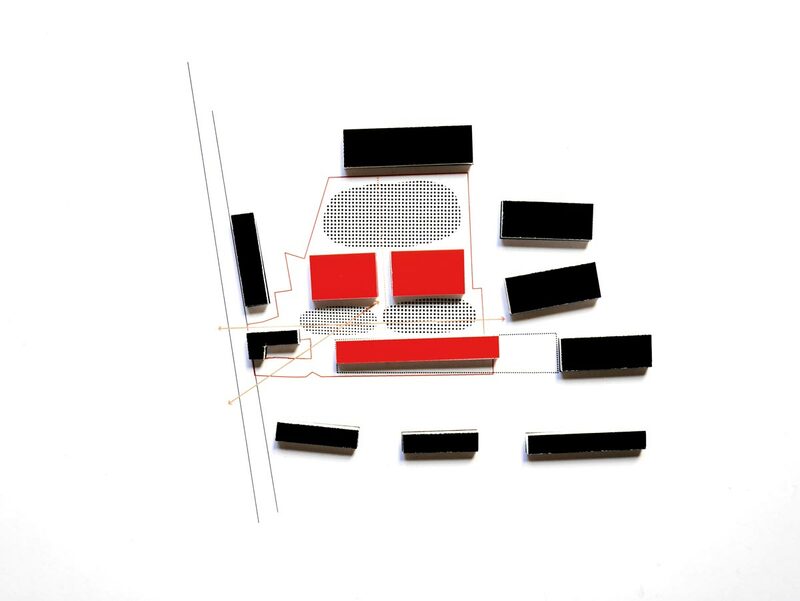 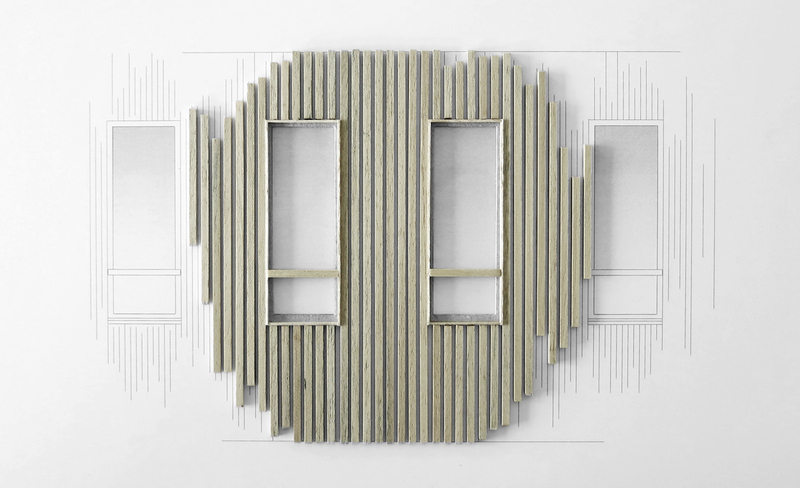 Sited on a block comprised of several buildings that also have extensions and separate exterior spaces, the project’s approach concerns work on thresholds, circulations, interior-exterior itineraries as fertilizers of the spatial concept. 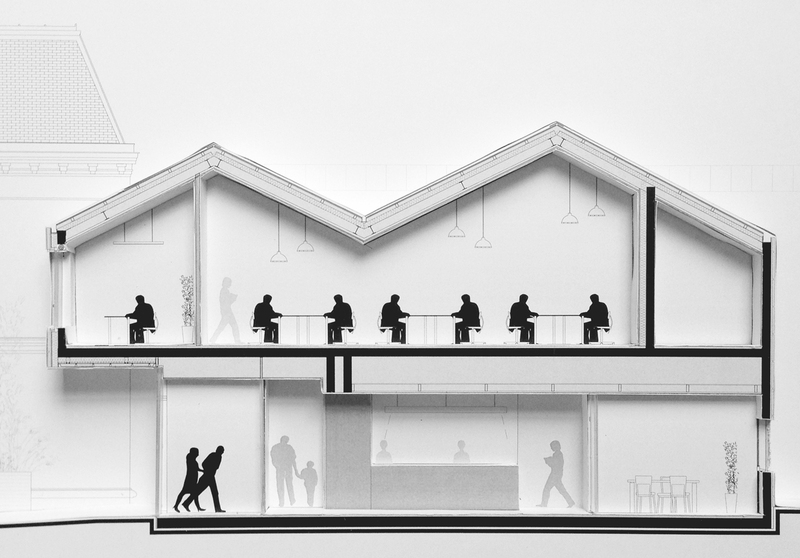 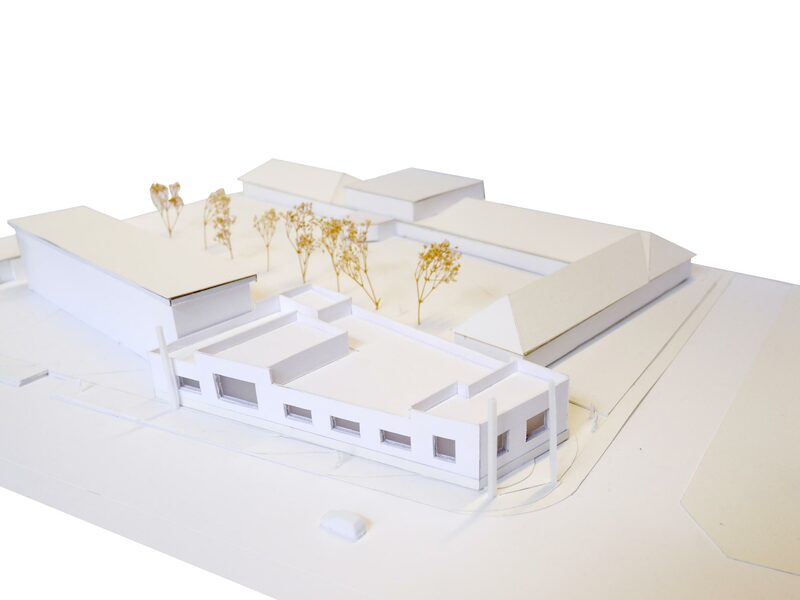 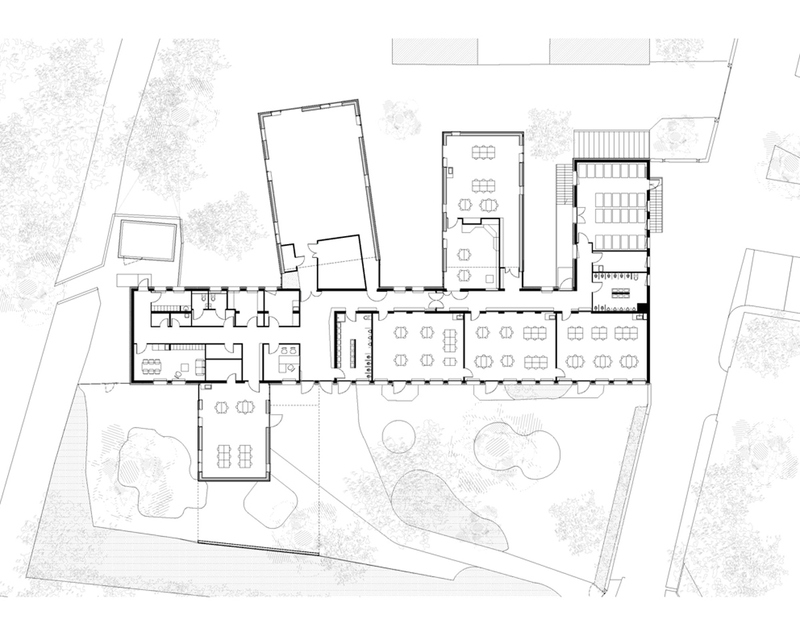 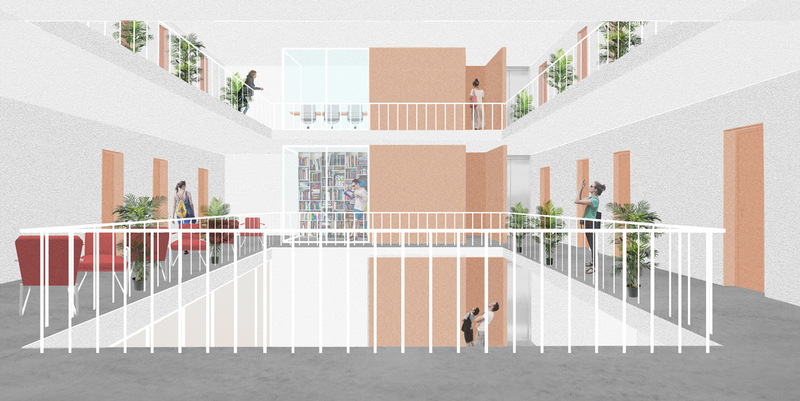 The volume of the extension takes form through the definition of a double wall that asserts its belonging to the school without taking away from the value of the existing building. 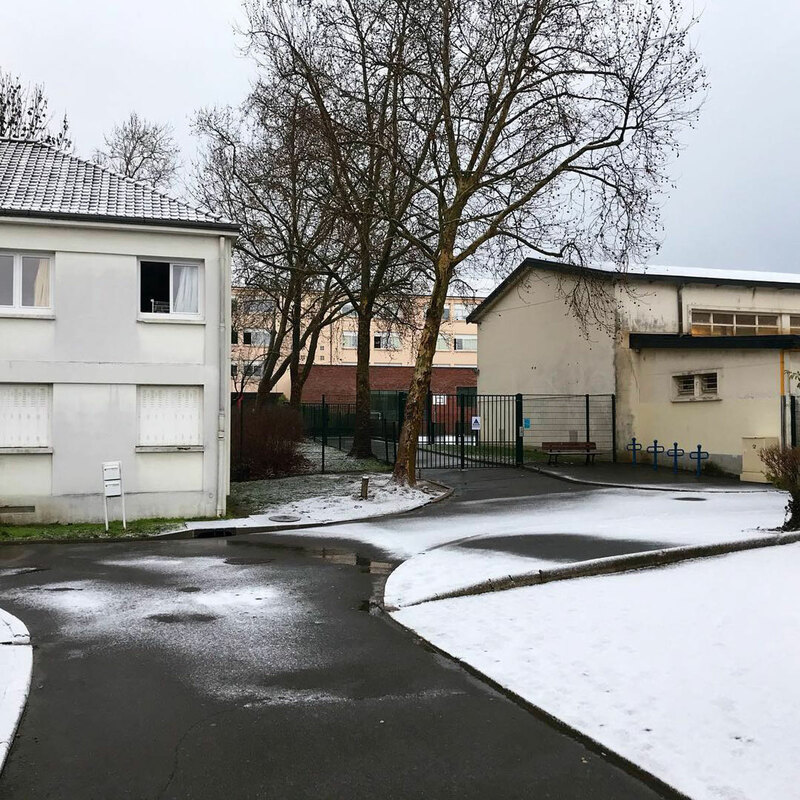 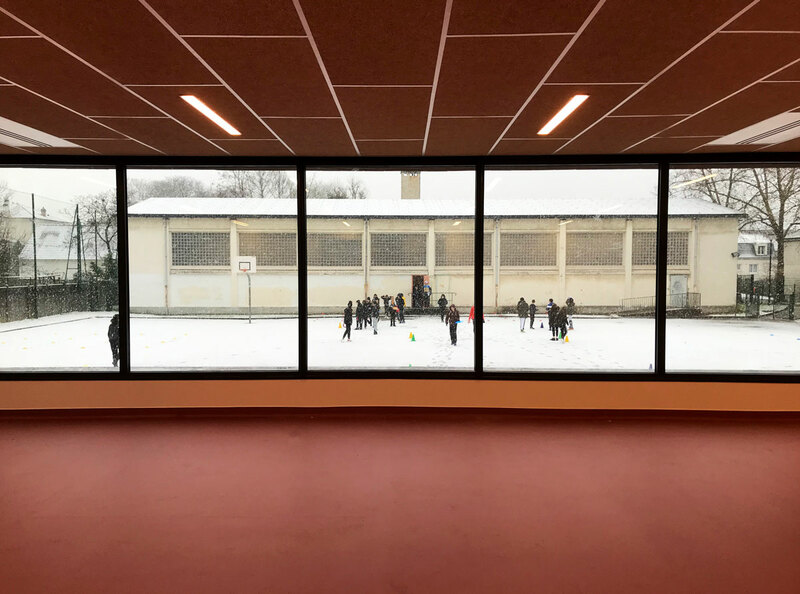 In a context in which the relationship of the lunchroom and the schoolyard appears very weak, the extension enables the relationship to be strengthened. 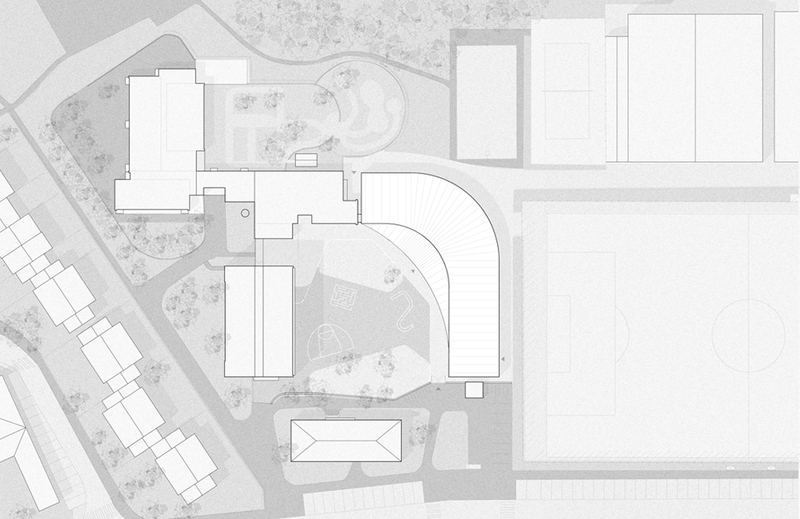 The added volume takes advantage of the large lateral openings to the courtyard then a tree-lined space while framing the views toward the playing field. 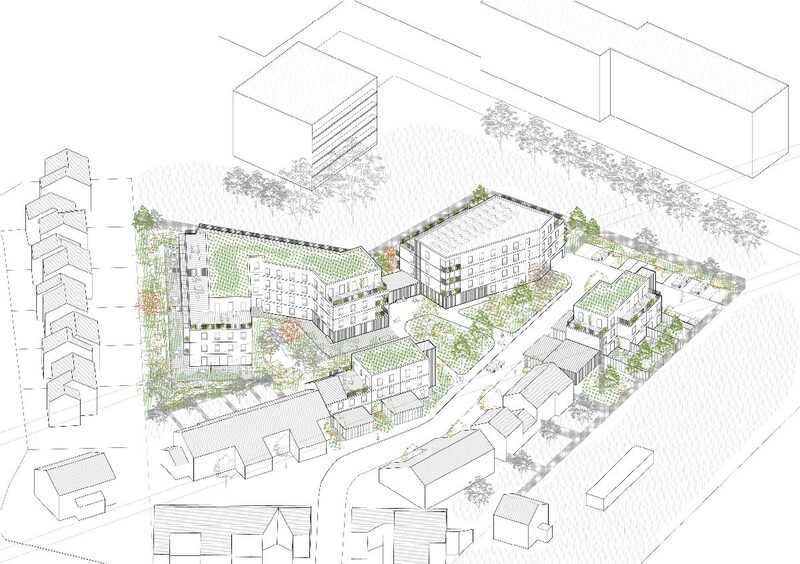 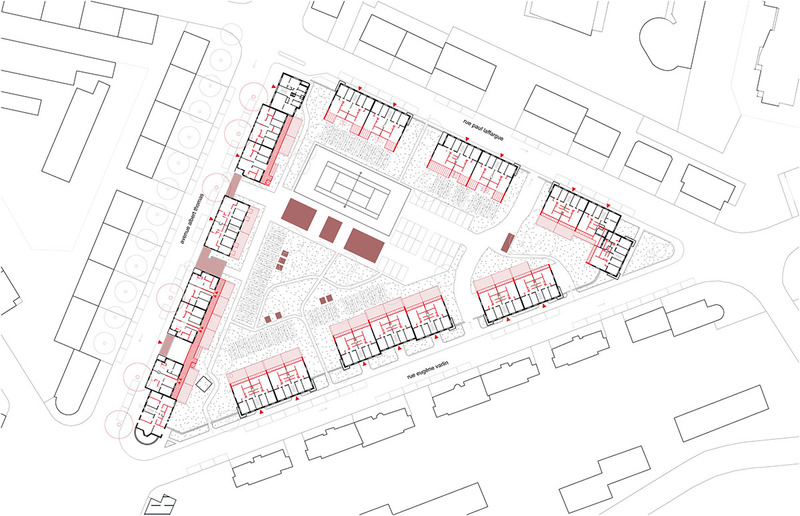 On this site with strong contrasts in which several scales are mixed and through its landscaped character, the conception of 60 social housing units required an integration permitting a negotiation that is both spatial and organizational. 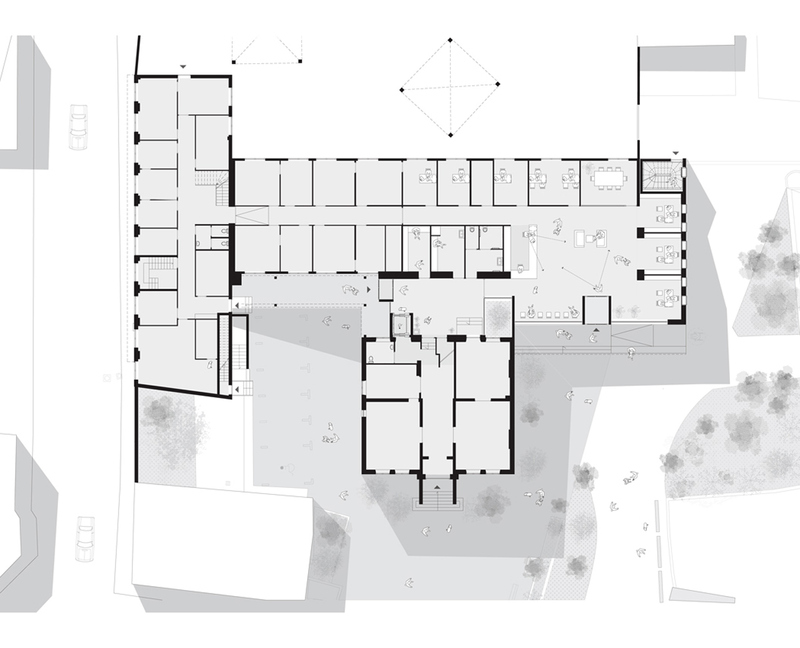 The organization of the built masses responds to a multi-typological logic that fits with its surrounding fabric. 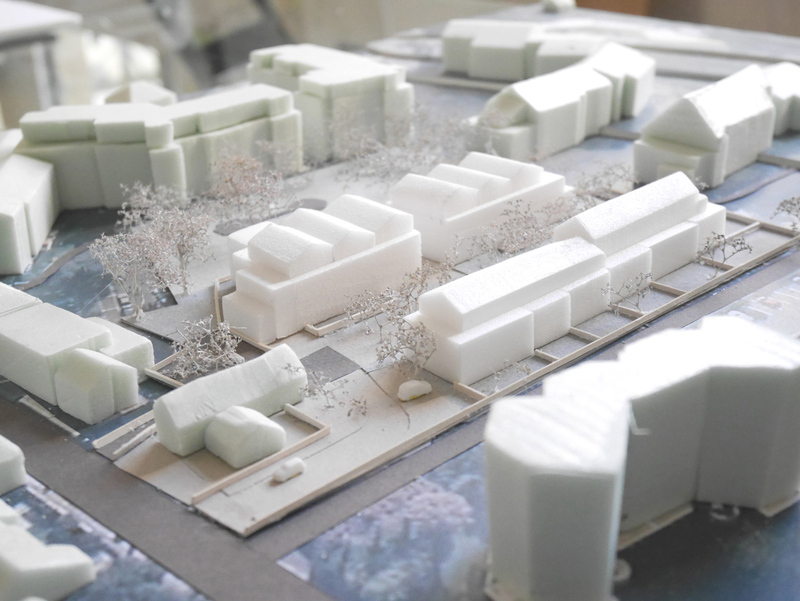 On one hand, the project aims at consolidating the fabric of single-family houses through sparsely sited housing units to reinforce the global identity of the nearby area. 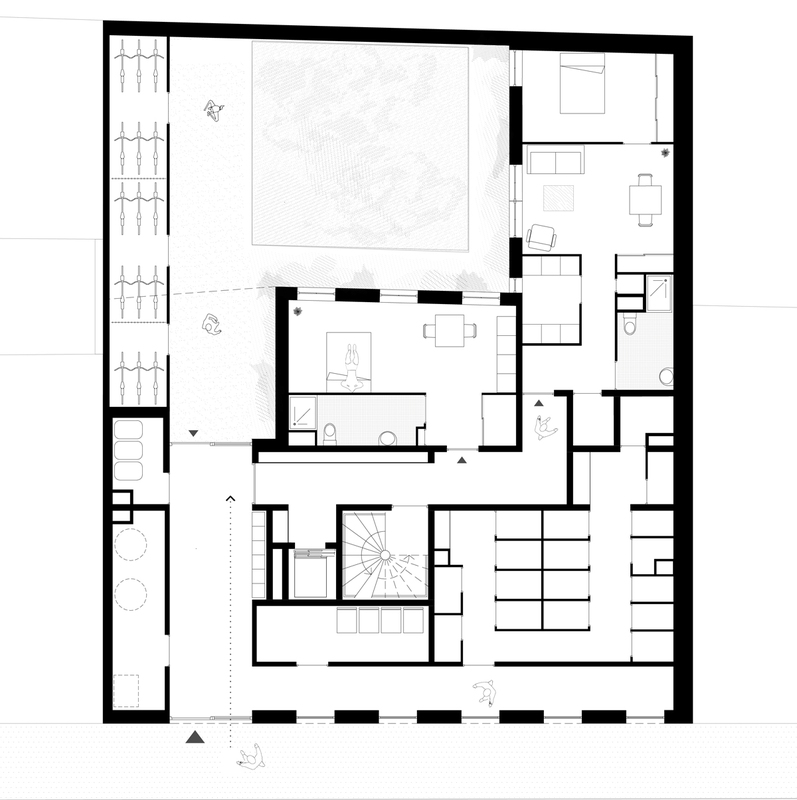 On the other, the rest of the units are organized around two volumes that negotiate a gradual change in scale. 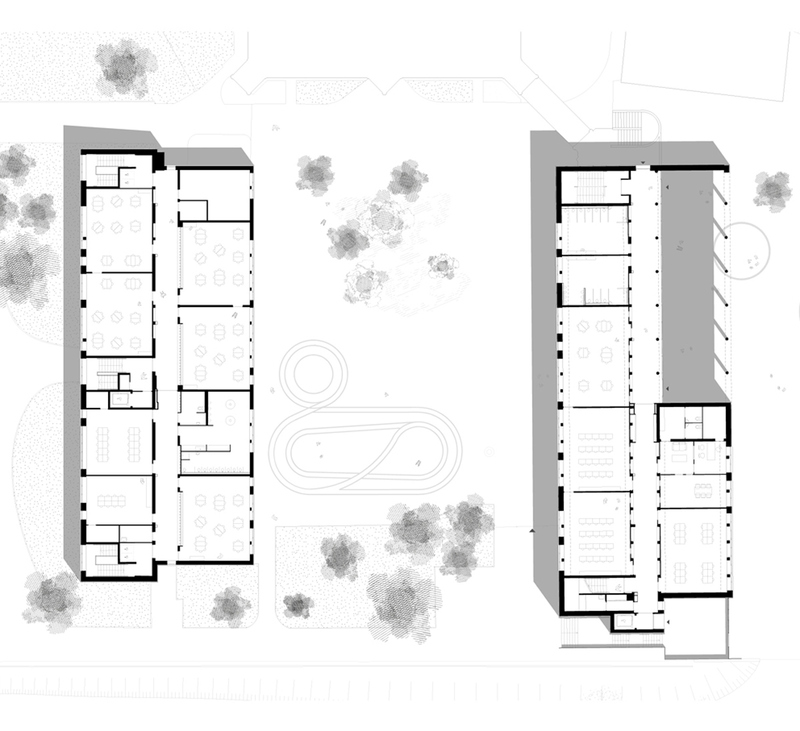 We therefore designed a residential unit of houses in strips and small apartment houses that create a planted continuum intended for public use. 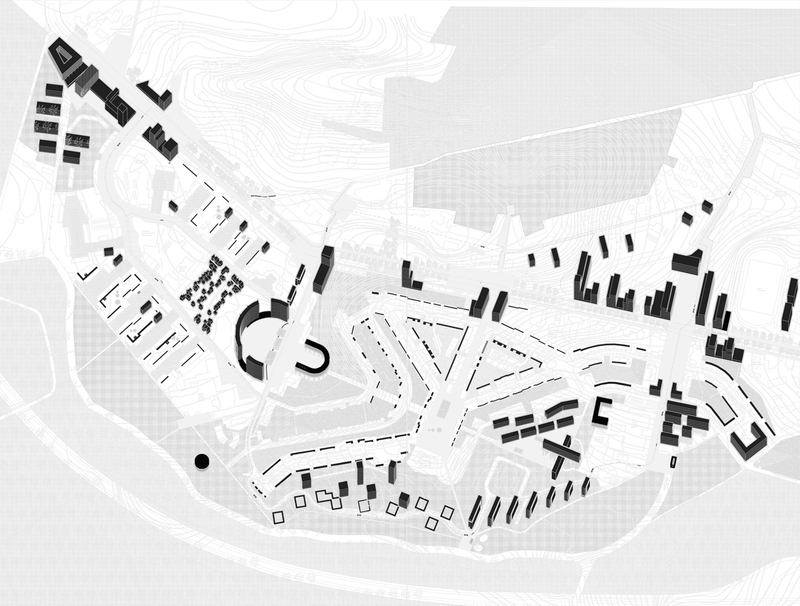 So as to preserve the existing hydrology, the project was designed as a global ecosystem in which the architectural and landscape systems are mixed with technical choices in order to make a whole that is coherent and qualitative. 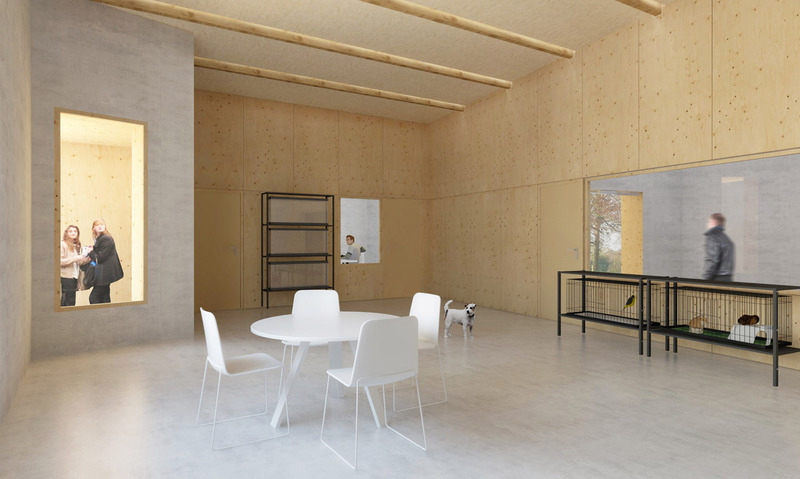 The building were built with a wooden structure and with most of the materials biosourced to strengthen the biodiversity on the site and decrease the energy impact of the operation. 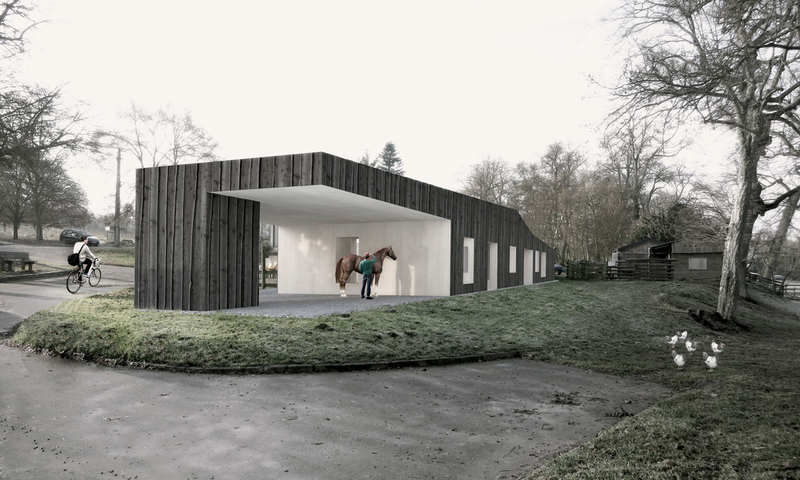 The project proposes a discreet architecture that serves a landscape with the presence of several systems making it possible to establish several way of inhabiting that strongly resonate with its context. 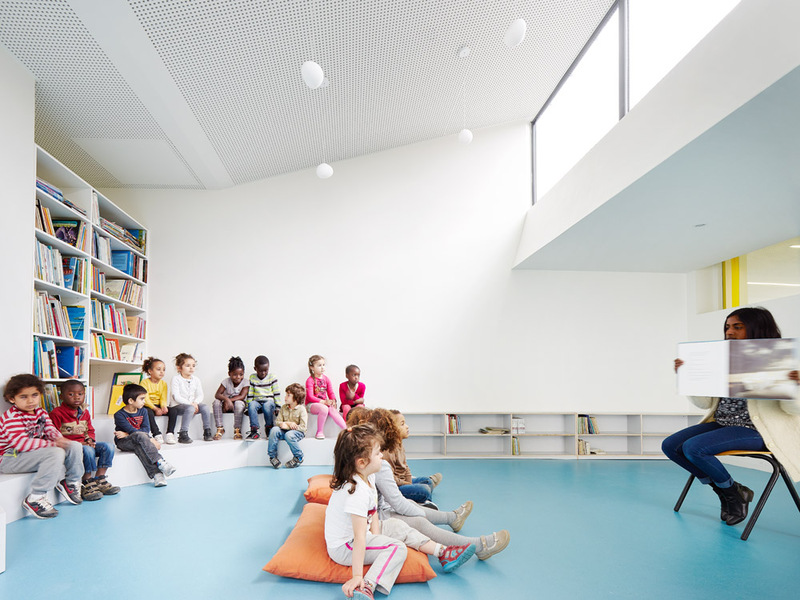 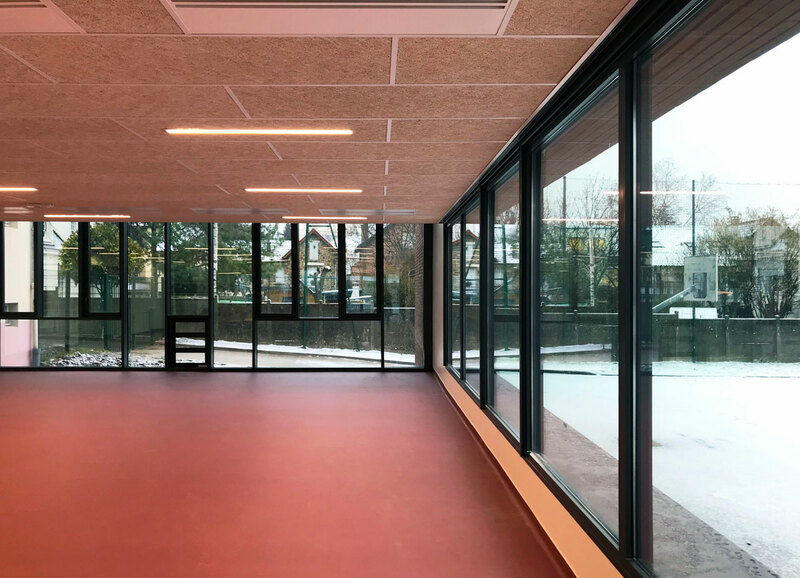 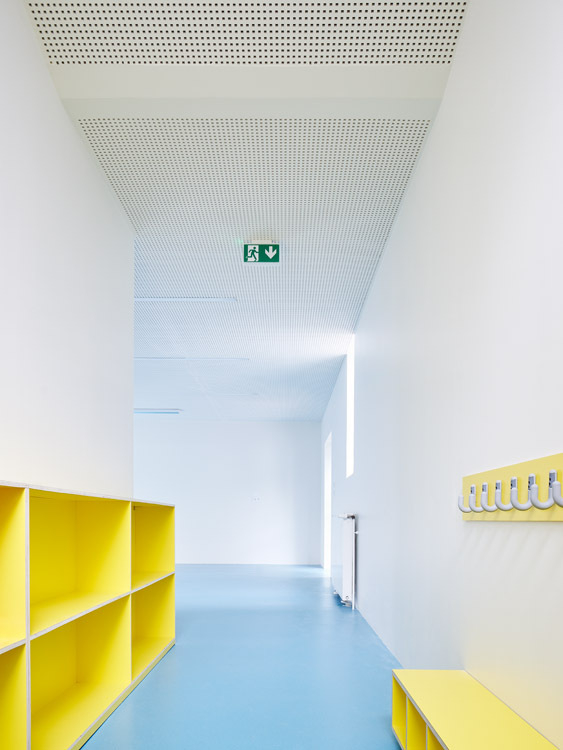 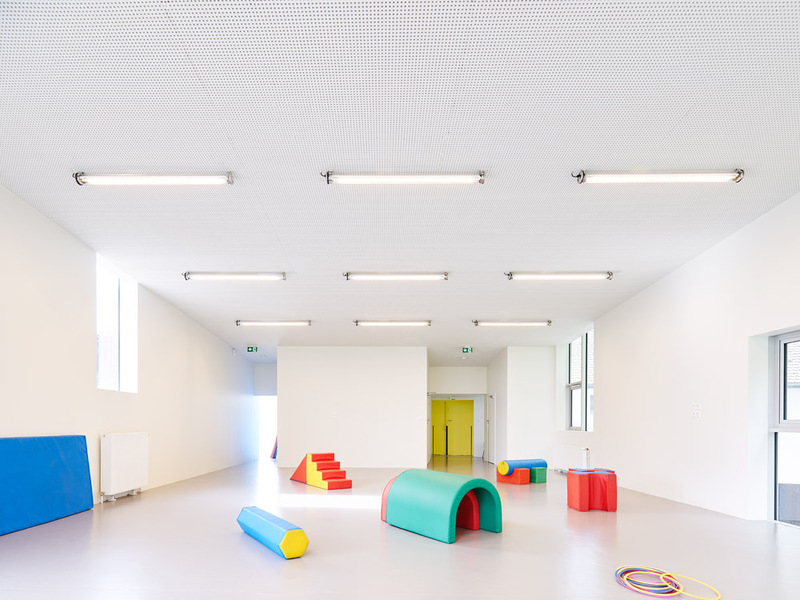 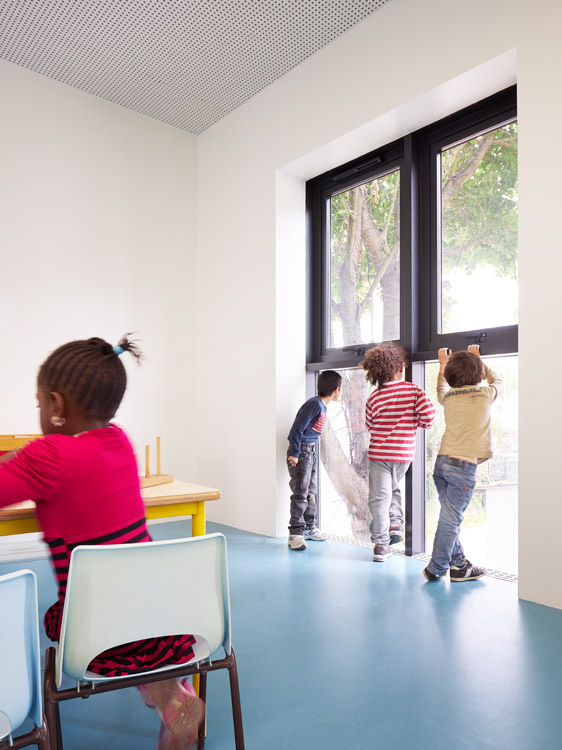 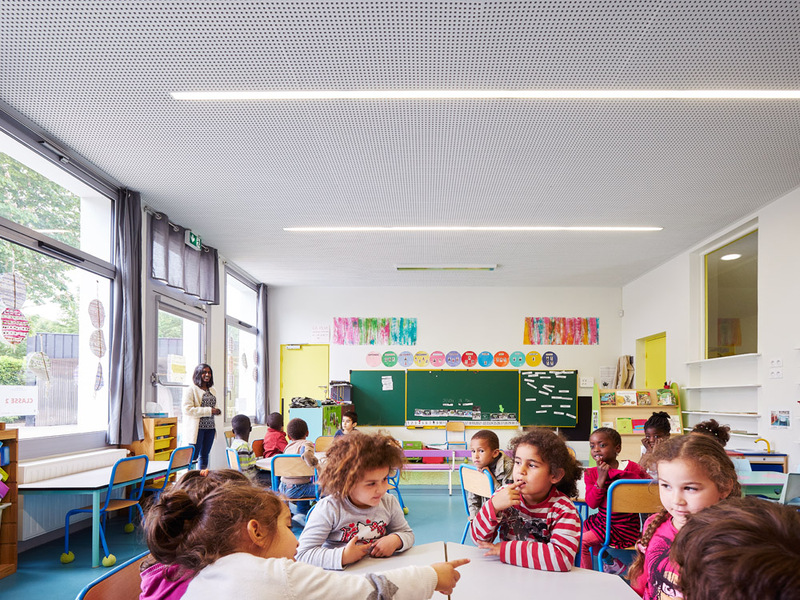 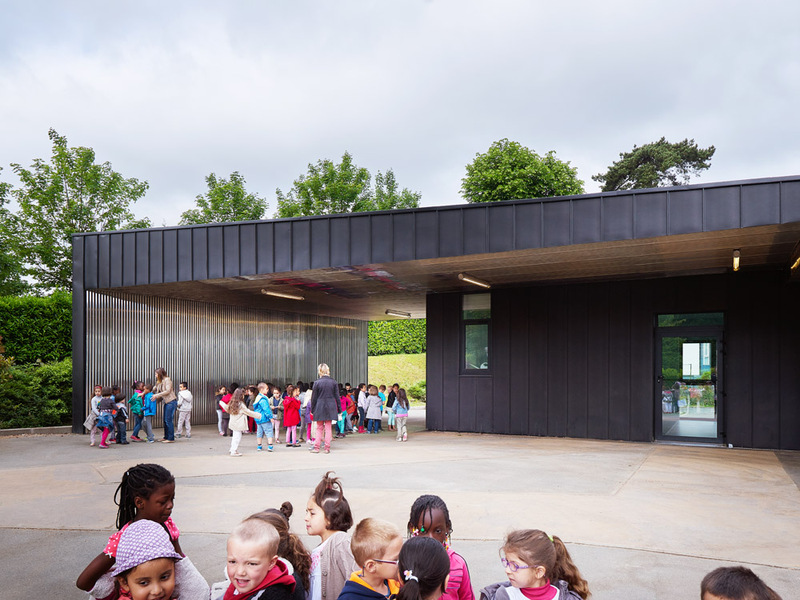 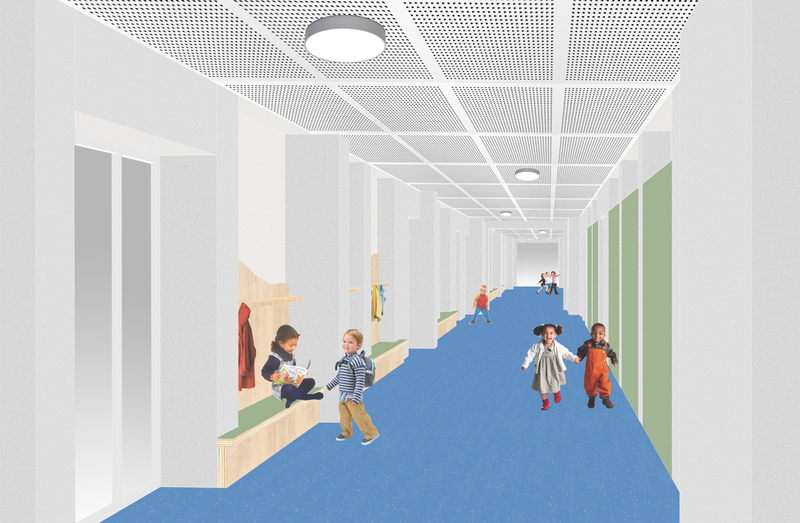 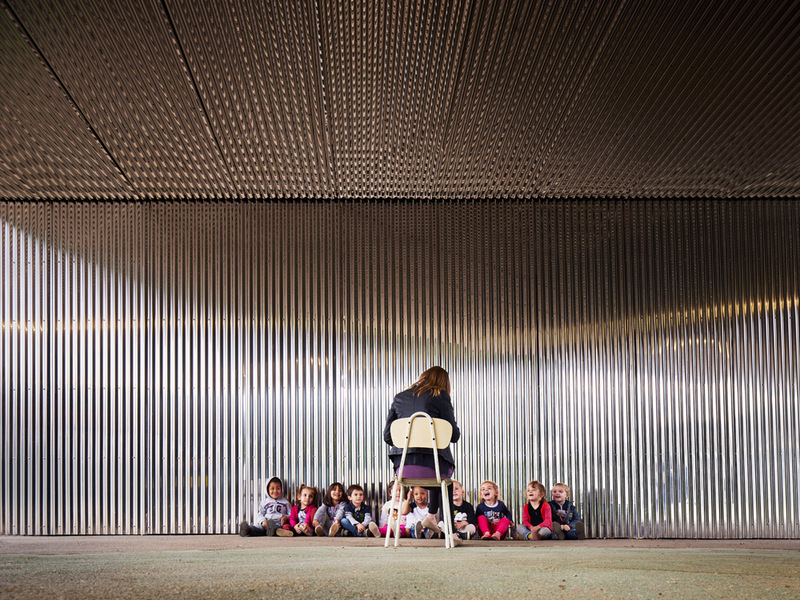 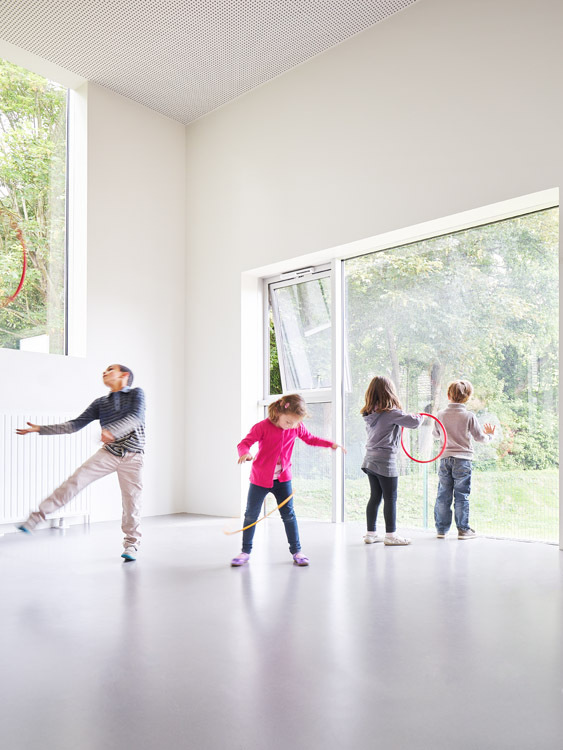 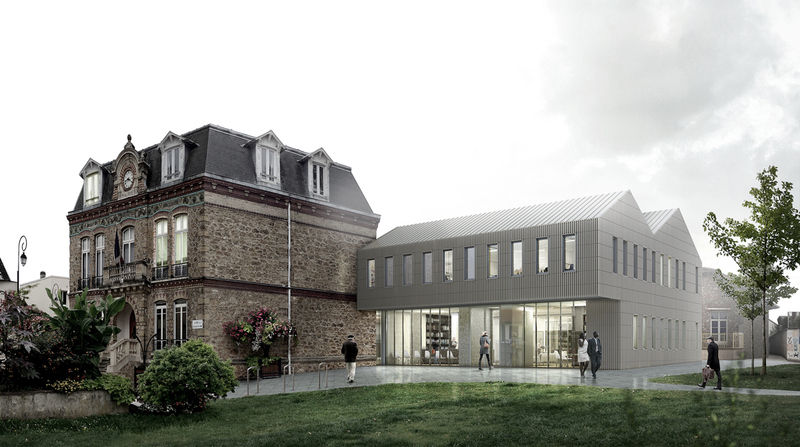 The design of the extension of the preschool of Les Alliés de Chavannes arose from the landscaped environment and its integration into the site. 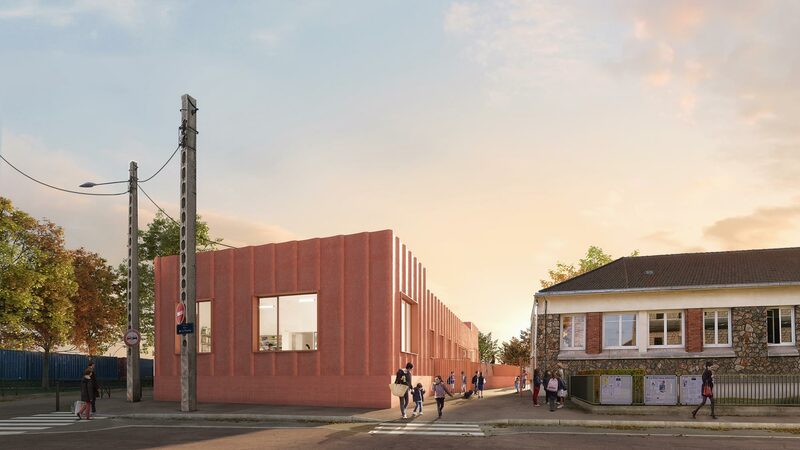 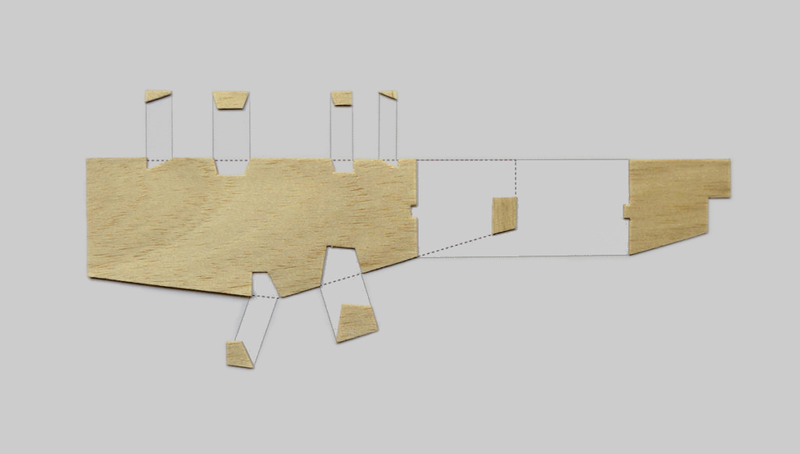 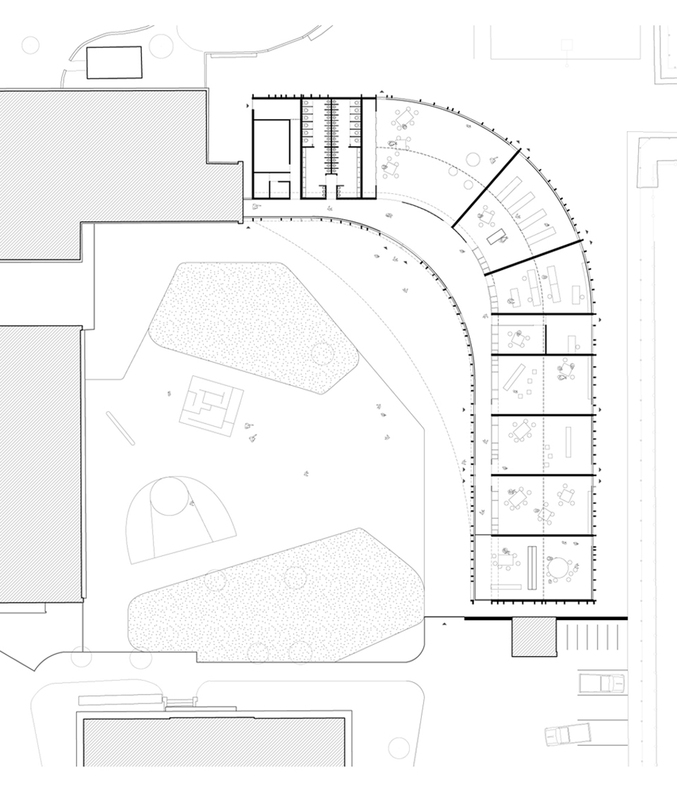 The three new extensions are connected to the longitudinal circulation of the existing building so that the new volumes can be perceived as separate pavilions. 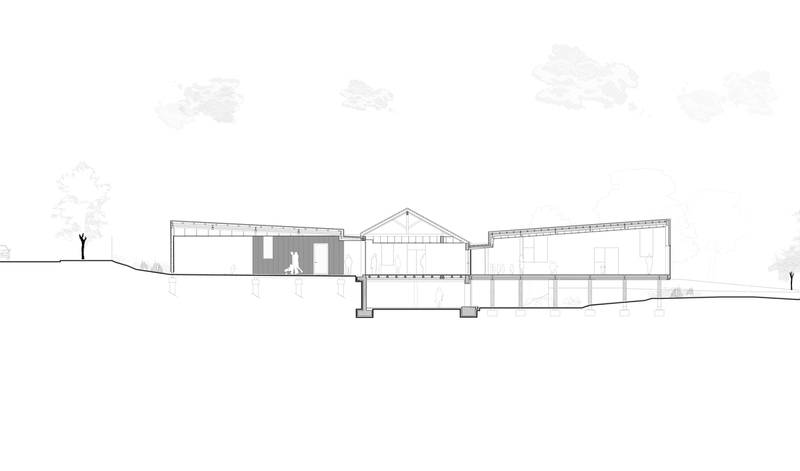 As for the existing building, it was reconfigured to become the school’s backbone. 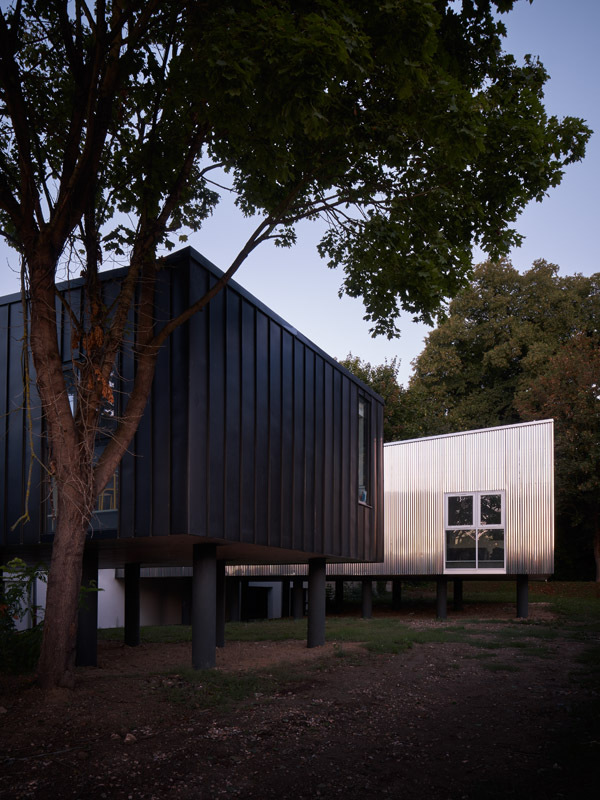 Distinguished by a metal treatment, the new volumes permit a clear readability between the original building and the extension. 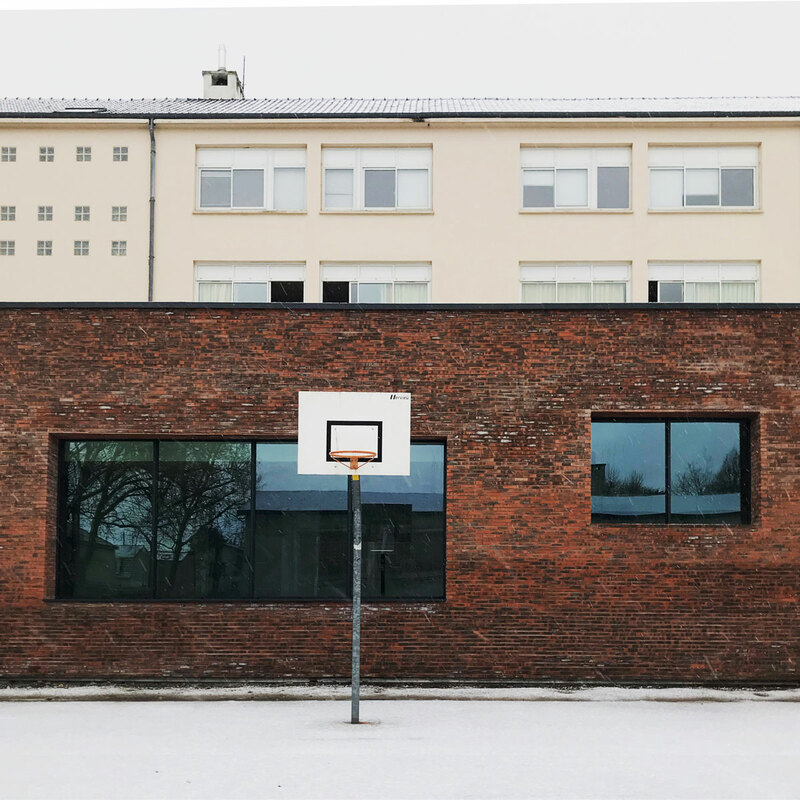 The new volumes are organized in such a way as to guarantee fluidity and a programmatic organization that harmonizes with the school’s current functioning. 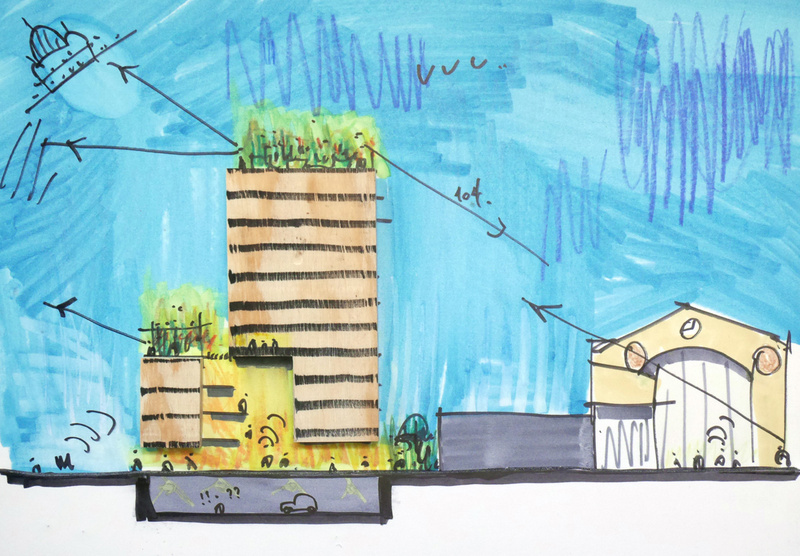 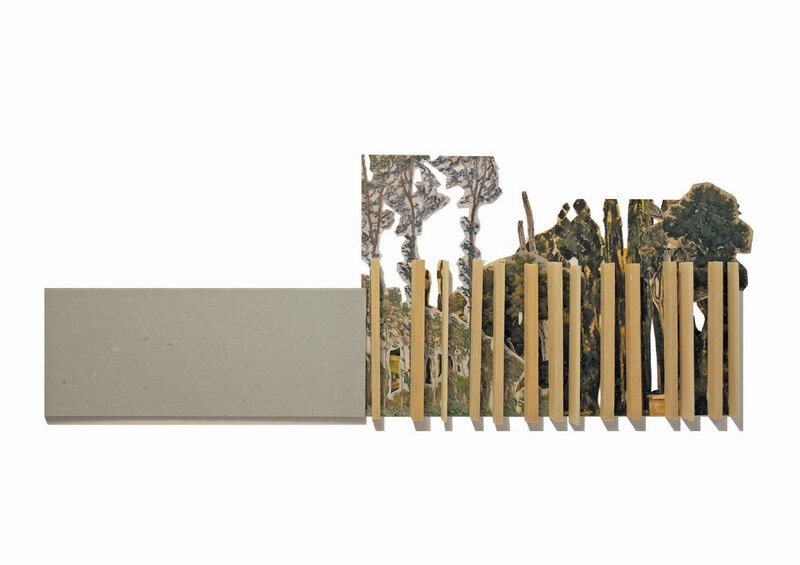 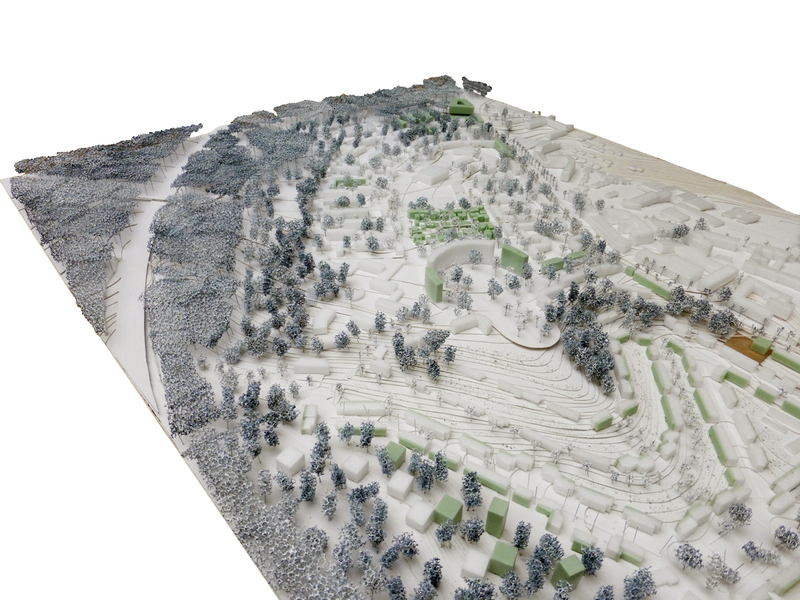 Their siting is logically inserted between the existing trees while creating views toward the vegetation. 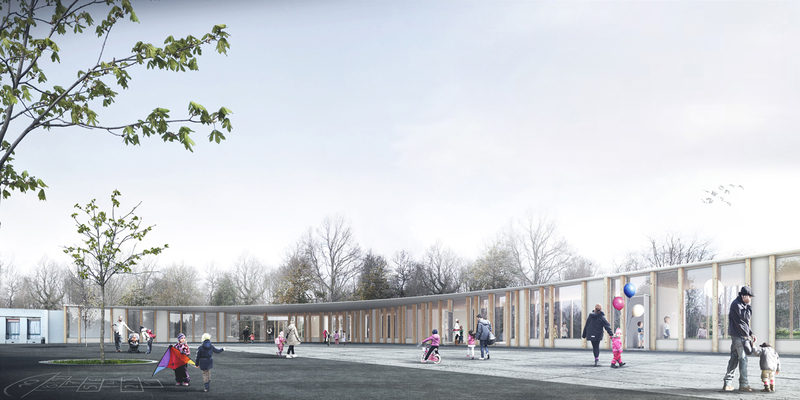 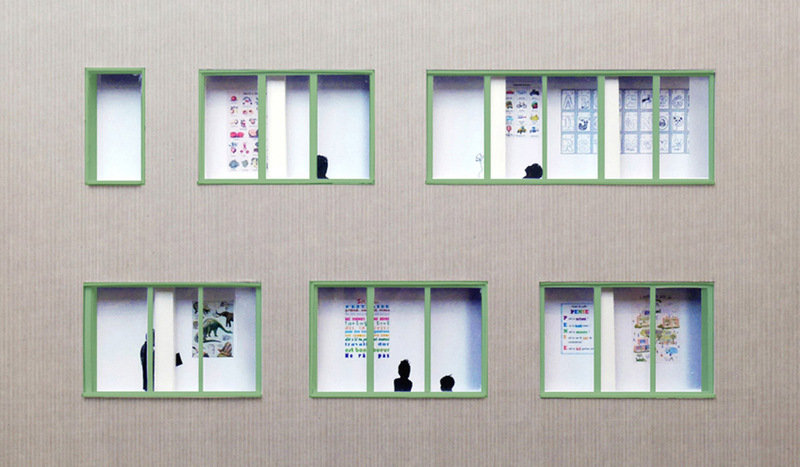 Set on piles and with façades that offer each space different exposures, these new extensions enable all the children to feel like they are in a tree house! 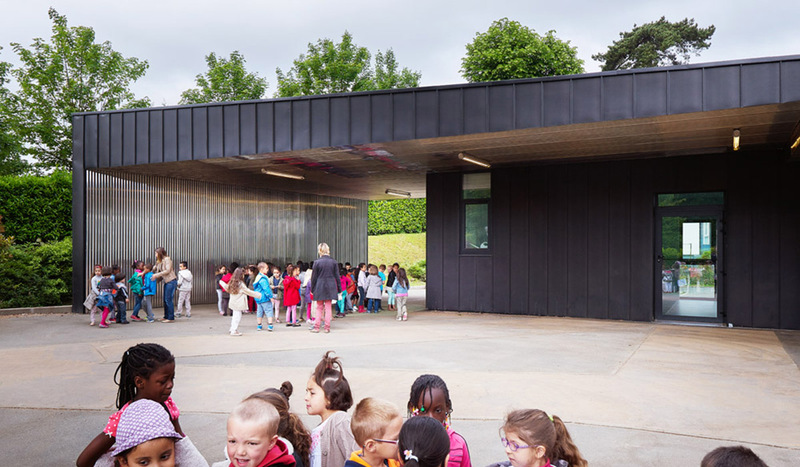 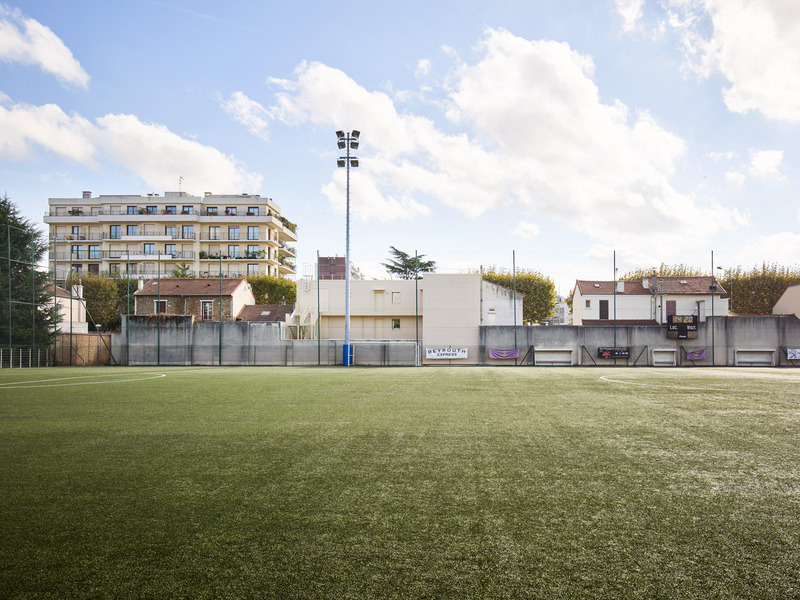 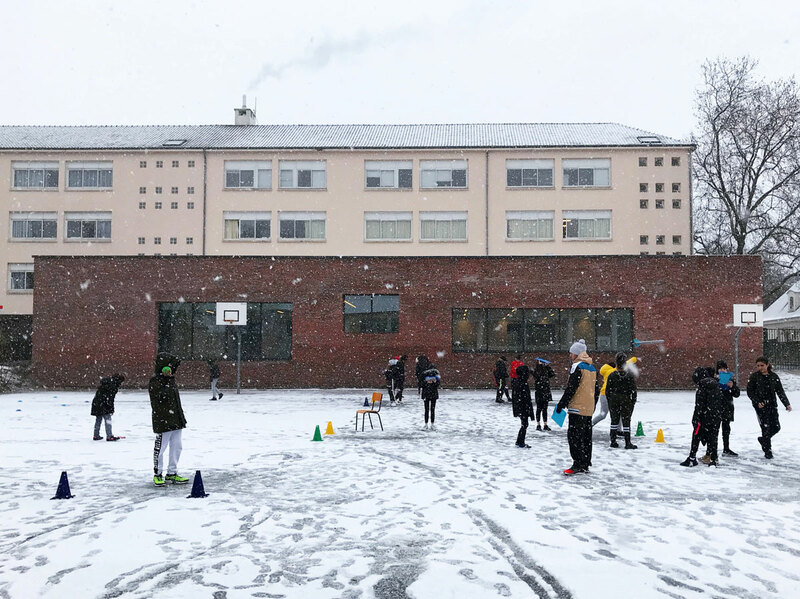 On a plot located between a residential zone and a highway, the operation to renovate the school complex made it possible to create a new relationship between the learning spaces and the exterior environment. 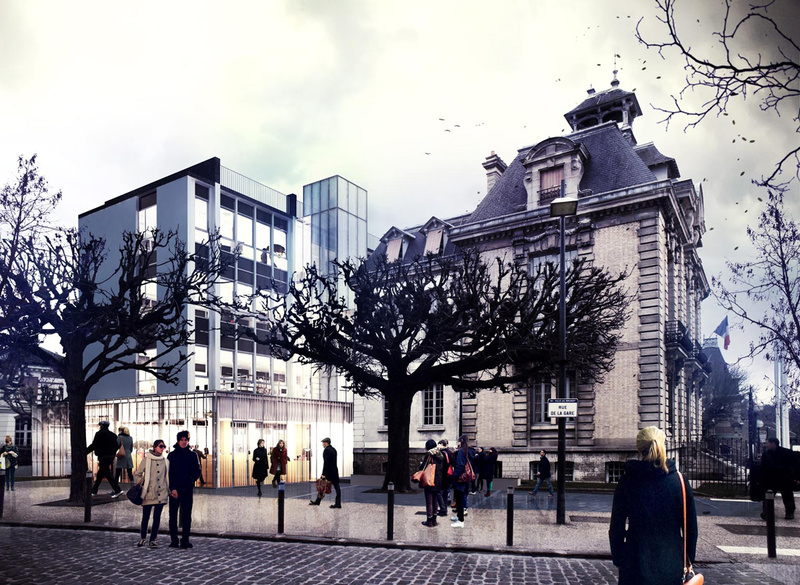 All the existing opening were questioned with the aim of creating large openings to change the scale of the built mass vis-à-vis the neighboring buildings. 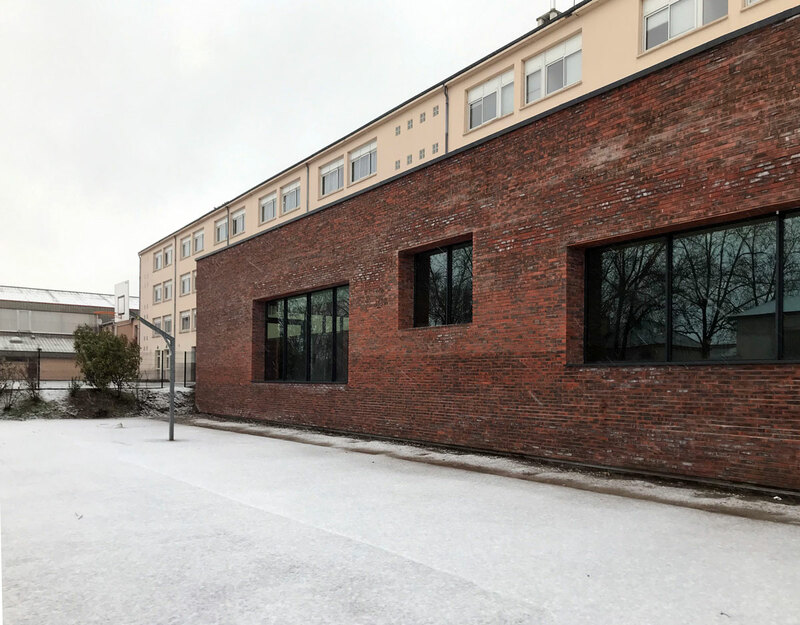 The buildings’ shell was rethought and treated with grooved mineral panels to give the buildings a new image in a periurban and landscape context. 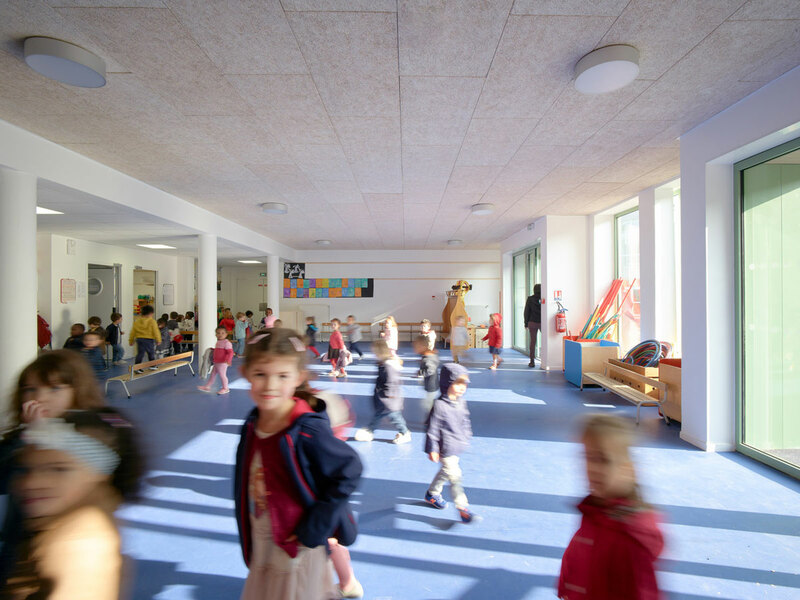 A wood structure extension was slid into the first level of the preschool to complete the global volume of the operation. 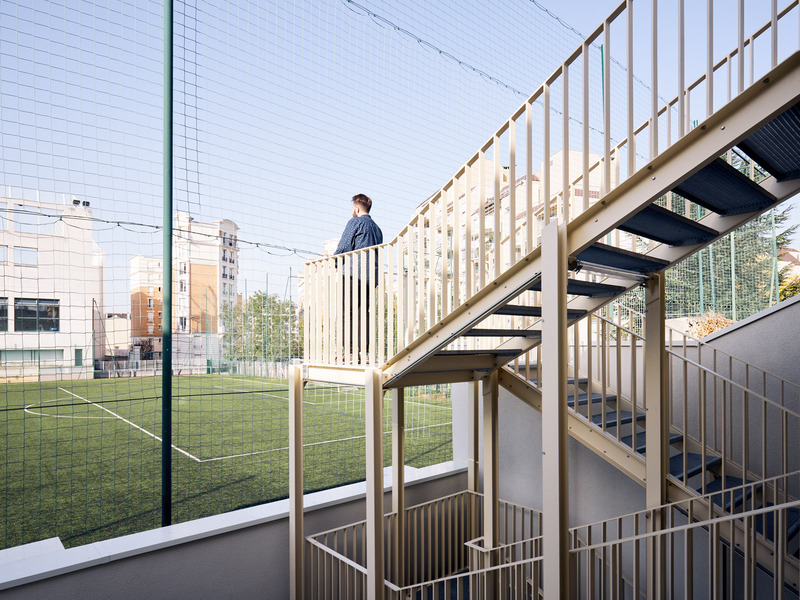 The aim of the project is to transform an introverted institutional building into the possibility of dialoguing with its urban fabric and its social context. 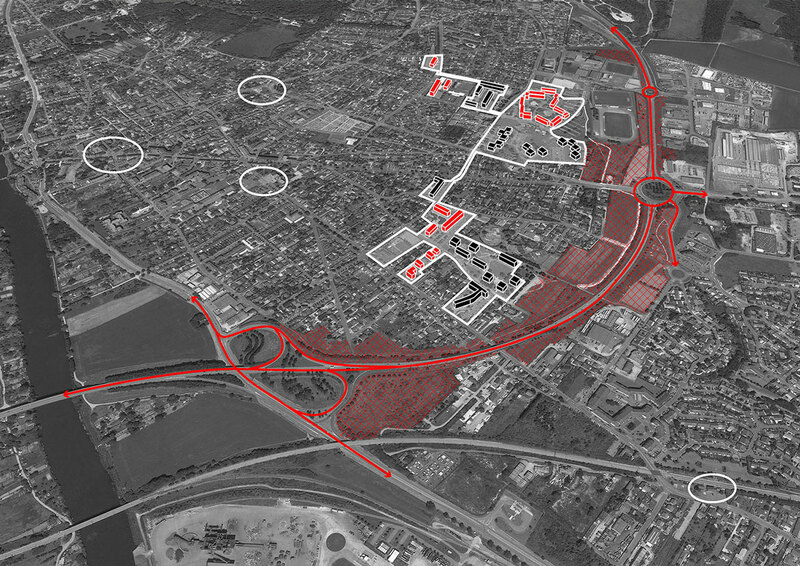 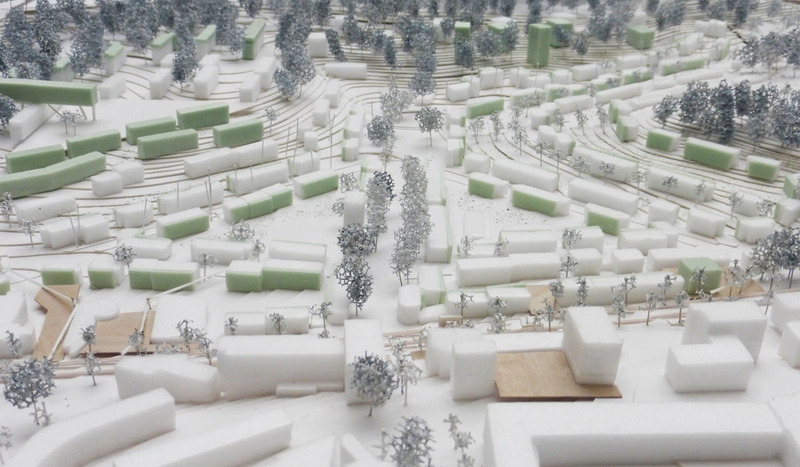 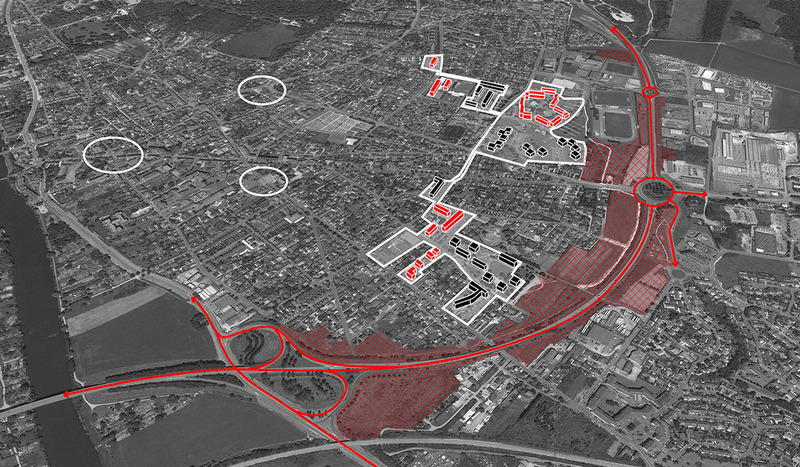 Developing a unique architectural writing to offer coherence to this part of the rapidly changing town center will permit the new extension to create a plan whose objective is to clarify what already exists. 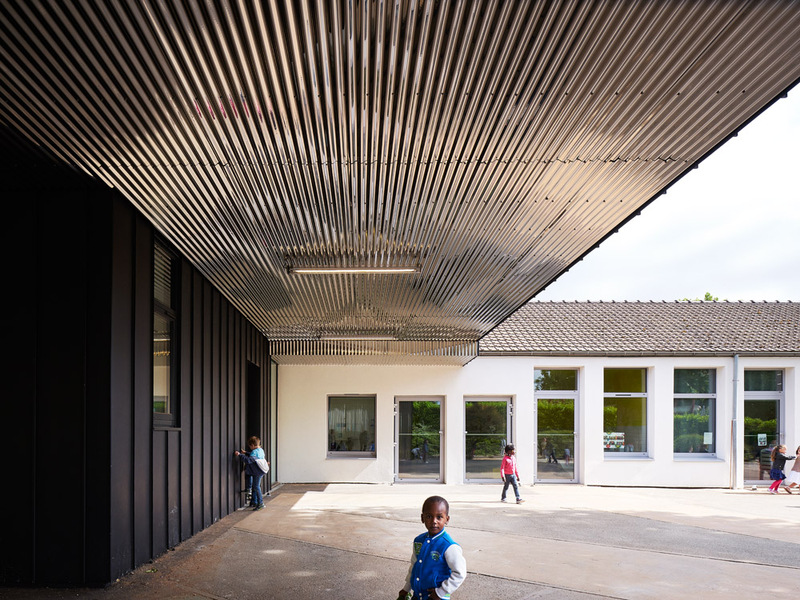 The shell’s vertical ceramic strips unite the extension and the existing structures through its mineral materiality. 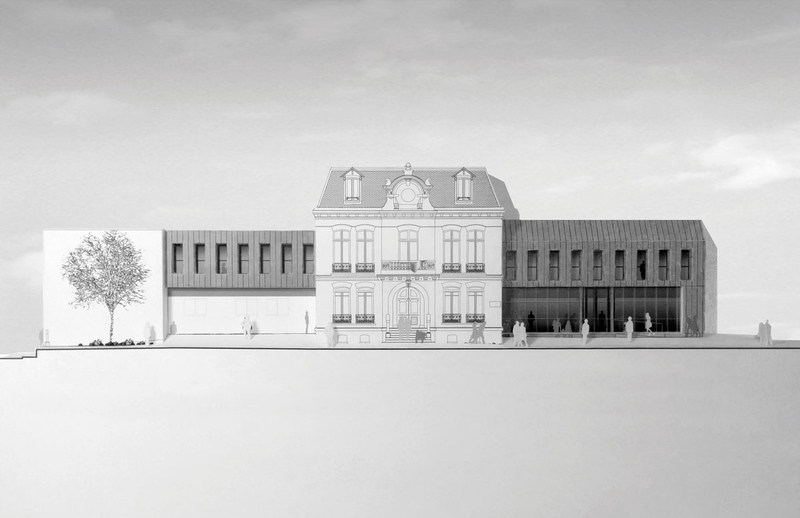 The whole can thus be read as a negotiation element between the accumulation of the different buildings composing the current town hall. 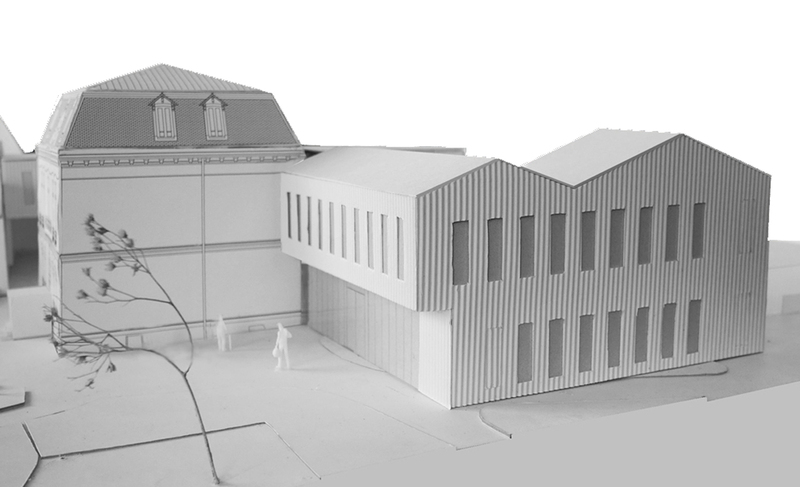 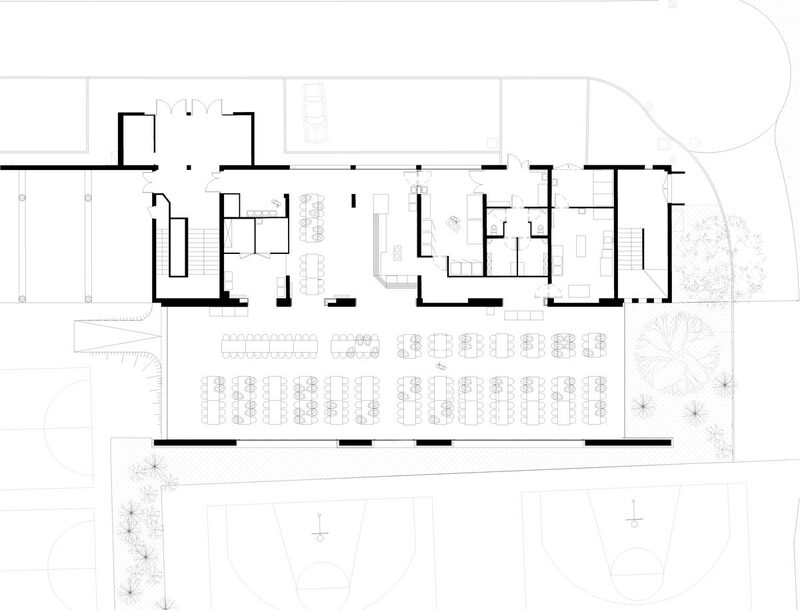 Inserted between the two existing buildings, the new extension is embedded in a very limited footprint. 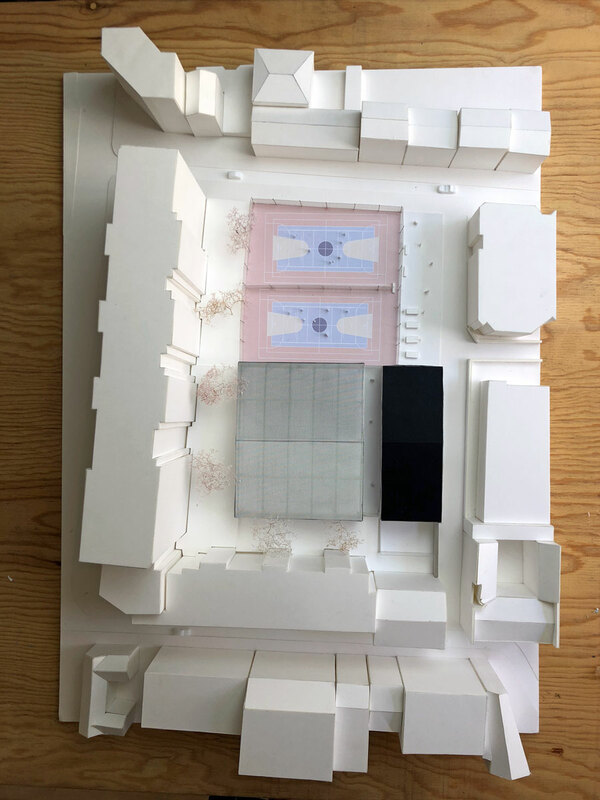 A residual space is consequently transformed into a hall in which the façade’s transparency extends the plaza in front of the town hall into the building’s interior while permitting the town’s residents to serenely carried out their official business. 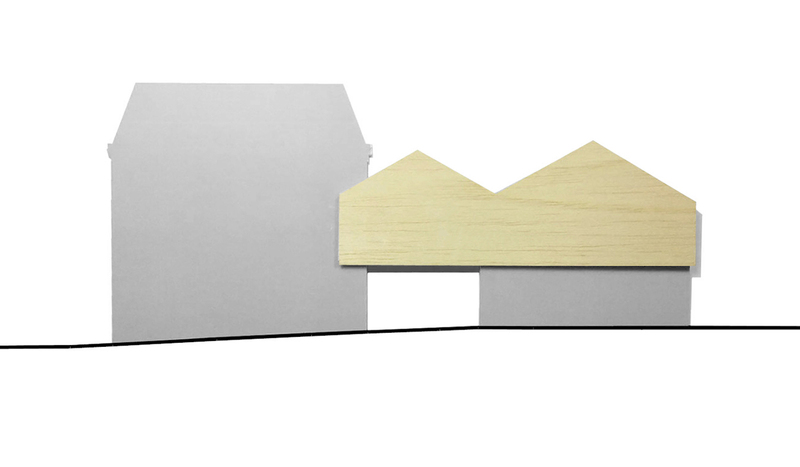 On the west side, the volume is separated into gable roofs to evoke the houses of the original small village that became an astonishing multicultural crossroads in the 1960s. 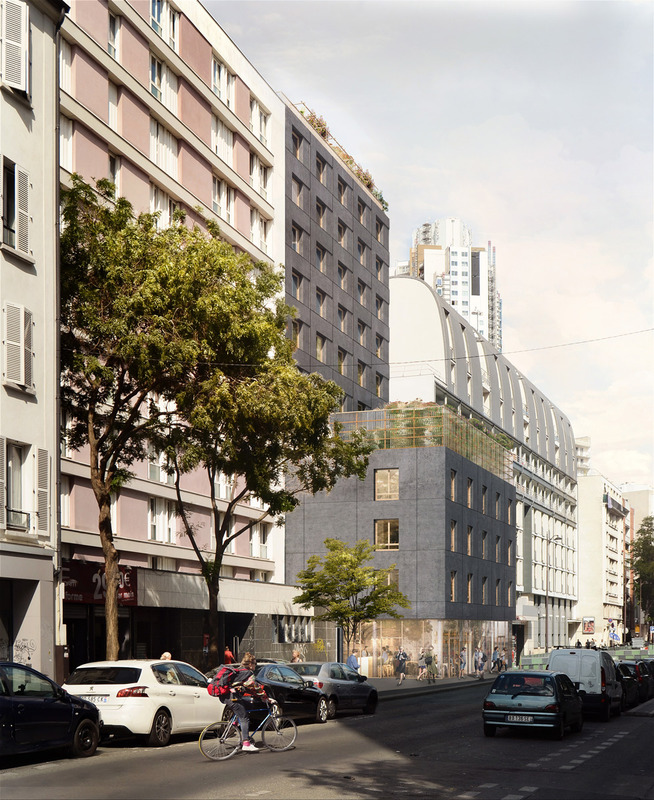 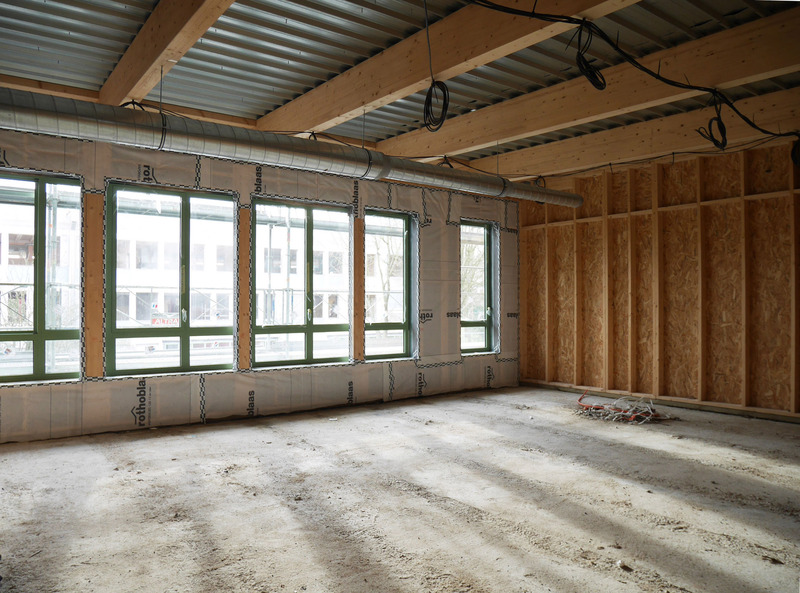 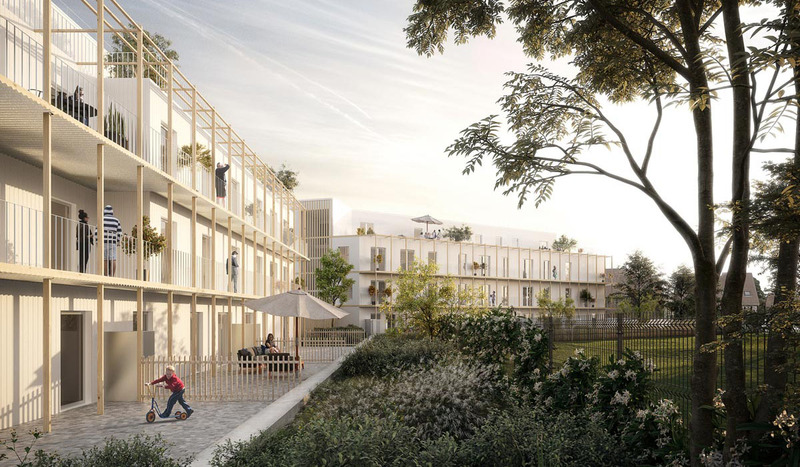 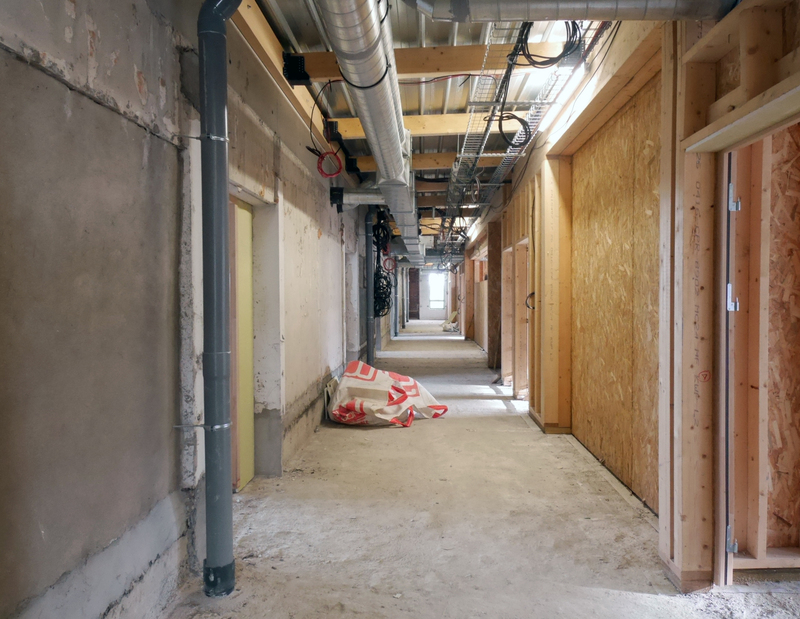 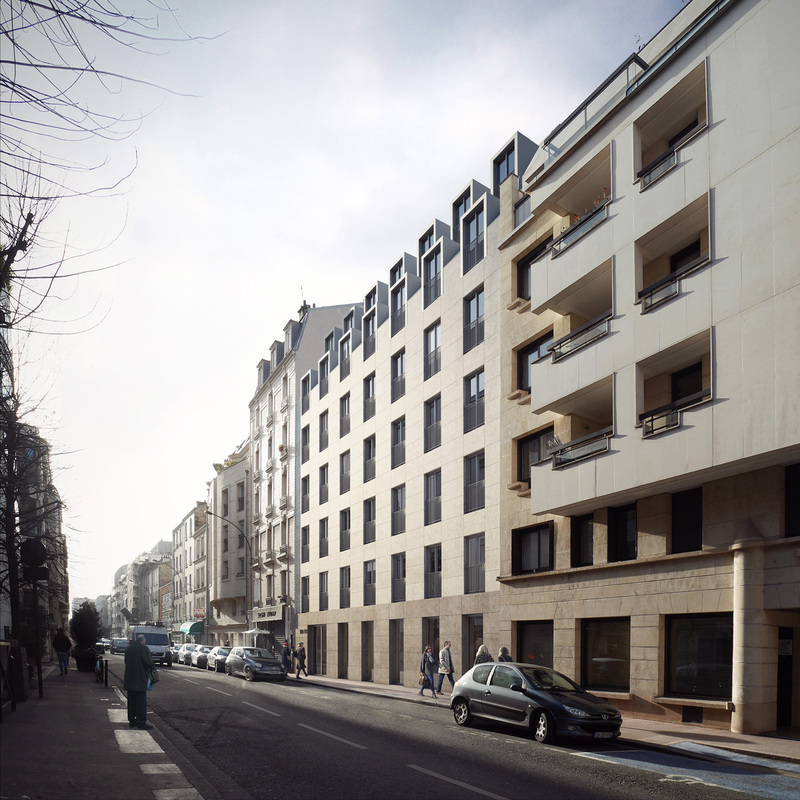 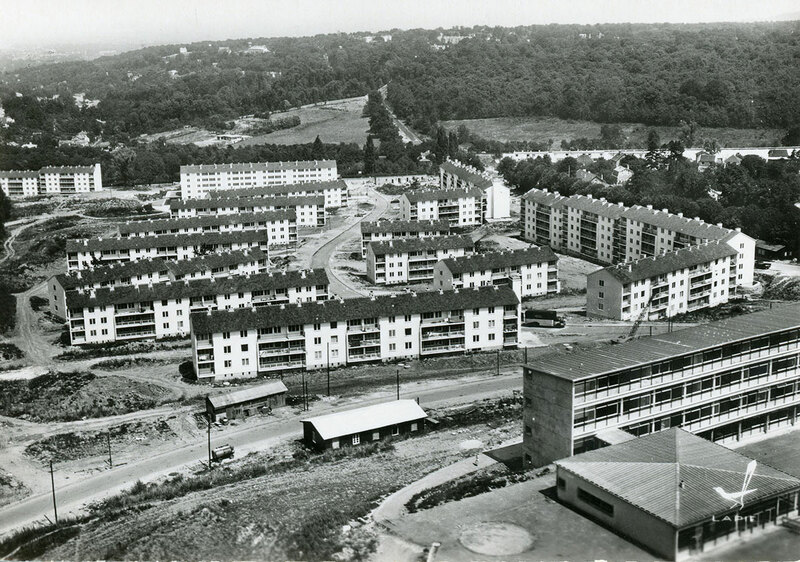 CONSTRUCTION OF A BUILDING OF 17 SOCIAL HOUSING UNITS WITH A WOOD STRUCTURE AND A HQE LABEL, LOCATED IN LEVALLOIS-PERRET. 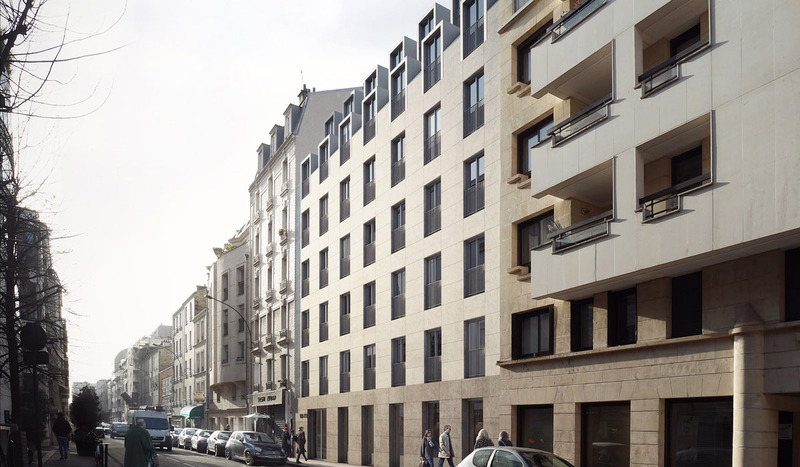 - the composition of elegant and durable stone façades. 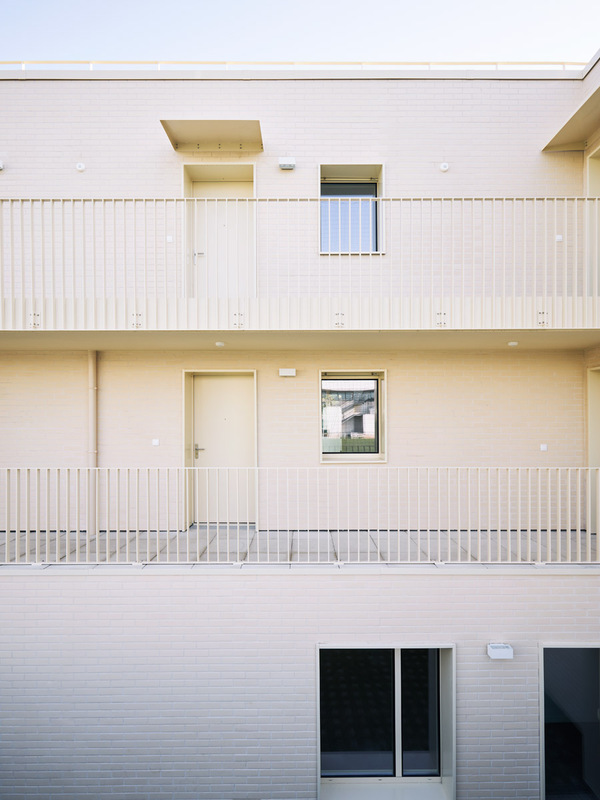 The building has six stories comprised of 17 apartments and their shared spaces. 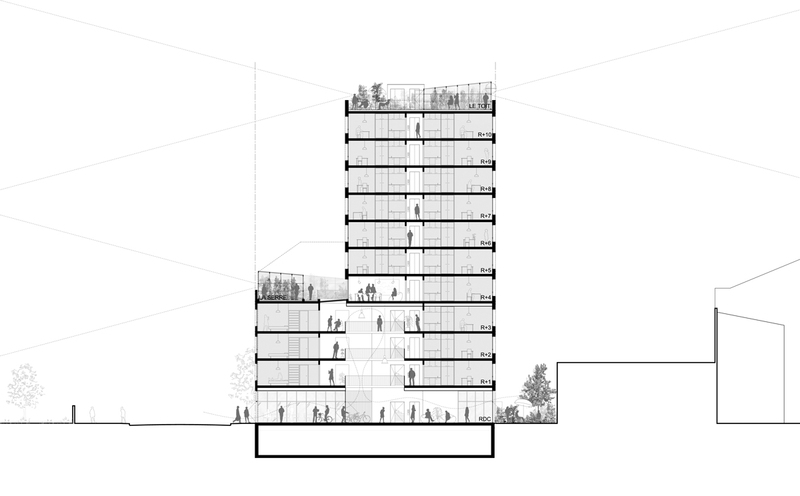 A compact volume, which composes almost the entire building, is aligned with the street. 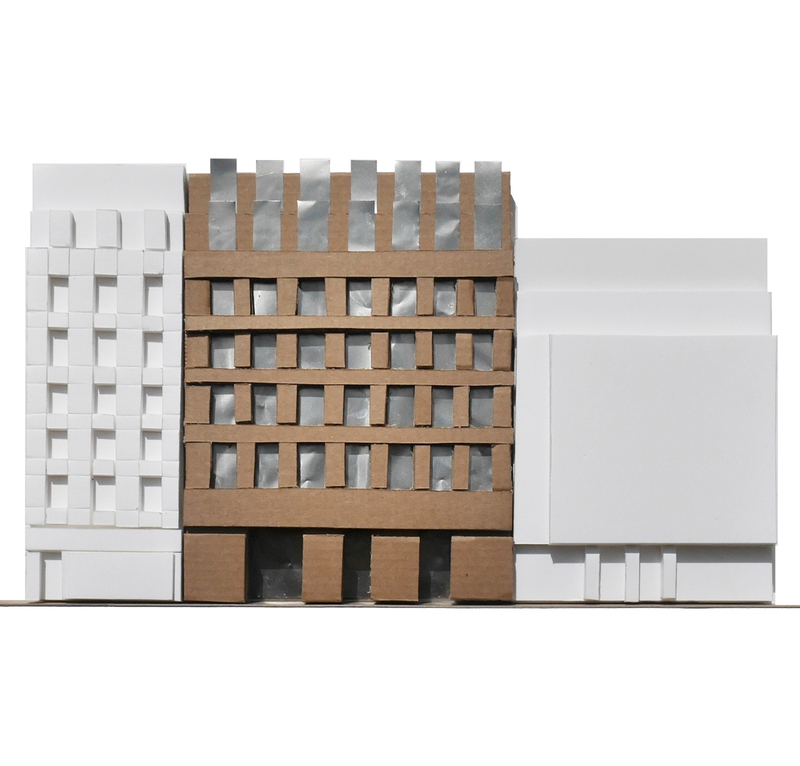 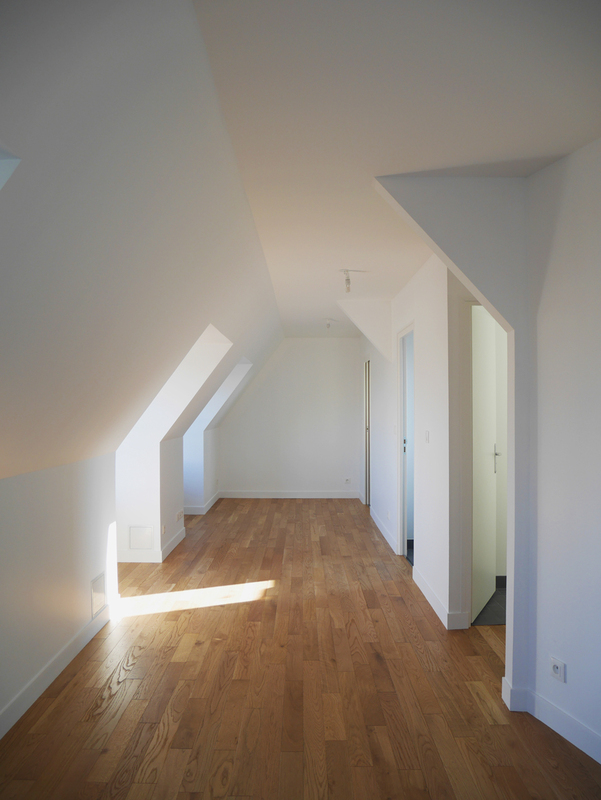 In the center, the volume of the rear façade is folded to connect it to the adjoining gable walls and making possible the insertion of a low perpendicular volume containing two apartments. 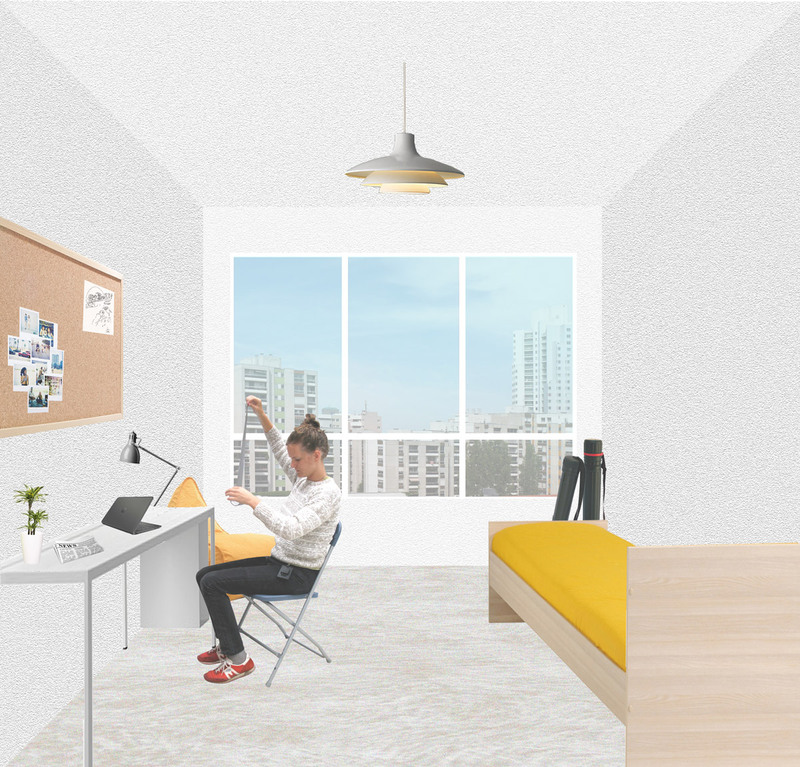 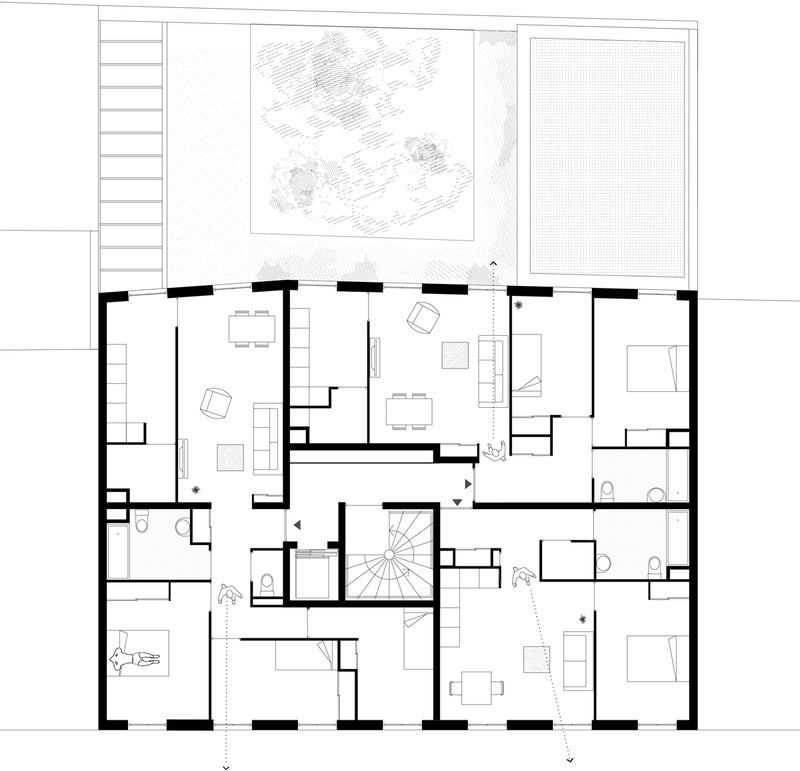 The response developed permits, through a rational placement, the creation of plans favoring the apartments’ comfort and the quality of the shared spaces. 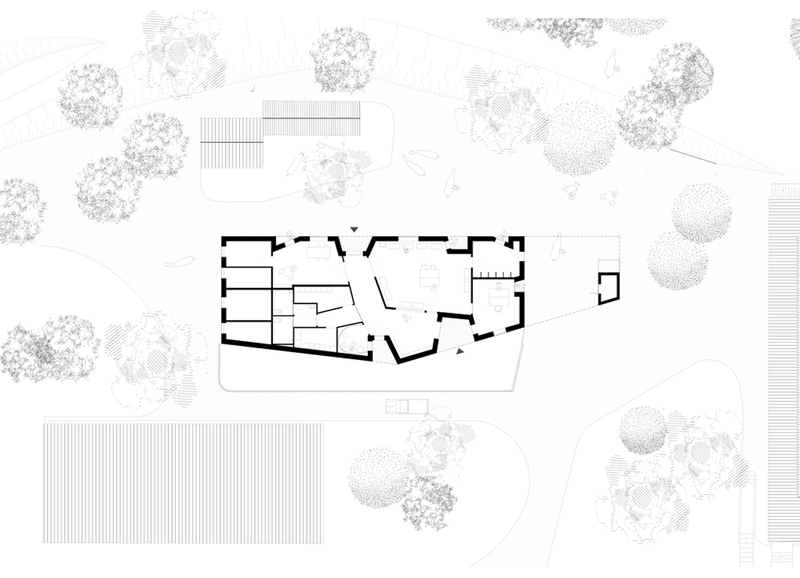 The uses, spatial qualities, the treatment of the thresholds and sequences between the public spaces and the “home” dictated our choices throughout the project’s development. 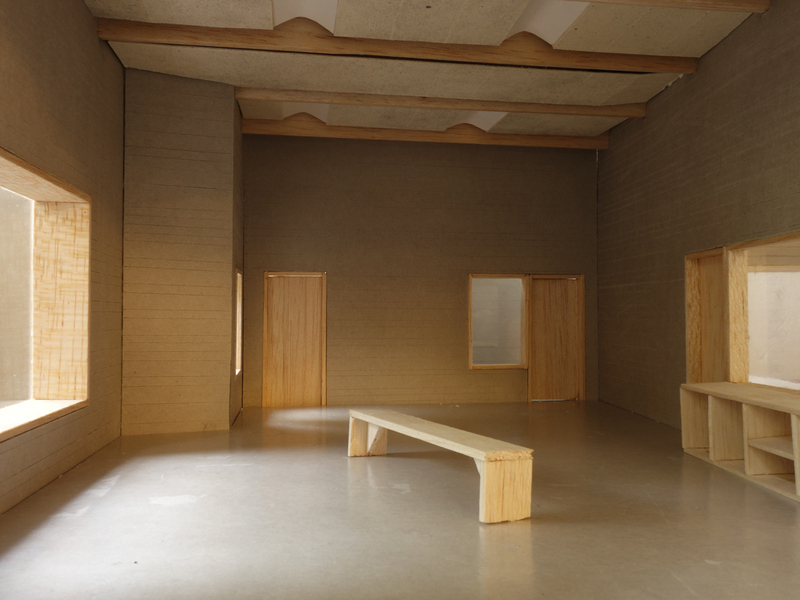 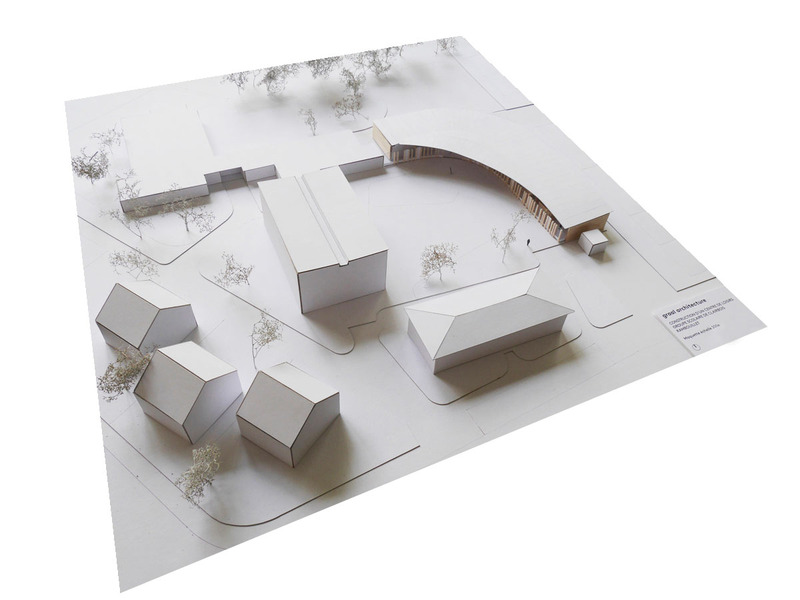 Located on a natural listed heritage site of several dozen hectares, the creation of the Gillevoisin pedagogical farm reflects a position on how to transform a simple building into a pedagogical tool for the treatment of psychological disorders. 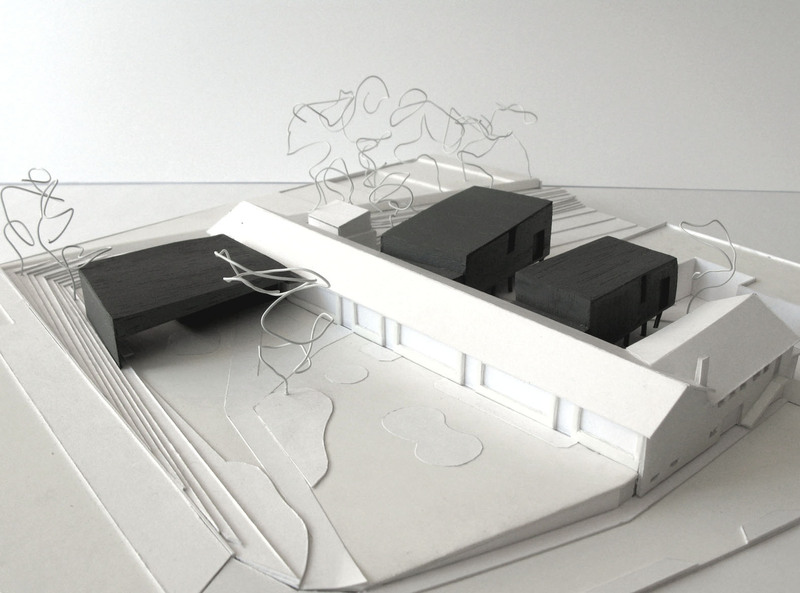 The principle selected consists in working based on the archetype of the farm as a sensorial and imaginary driver. 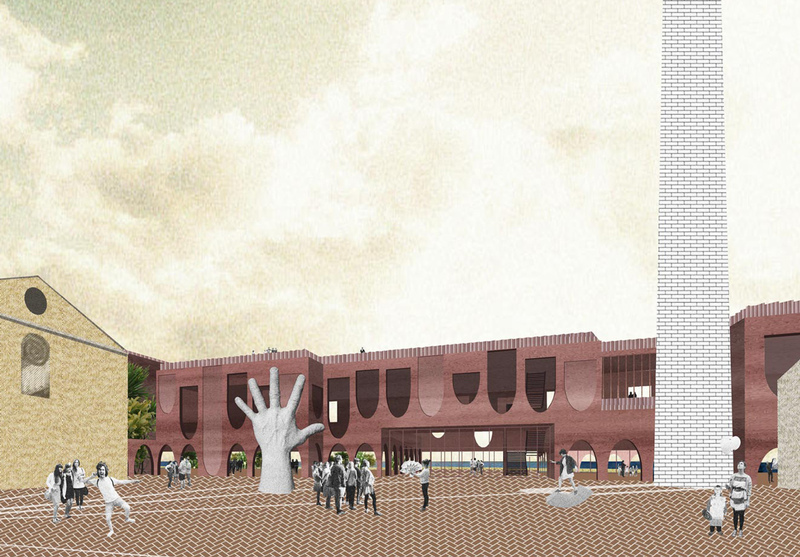 It deploys a contemporary architecture that takes its references from the local context. 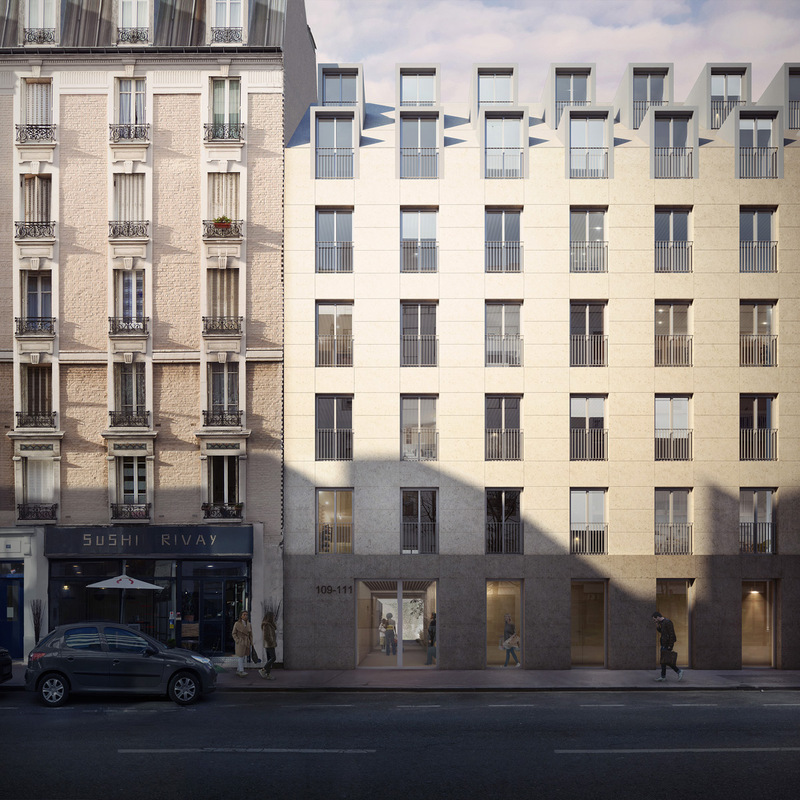 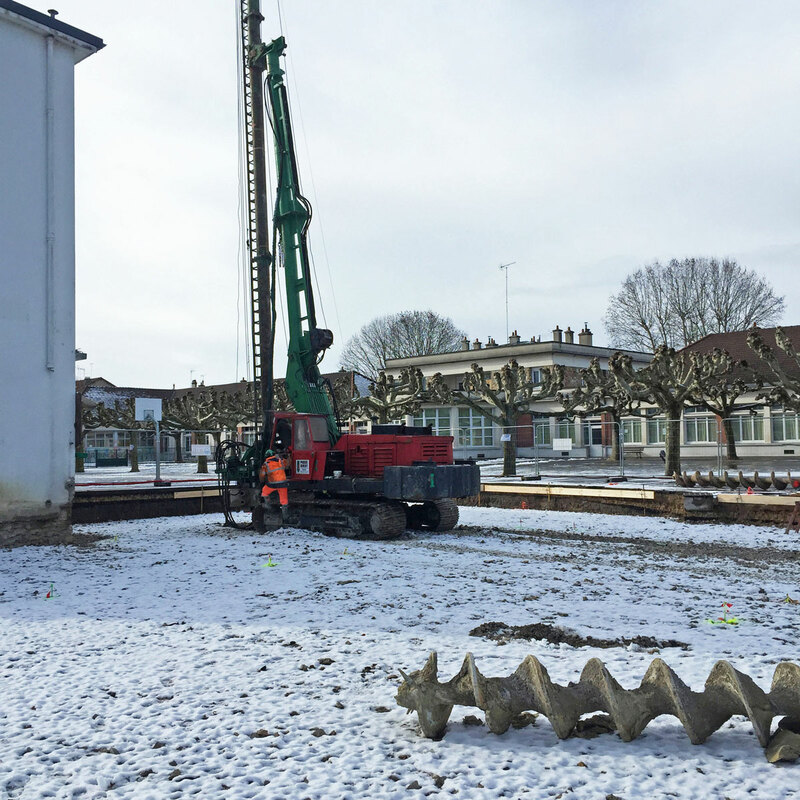 The uniformity of the whole and the treatment of the shell makes it possible to identify the building as a wood mass emerging from the ground. 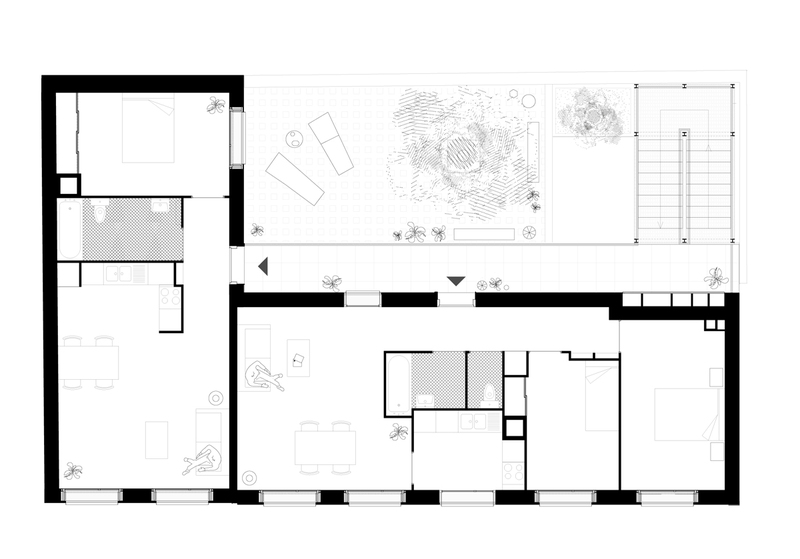 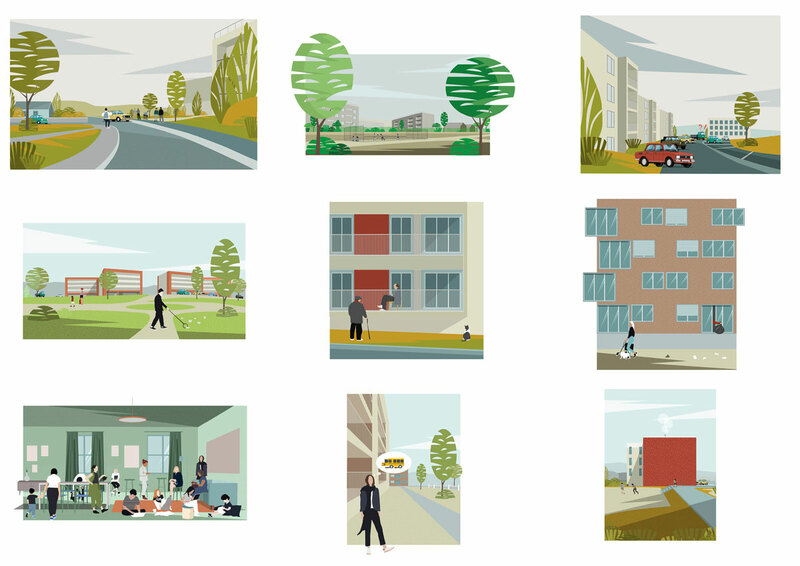 Without a precise layout plan it becomes by its nature a very powerful image in its context. 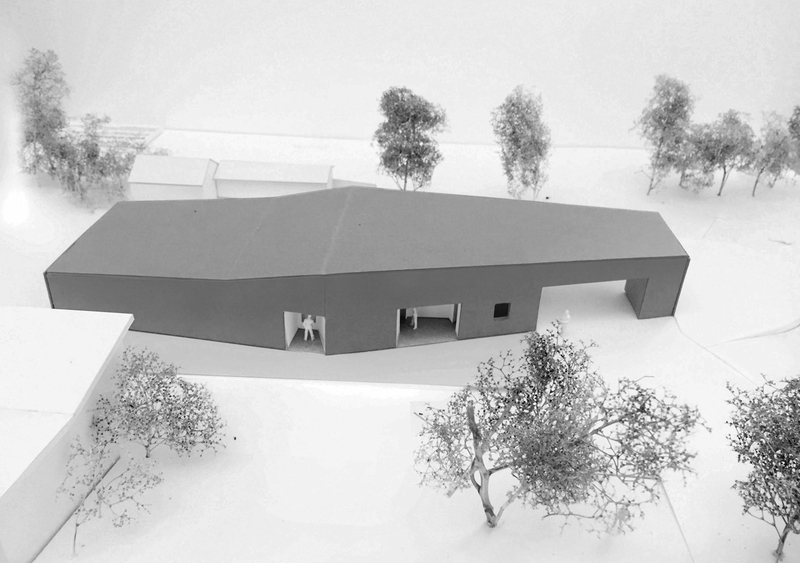 This mass is next hollowed out both to permit a sensitive dialogue with it surrounding environment and to allow for several types of appropriations. 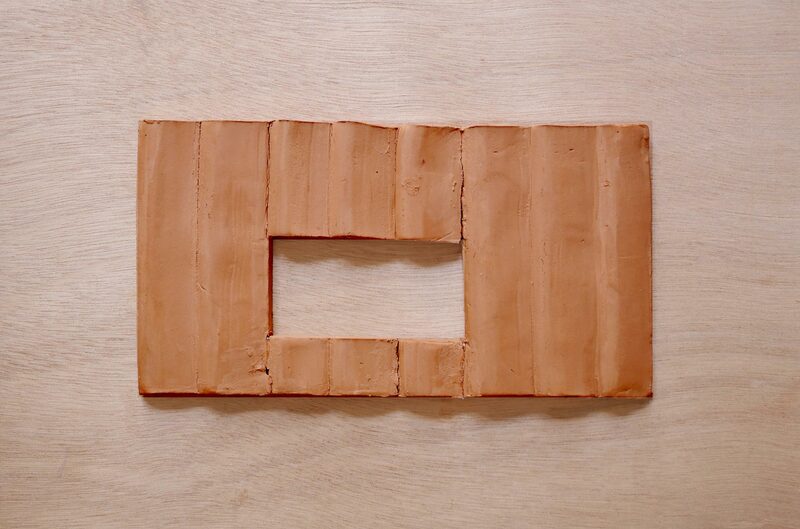 Something similar to what happens when, in a suitcase, more clothing than is possible is placed in it: the shell is deformed and the surface is placed under tension. 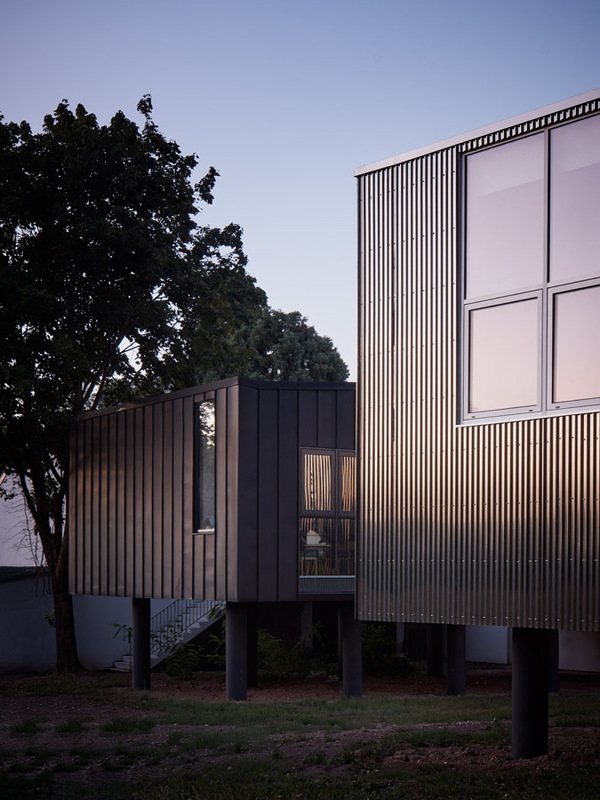 In order to create a dialogue while keeping its independence, the building’s shell is composed of waney-edge larch clapboard cladding that contrasts with birch CTBX panels for the treatment of the hollows. 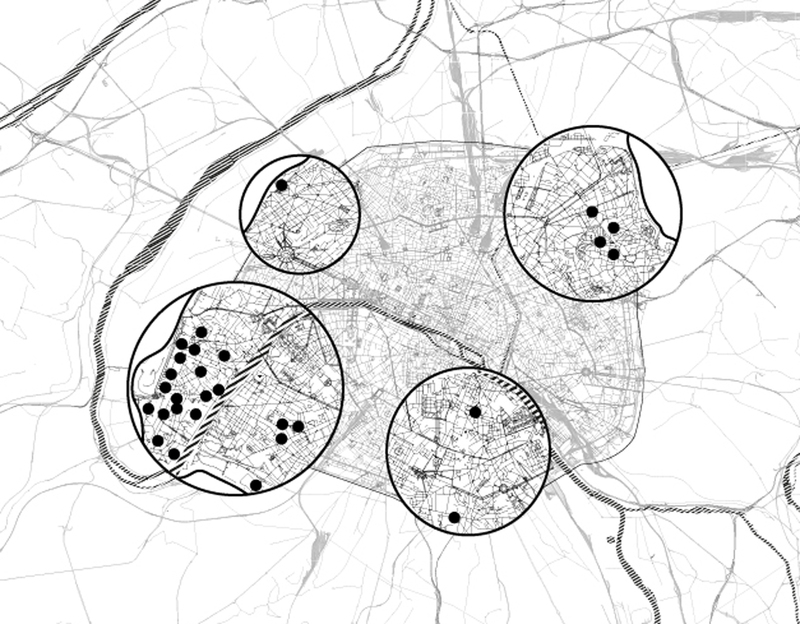 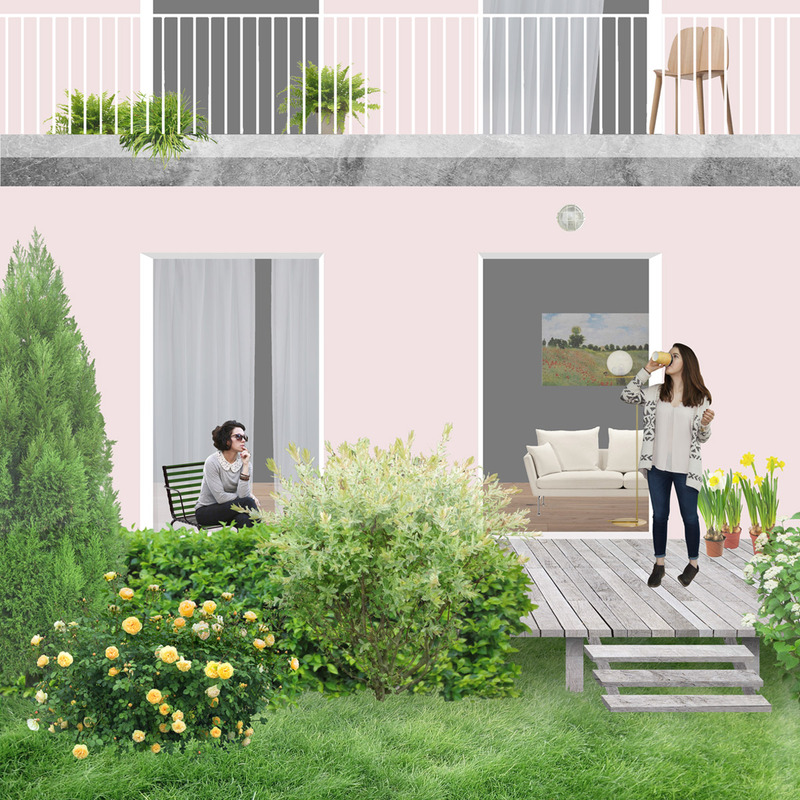 URBAN STUDY OF THE BUTTE-ROUGE GARDEN CITY IN CHATENAY-MALABRY IN THE FRAMEWORK OF ITS HERITAGE, SOCIAL AND ARCHITECTURAL PROMOTION. 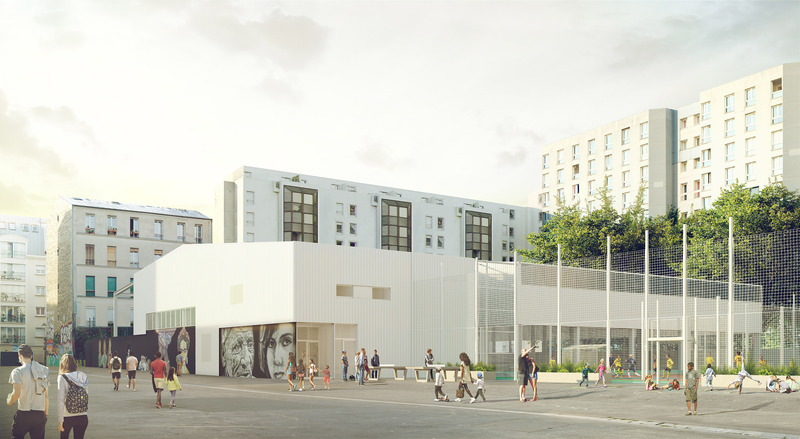 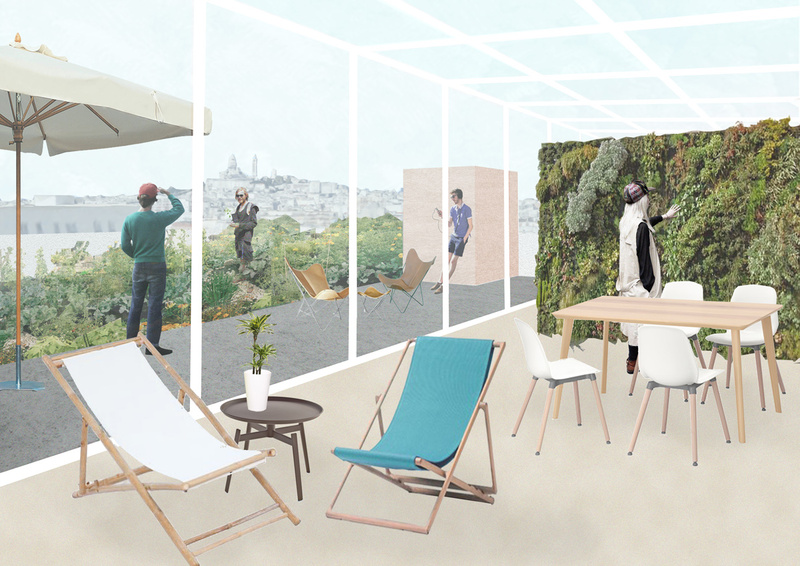 - identifying four project spaces (the Avenue space and its transepts, the plateau space, the hilly space, the forest space) that guide the transformations that are strategic for the future of Butte-Rouge in Grand Paris. 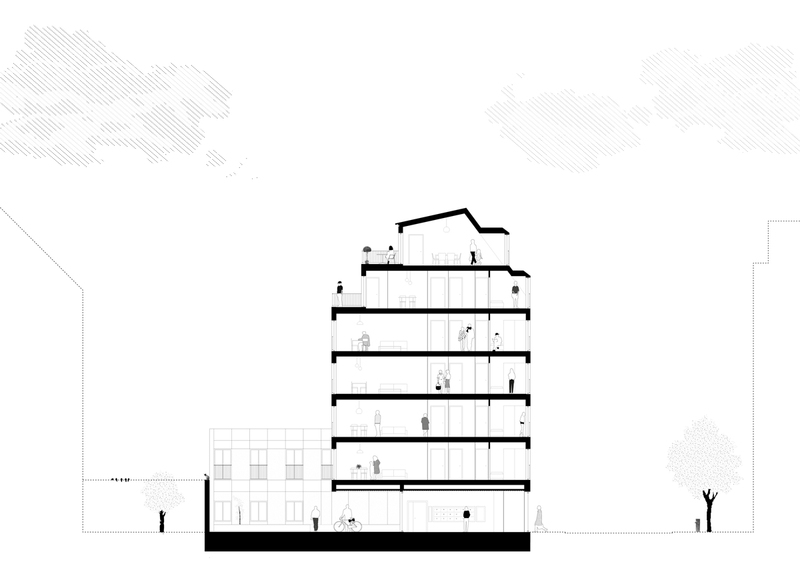 A strong social, typological and economic mix. 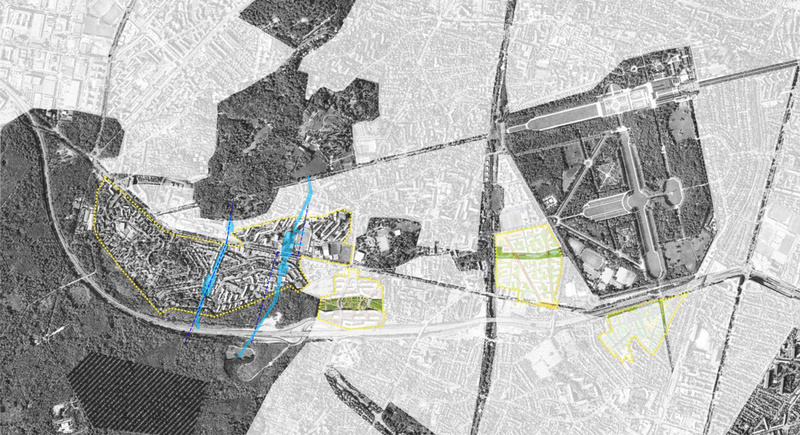 The master plan that results from it proposes creating around four strategic intervention zones new forms of inhabiting and working linked to programmatic and energy synergies. 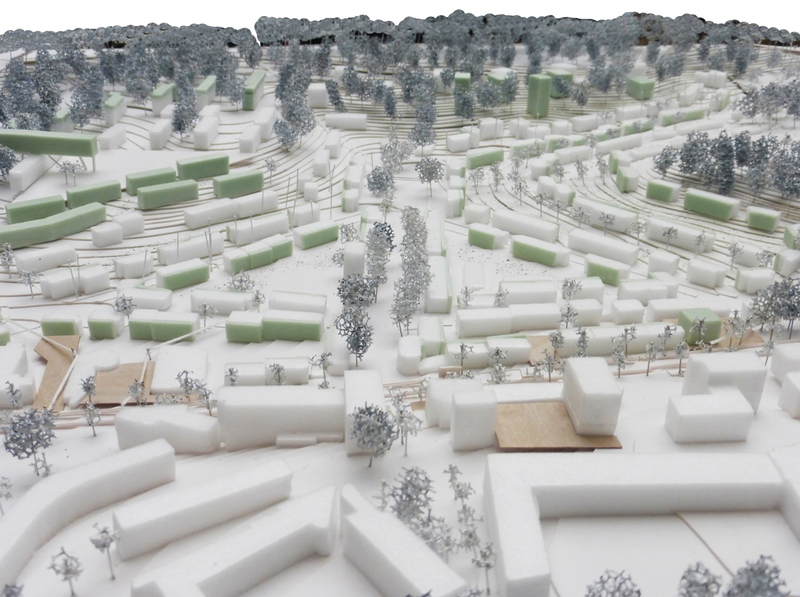 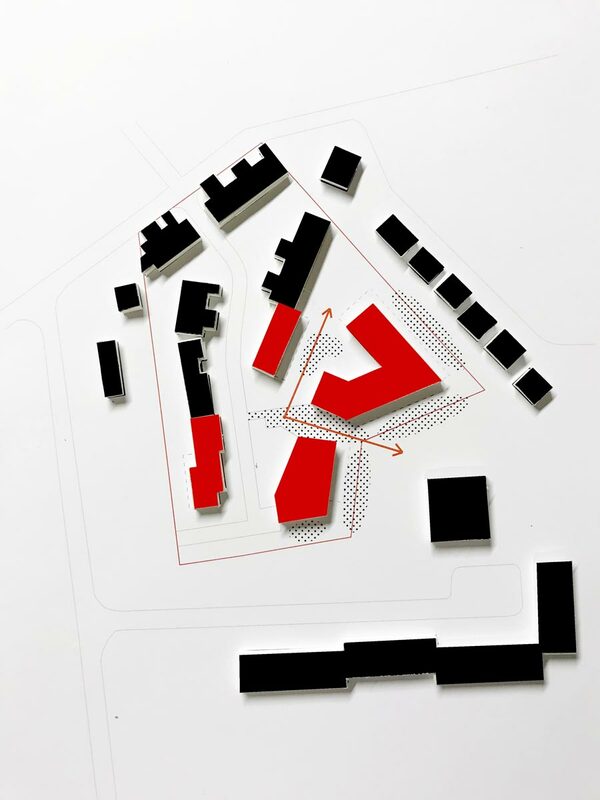 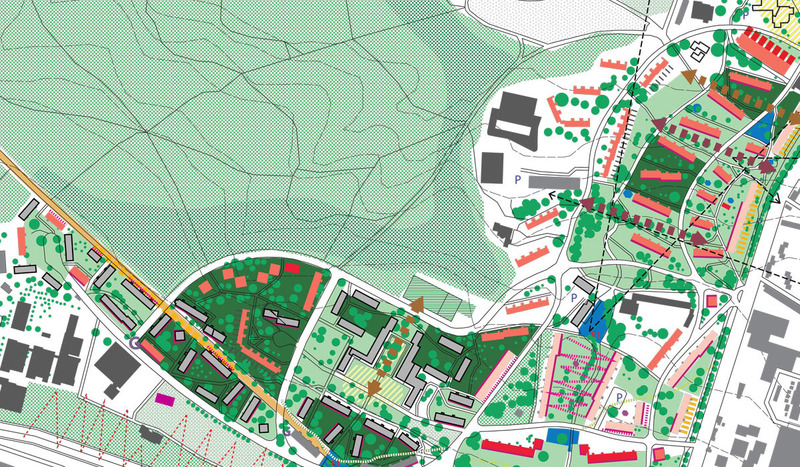 The improvement in the interaction of the housing units with the site’s landscape qualities and the topography becomes one of the major tracks of the project’s conception. 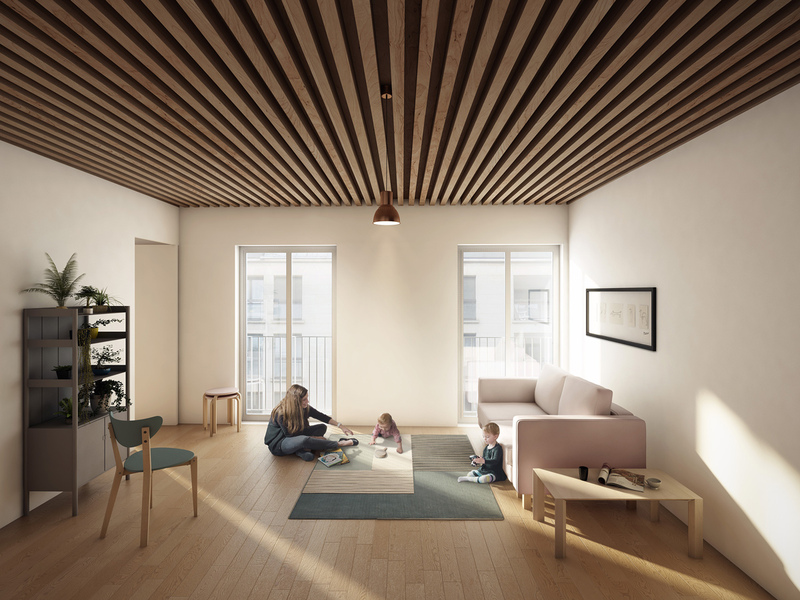 The strategic on the built heritage is based on the intrinsic qualities of Butte-Rouge with the aim of developing and diversifying its residential offering. 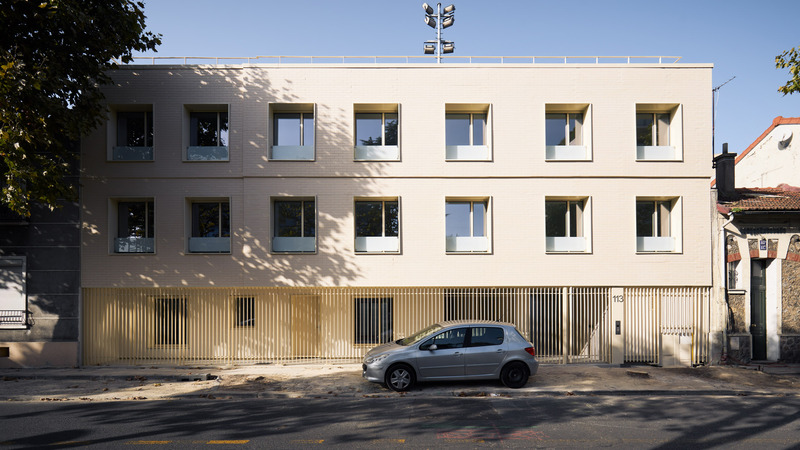 The densification and renovation of this built heritage then becomes a supporter of the interventions relying on the project’s synergies. 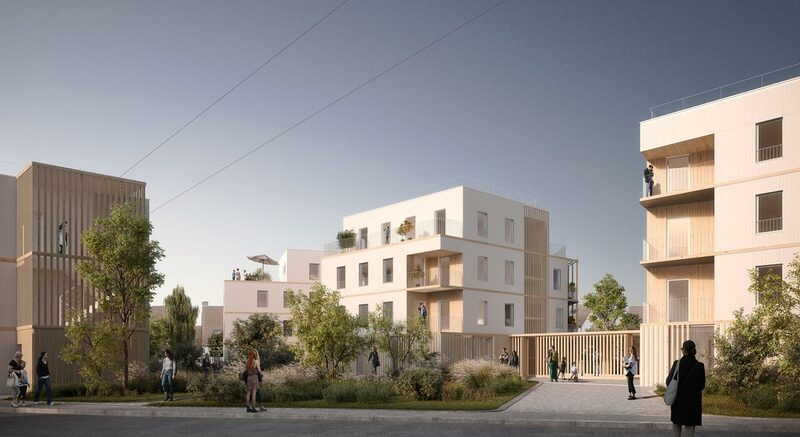 This vision incarnates an ecology of the project and ensures the virtuous transformation of the housing stock (about 4,500 units = 1/3 of the city). 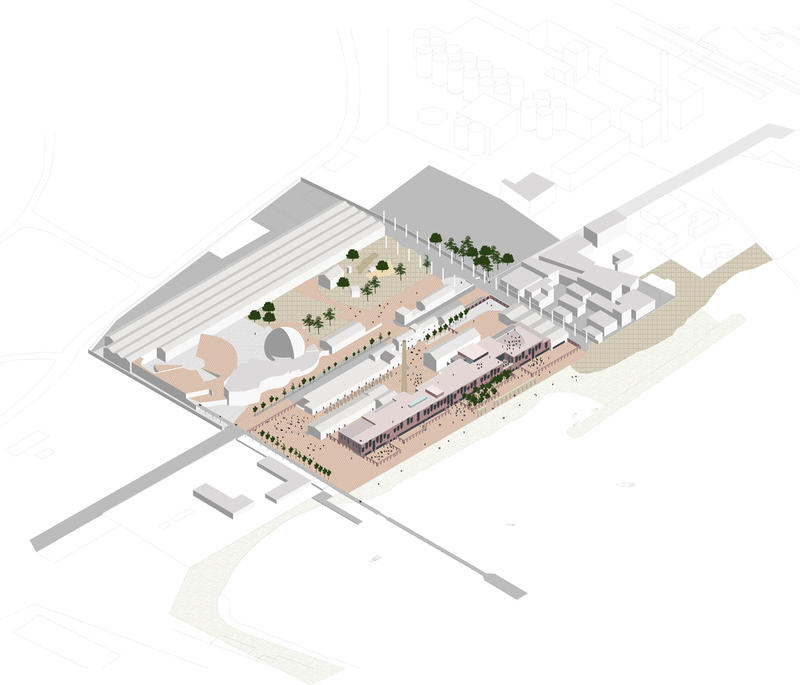 - Revealing the dual landscape and botanical dimension of the site. 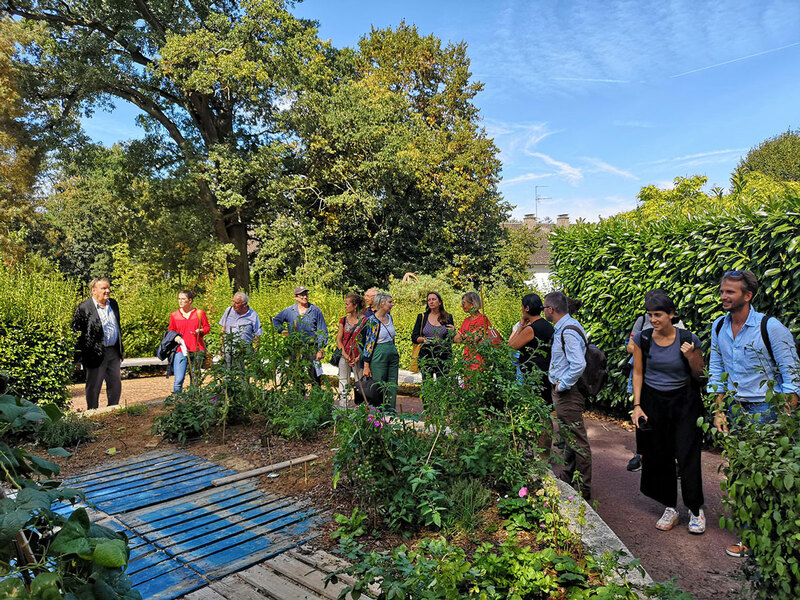 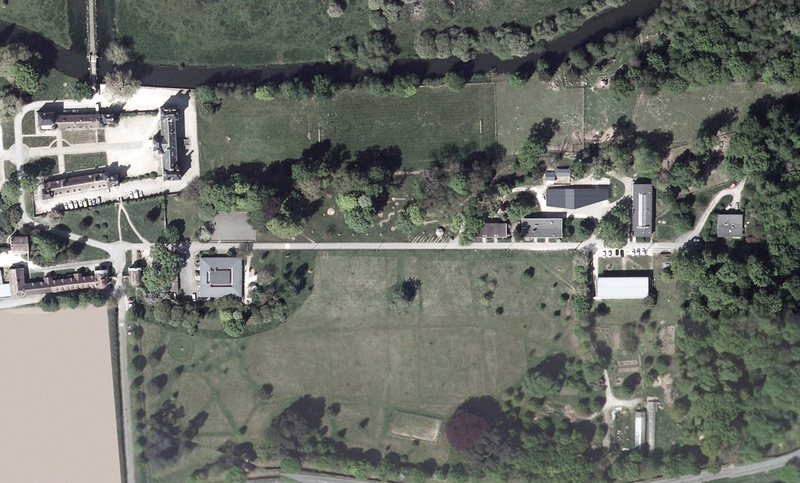 In the south, the listed wooded space becomes a public park, a clearing is naturally inserted in the “Chemin des Aulnes” of Verneuil-sur-Seine. 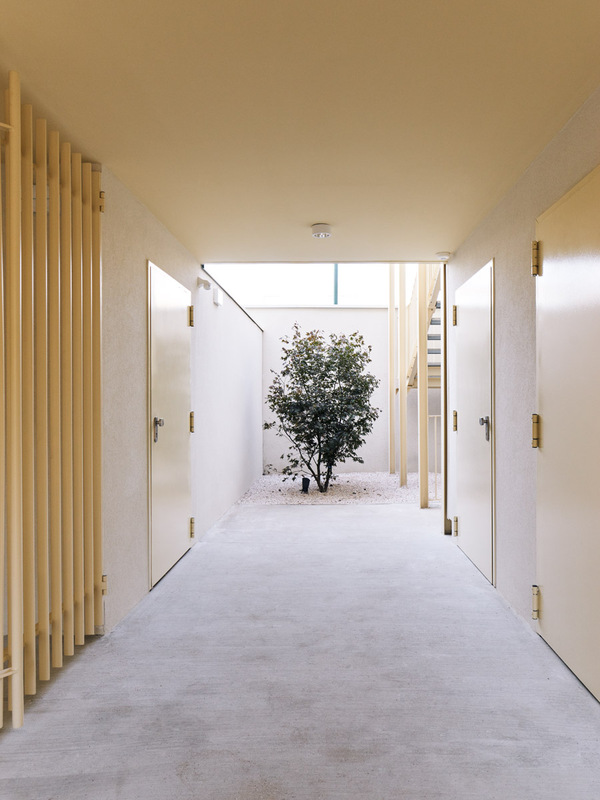 In the north, the private tree-lined walk is designed to strengthen the permeability dictated by the preexisting nature. 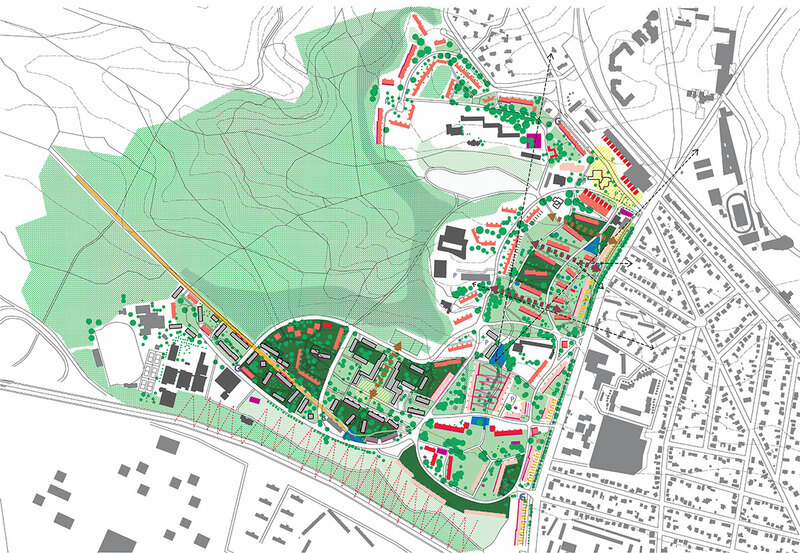 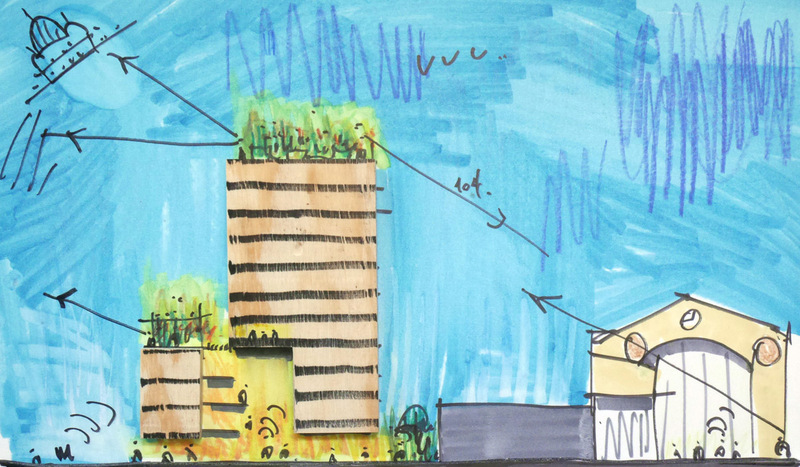 - Inserting the buildings between these two identifiable green spaces in order to offer a living environment between two parks. 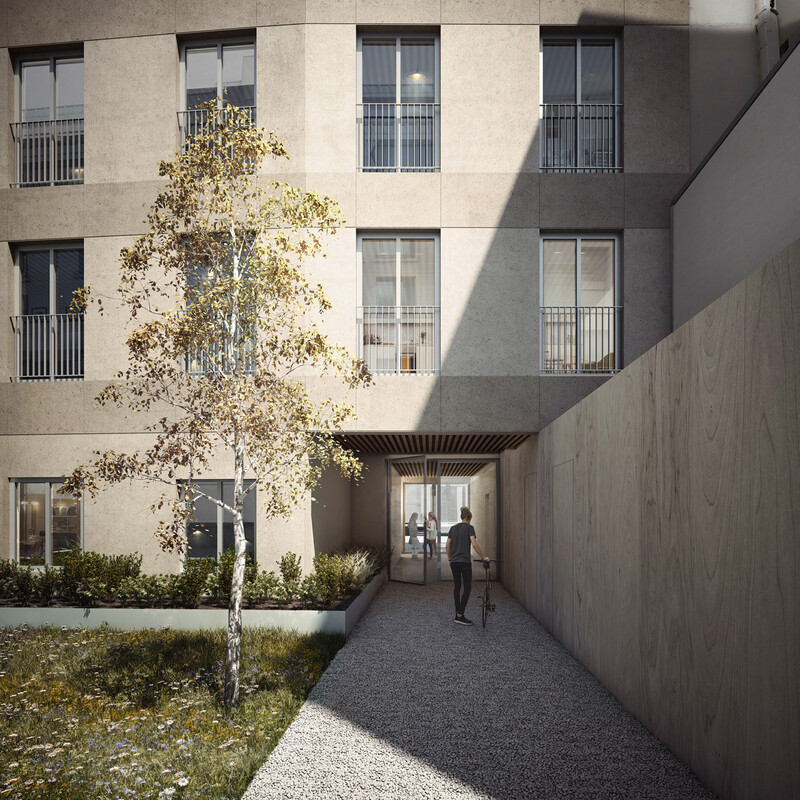 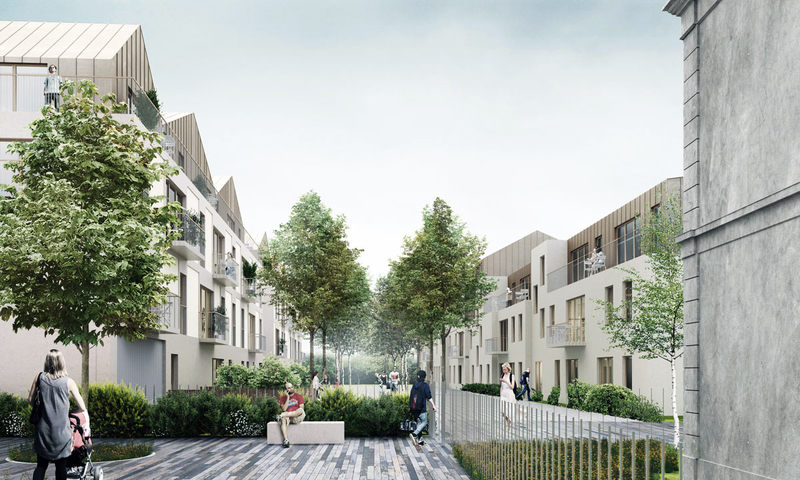 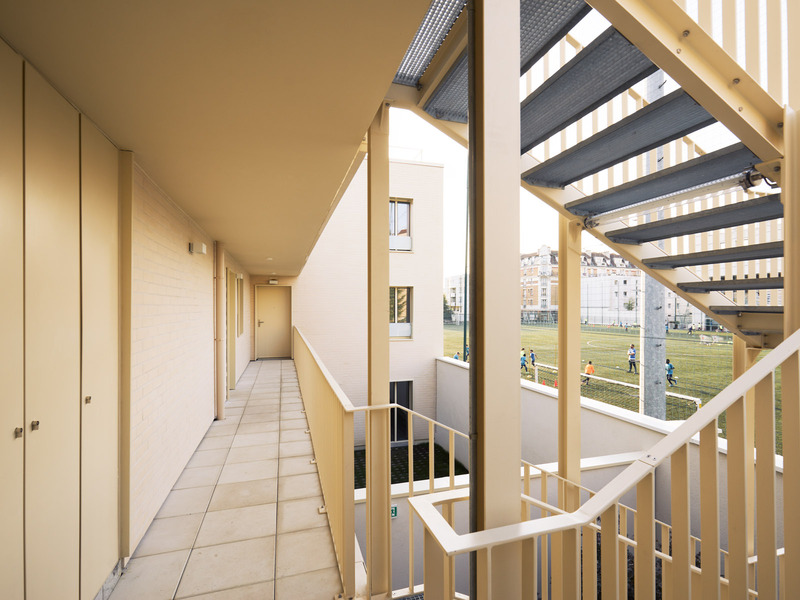 Each housing unit benefits from high-quality vegetation through gardens, terraces and balconies. 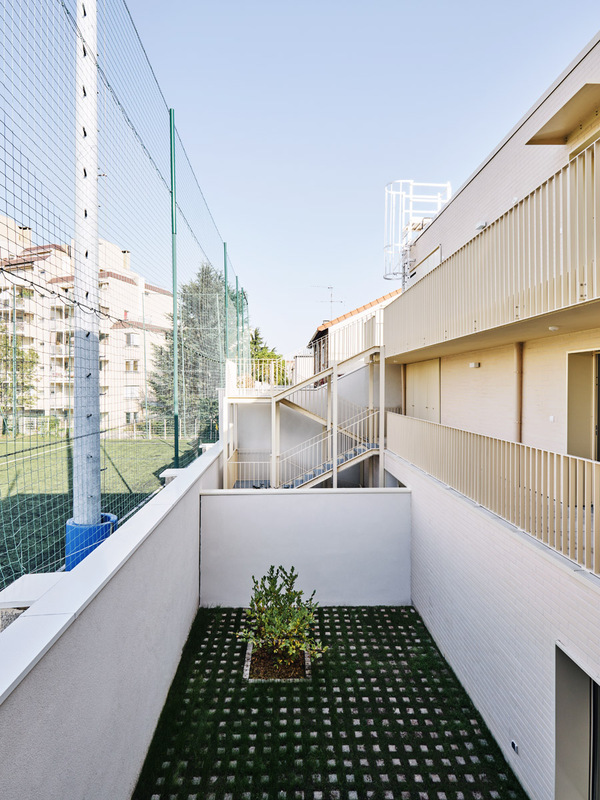 - Establishing an “urban threshold” through the enhancement of the built and natural elements in order to maintain the permanent usage of both the public and the private spaces. 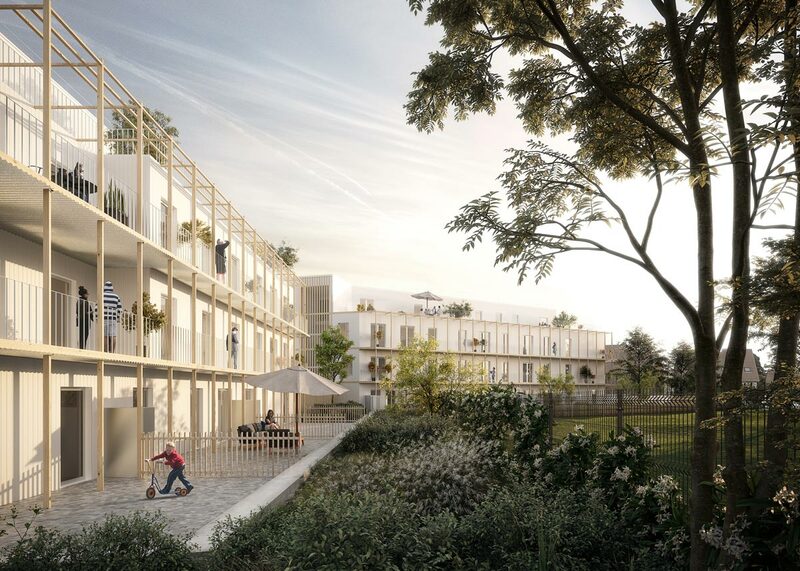 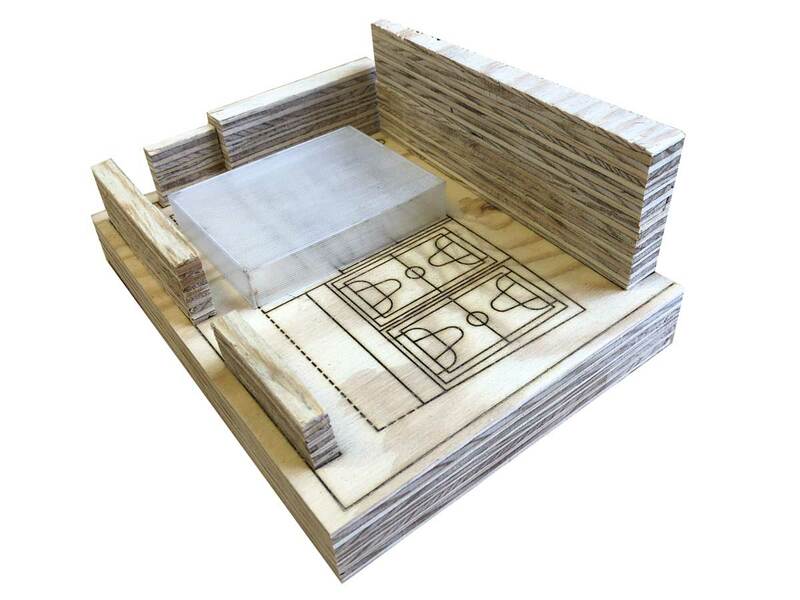 - Siting well-oriented, compact buildings that are well-designed in order to use all the principles of bioclimatic architecture associated with an optimum management of energy and resources. 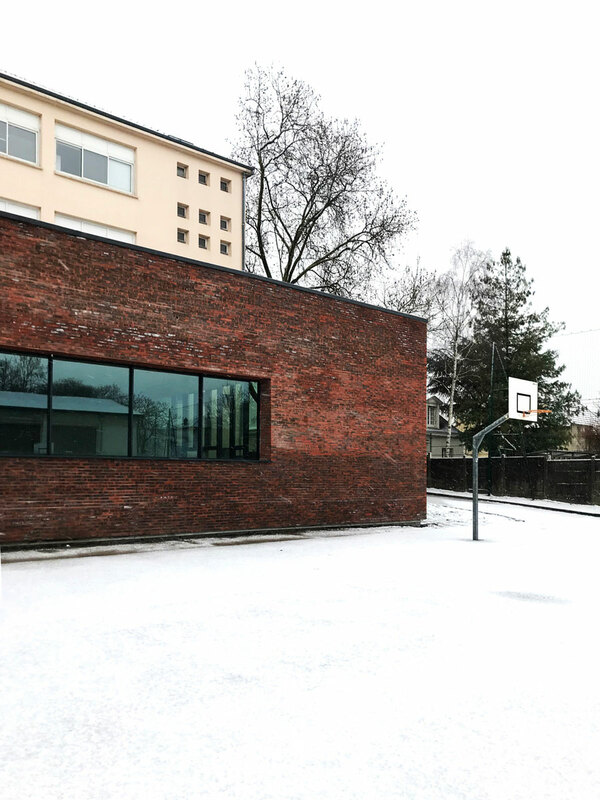 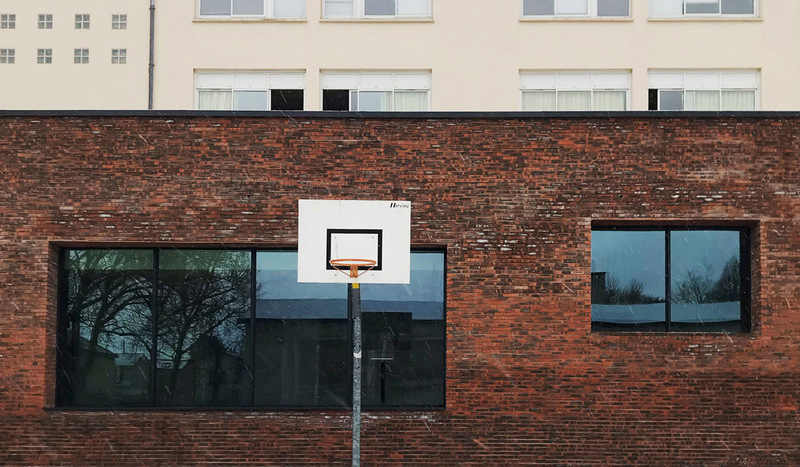 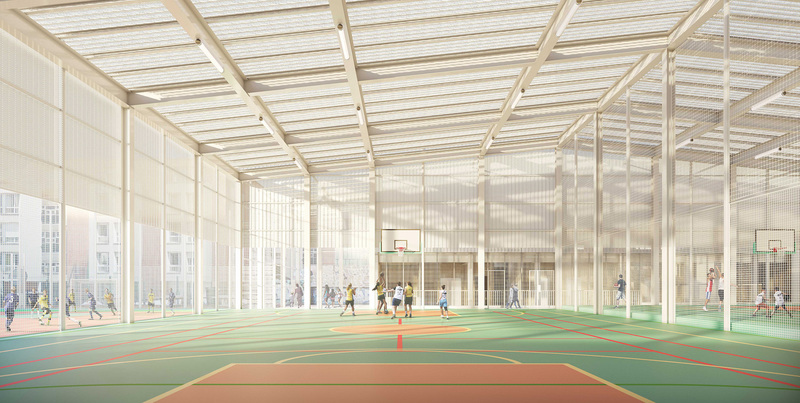 The project of building a leisure activity center in a school complex is based on the site’s advantages to enhance them: asserting the existing school’s identity by creating a curved volume to connect it to the current school lunchroom and in this way structuring the recess area. 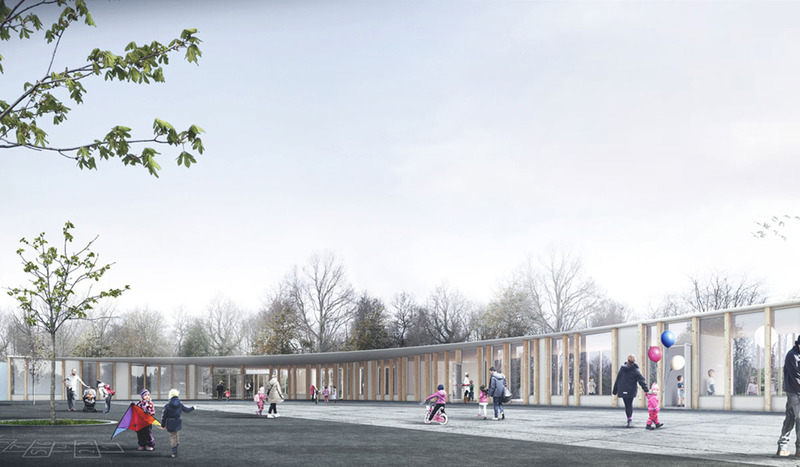 The new building is designed as a transparent element, a place of passage, in order to link the exterior and interior spaces with the landscape. 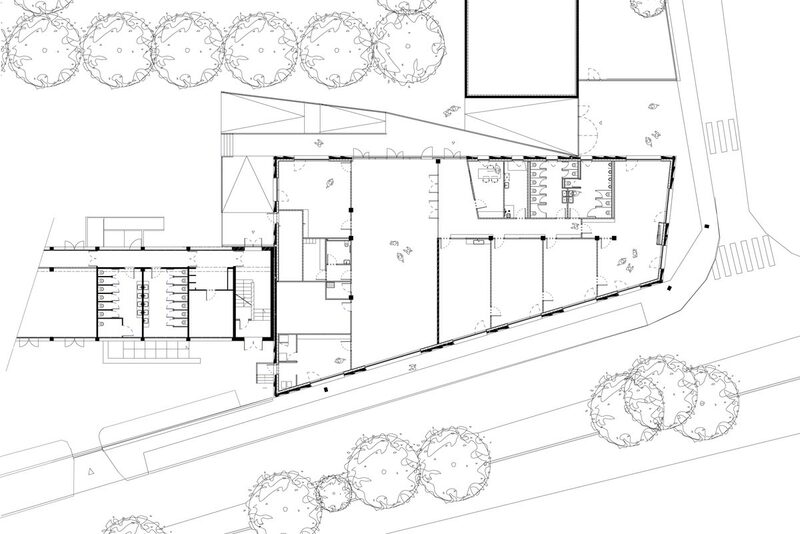 Its geometry makes it possible to create a shallow and very flexible building. 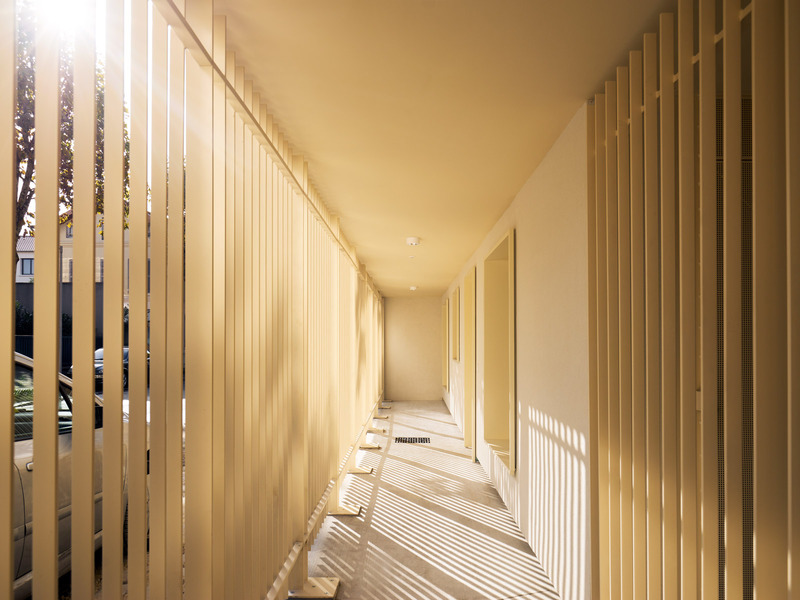 Comprised of structural wood elements and vertical wood brise-soleil, the new skin is uniformly rolled out all around the building permitting a variation of permeability between indoors and outdoors. 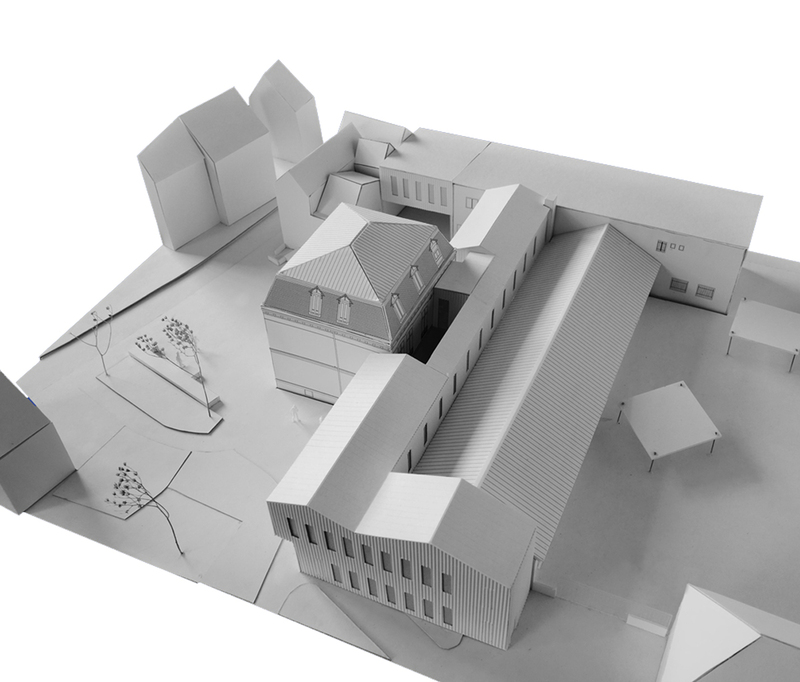 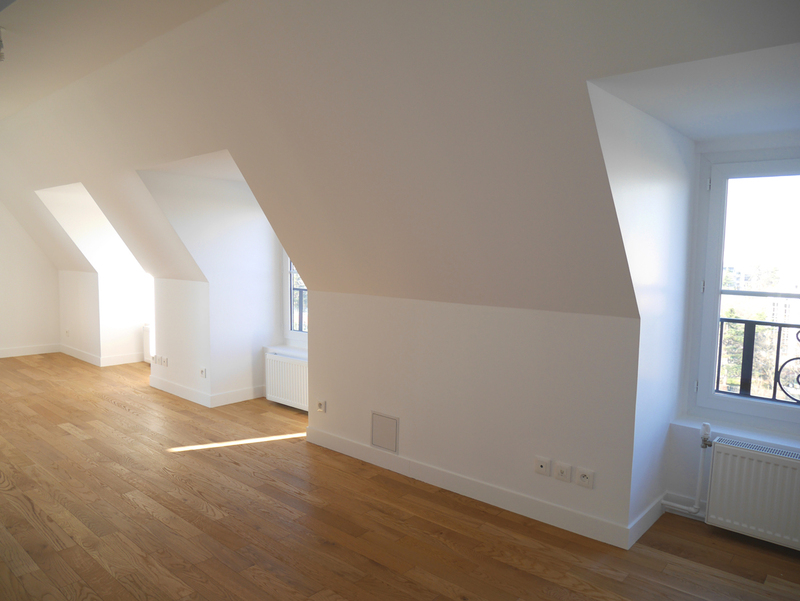 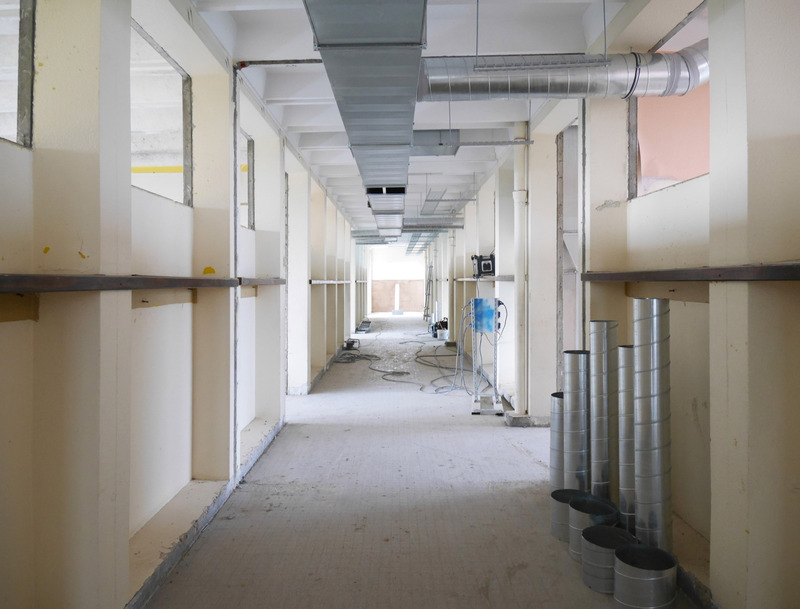 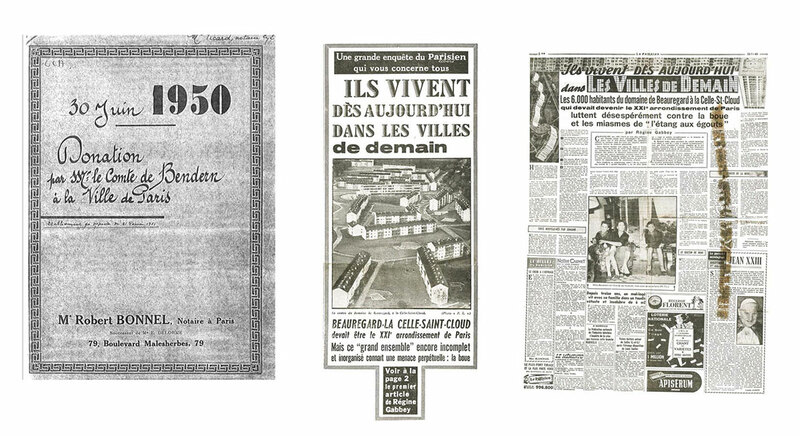 The challenge of these interventions consists in undertaking development and renovation operations of a heritage while proposing significant improvements in the inhabitability and comfort of the housing units with constraints most often located on the upper floors. 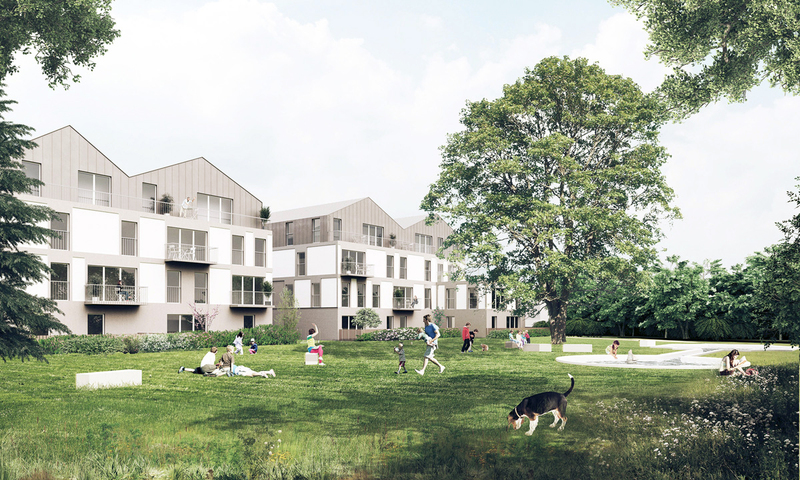 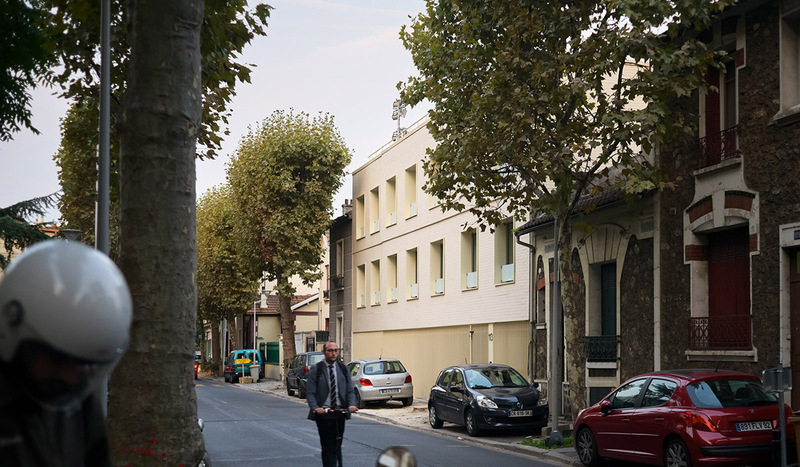 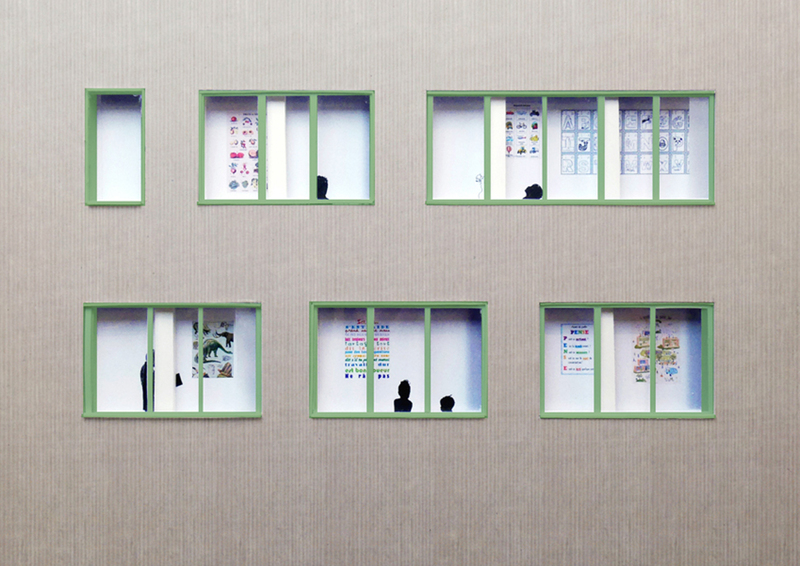 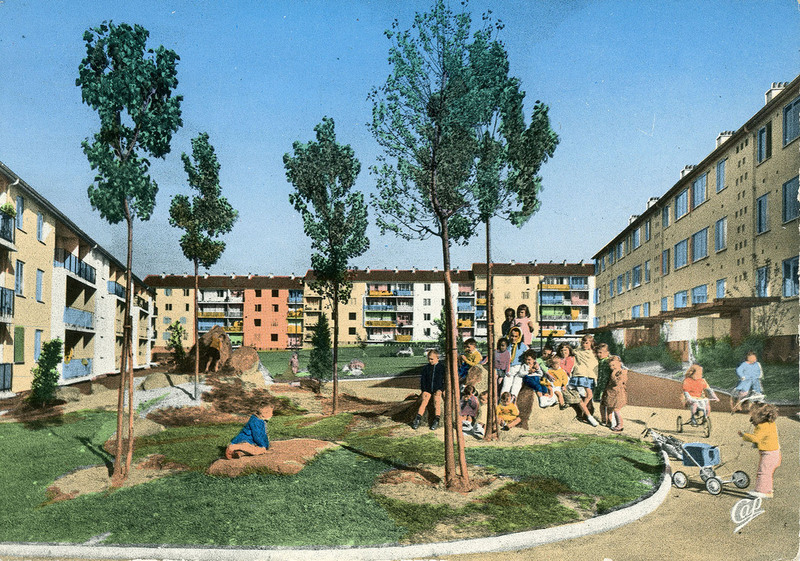 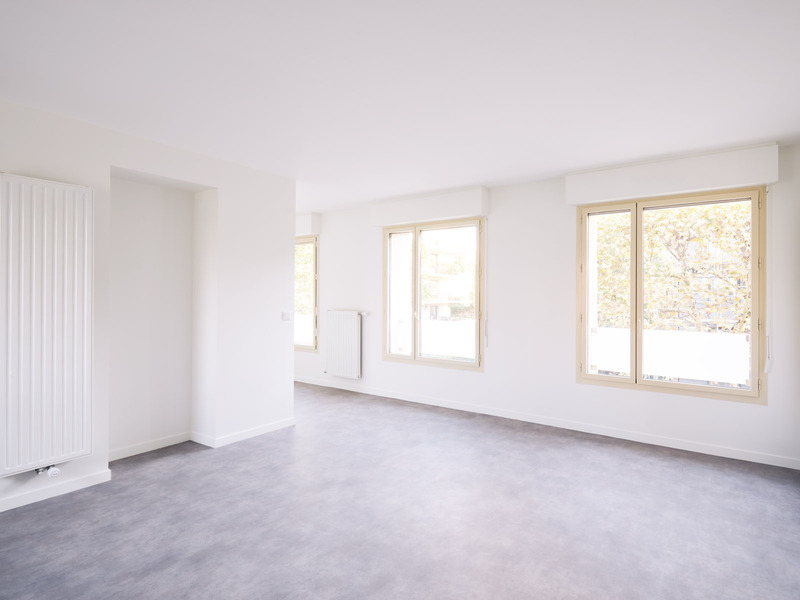 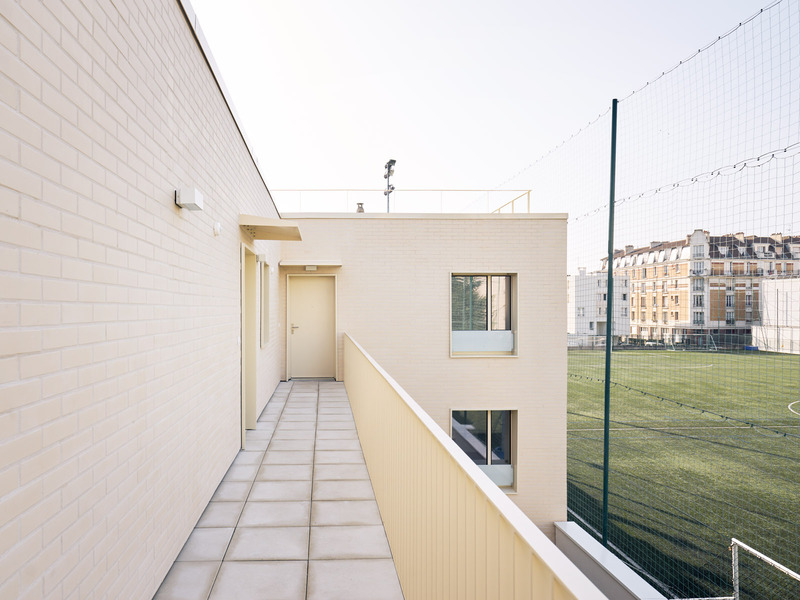 The grouping or total renovation of these apartments to the benefit of their inhabitants offers the possibility of durably and qualitatively reworking these social housing units by meeting today’s needs and leading them toward a positive approach to envisage transforming their living environment. 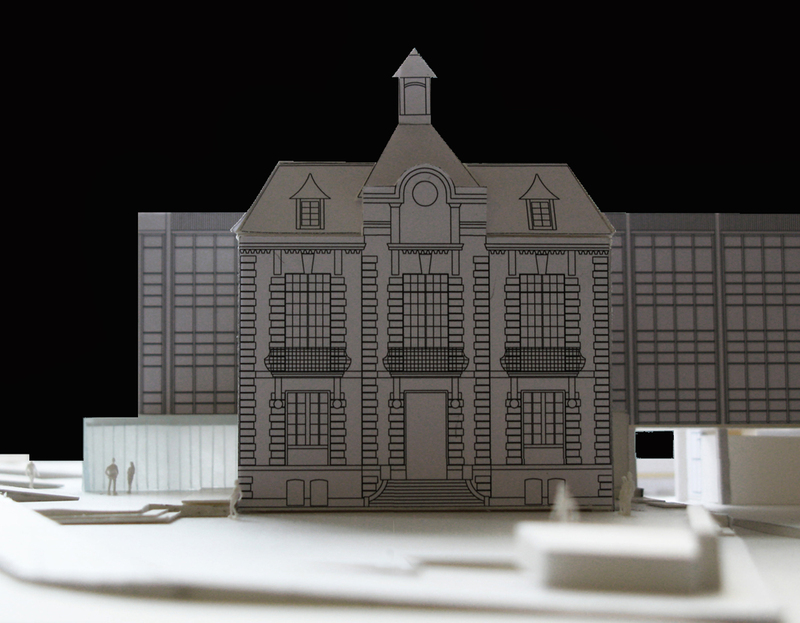 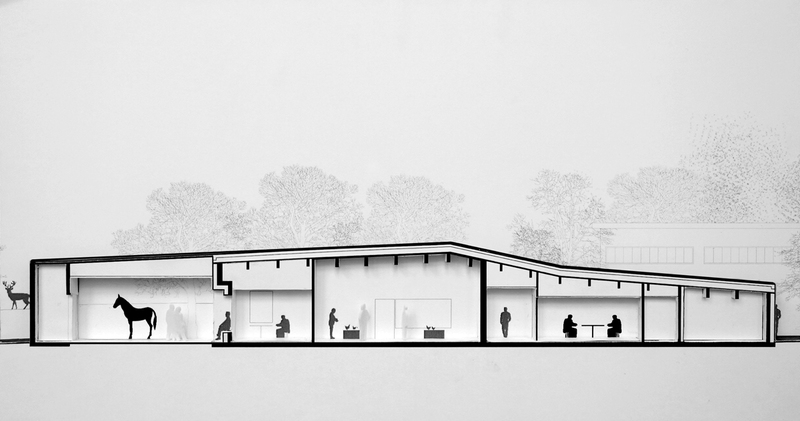 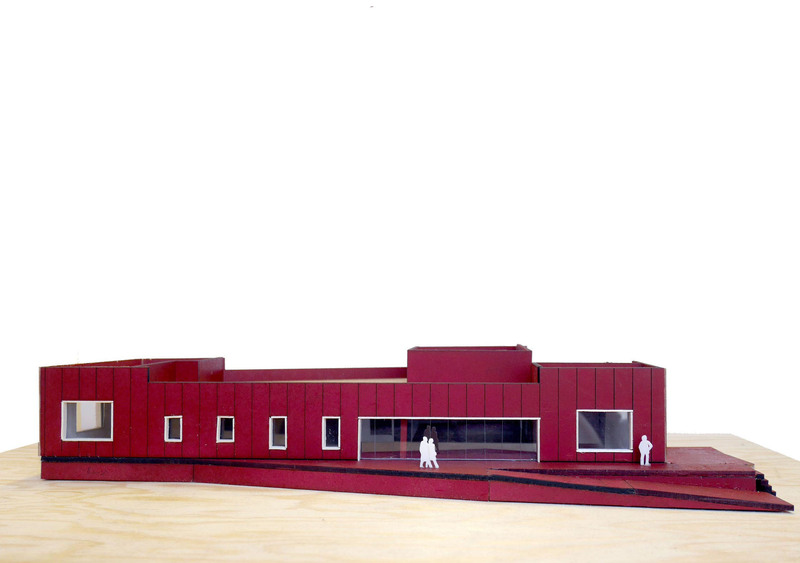 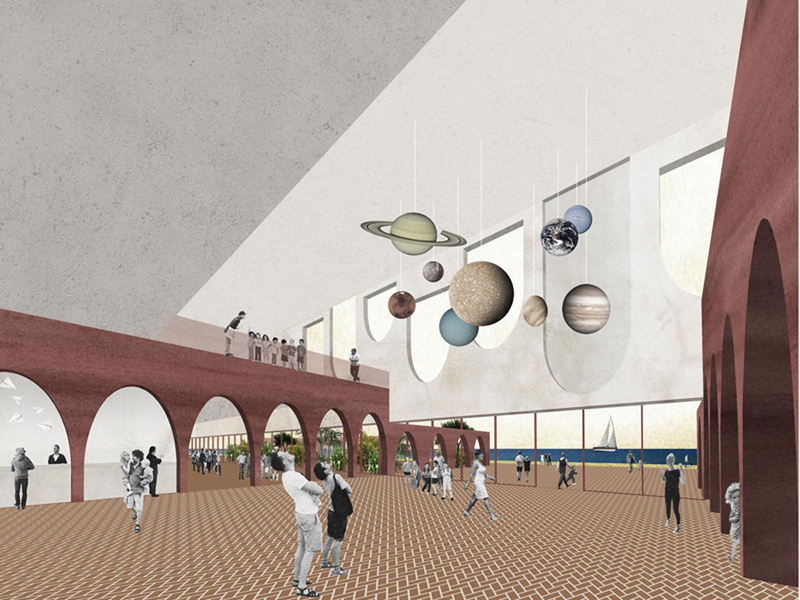 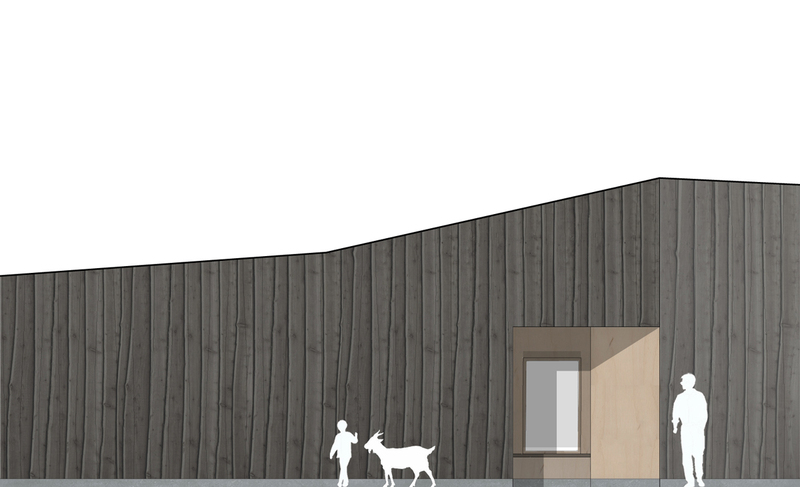 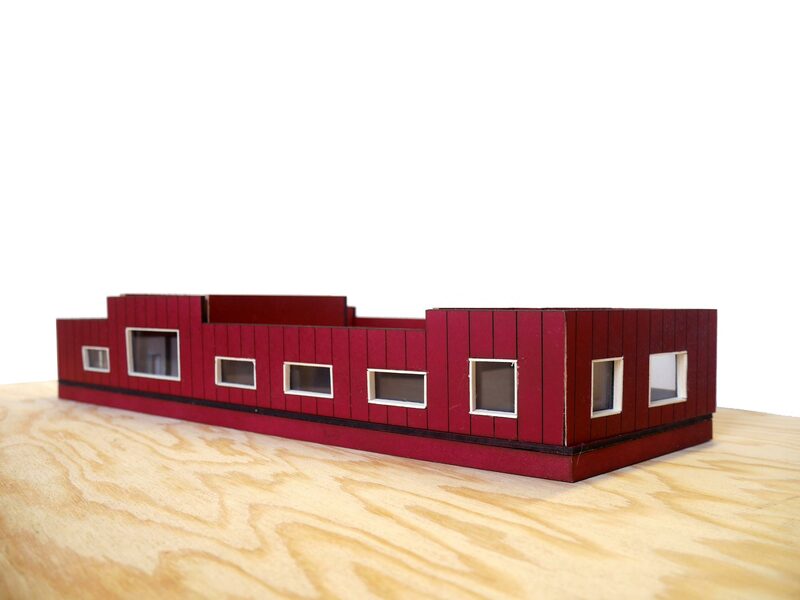 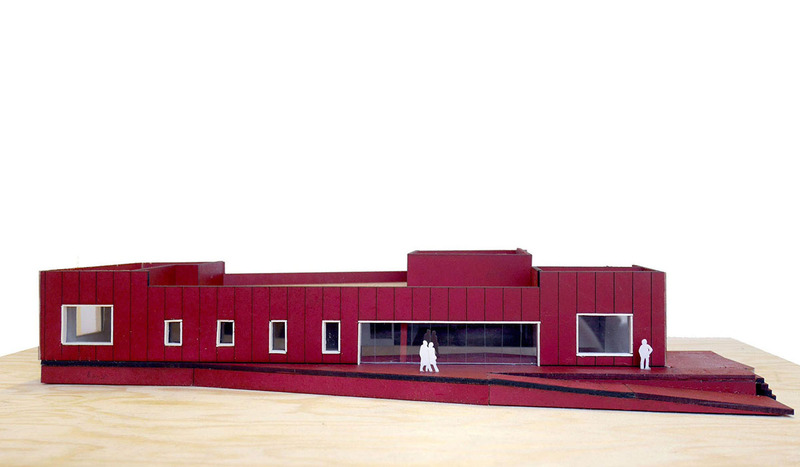 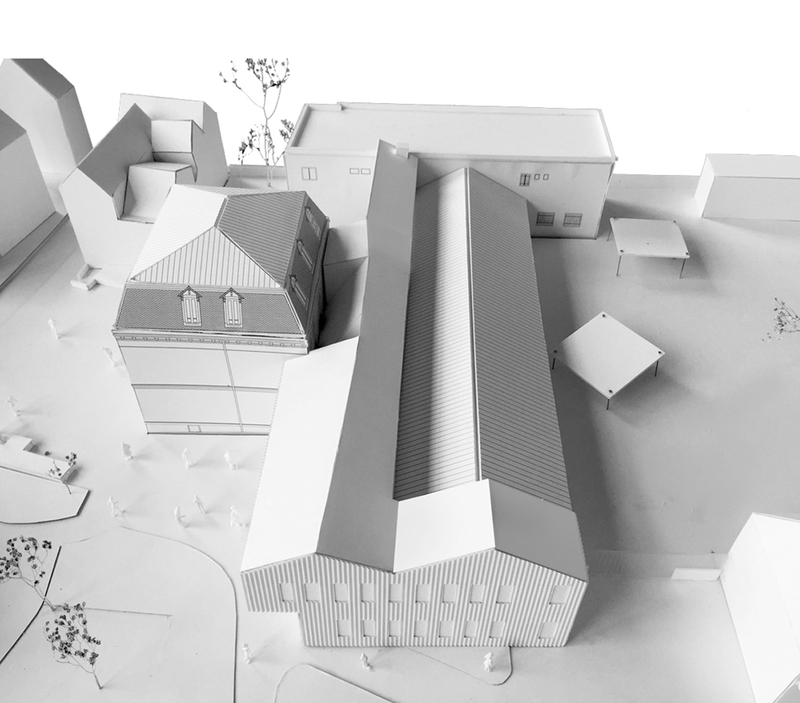 The project aims at making the entire town hall, comprised of two distinct buildings, accessible. 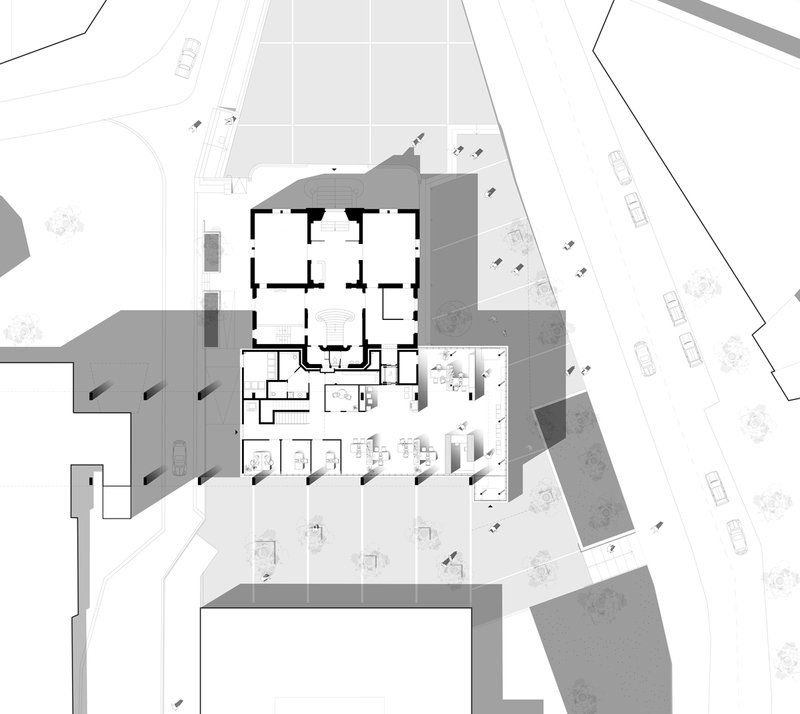 The project’s intention is to design an extension on the ground floor to replace the existing parking area on the same level of the administration building and a new vertical circulation in order to install an elevator connecting the two buildings in a staggered arrangement. 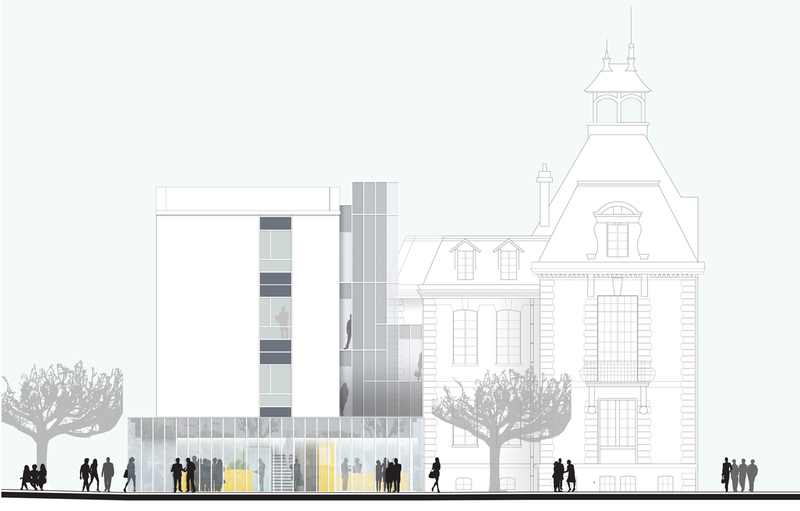 The silk-screened glass materiality of the new built masses creates a neutral dialogue between the existing town hall and the 1970s administrative building.